Dedicated to every Soldier of the Indian Armed Forces. 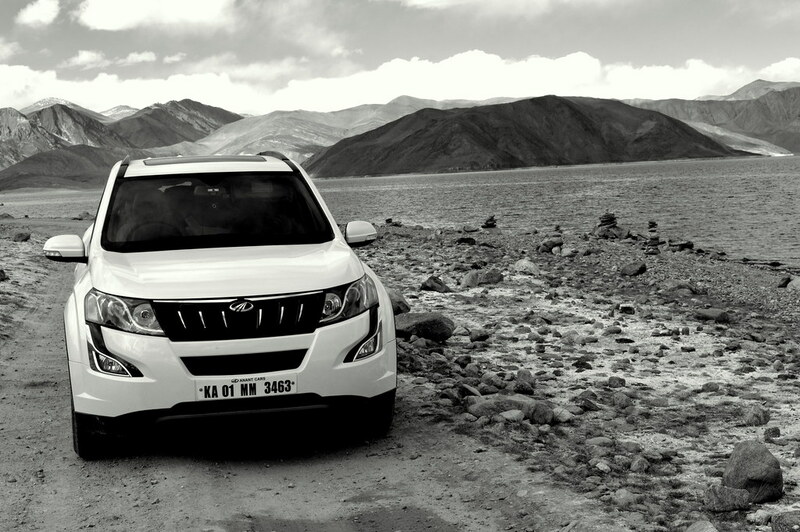 All journeys have secret destinations of which the traveler is unaware! 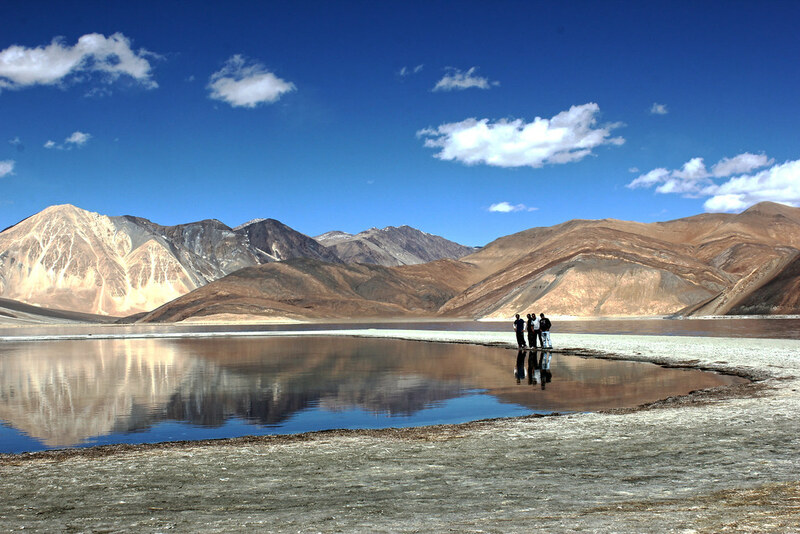 Ladakh is among those places on this planet where the journey is the destination in itself. 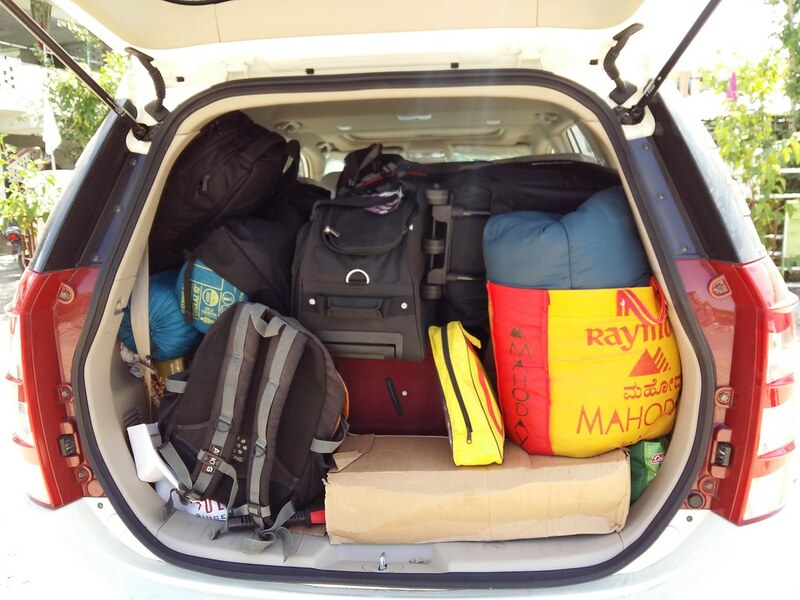 18 Years later, We felt the need for a 7 seater SUV. 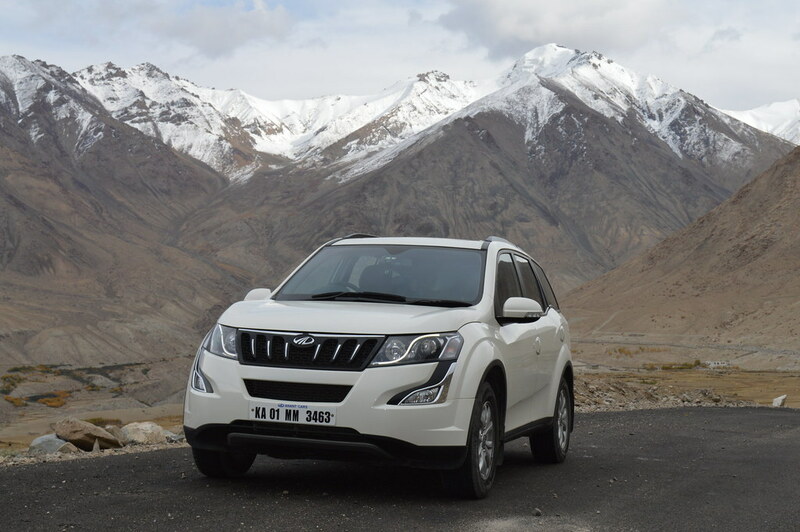 Mahindra XUV 500 won the battle for its lovely engine, Torque, Sheer Road presence and the advantage of an additional 6th gear which is a boon on highways! I was pretty young, when I was bitten by the “Travel-Bug”. Trekking along the tracks of Konkan Railways to Jumping off the snow-capped Himalayas, With a parachute off-course. I had done it all. 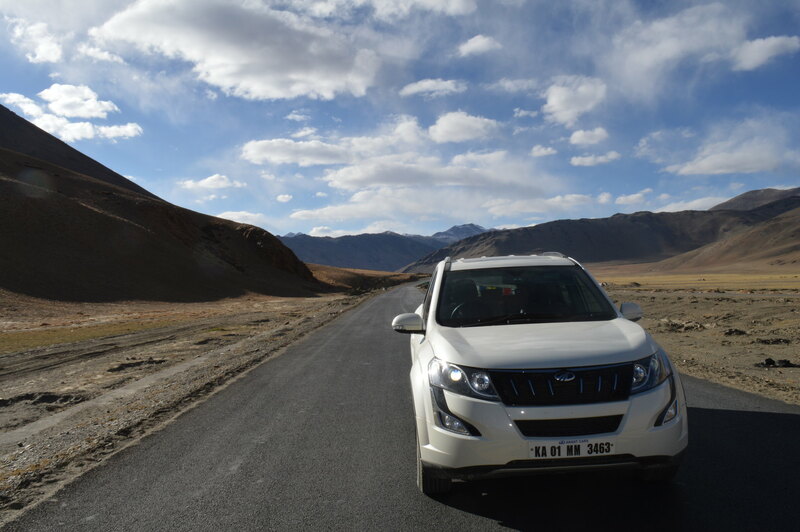 With the drastic improvement in road infrastructure across the country, Road trips are on the rise. 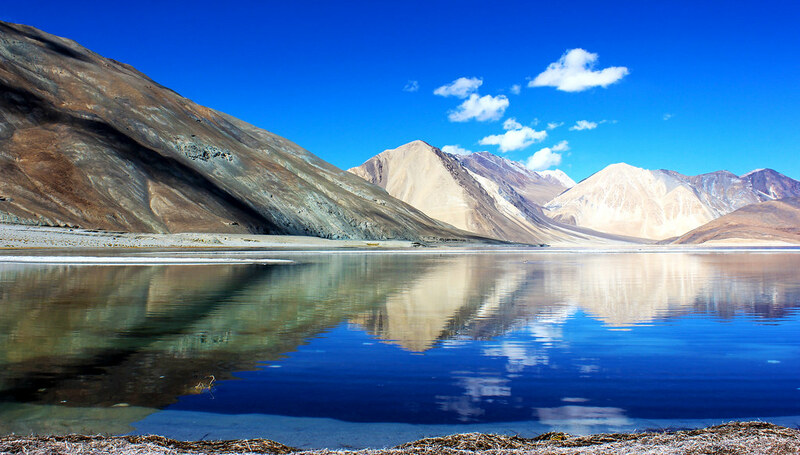 The one destination that strikes every road-tripper in the country – LADAKH! 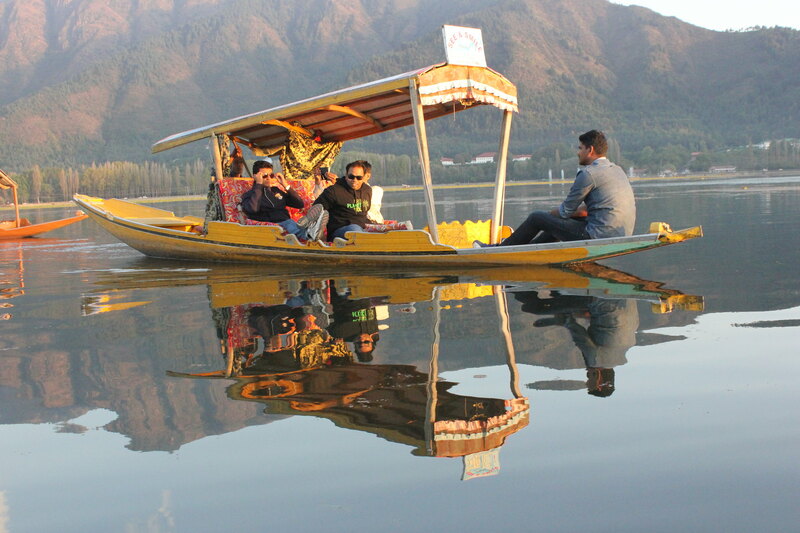 “Planning” is undoubtedly one of the best phases of a trip. Sleepless nights, Tons of Queries and Infinite Possibilities. 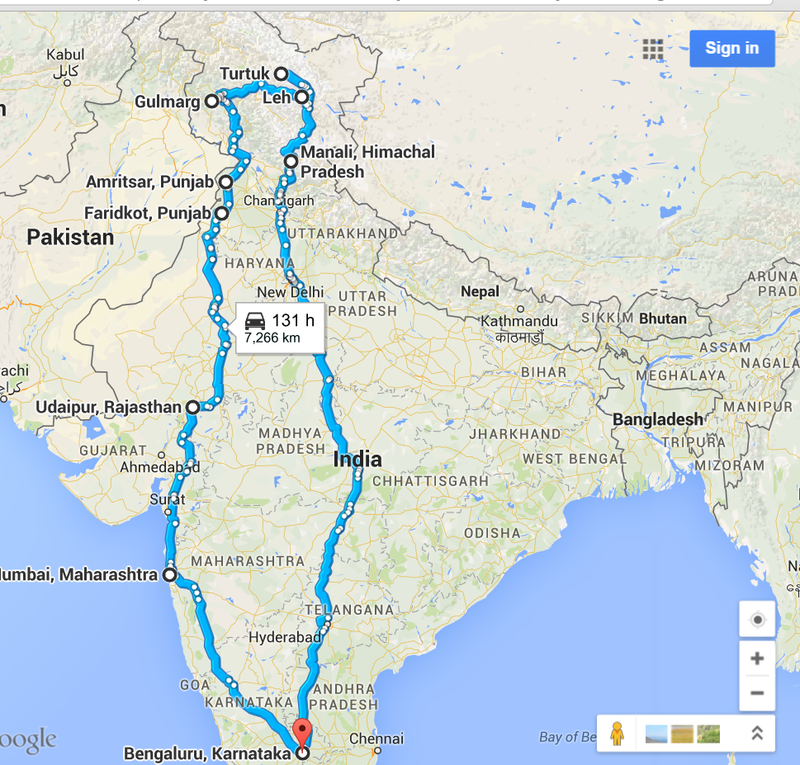 In a Road Trip of ~9000 Kms across 18 Days, Planning has to be as meticulous as possible. 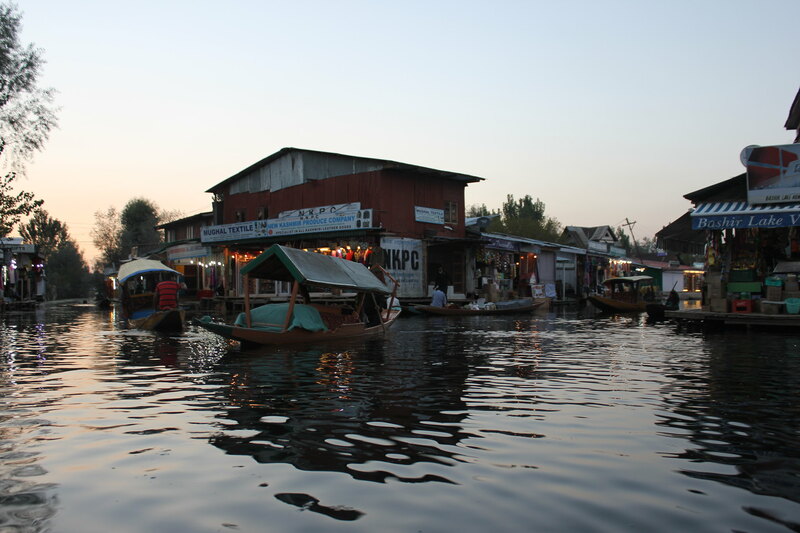 Most of the hotels were pre-booked as I couldn’t afford to spend much time looking out for them on arrival. 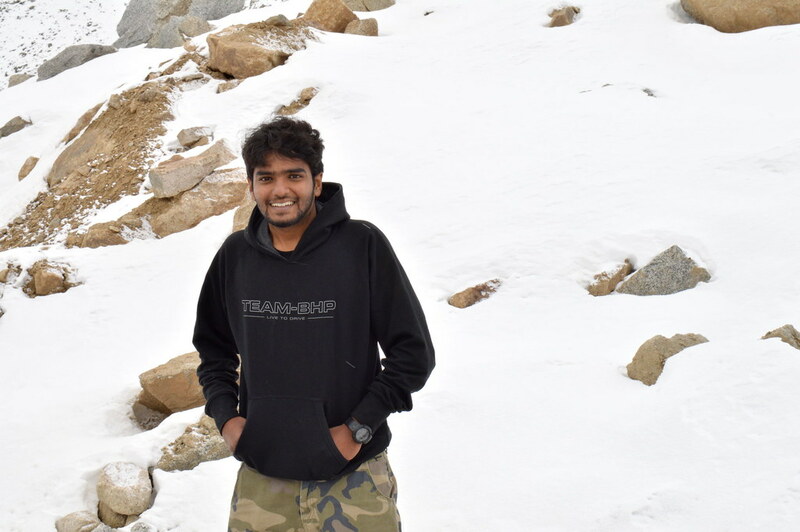 Special Thanks to Tanveer(tsk1979) for the Ultimate guide to Leh-Ladakh. Without you, This trip would have never been possible. 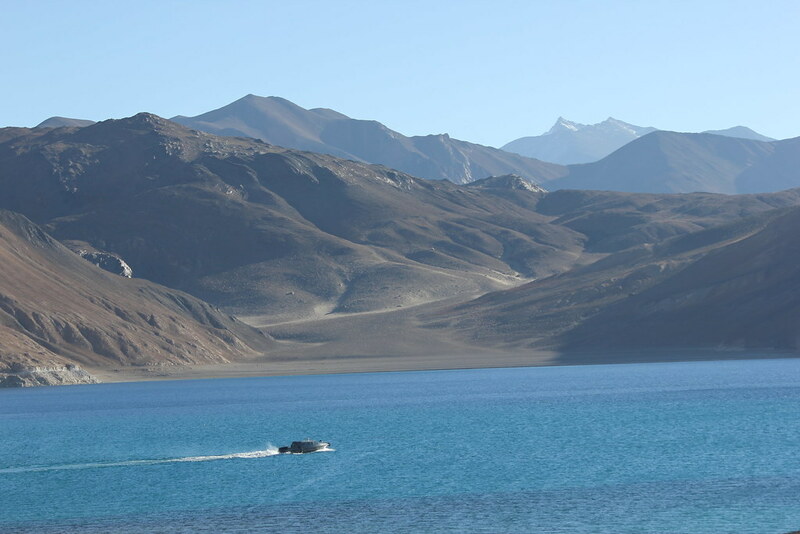 Thanks to every BHPian whose travelogues of Ladakh inspired me in planning the great escape! 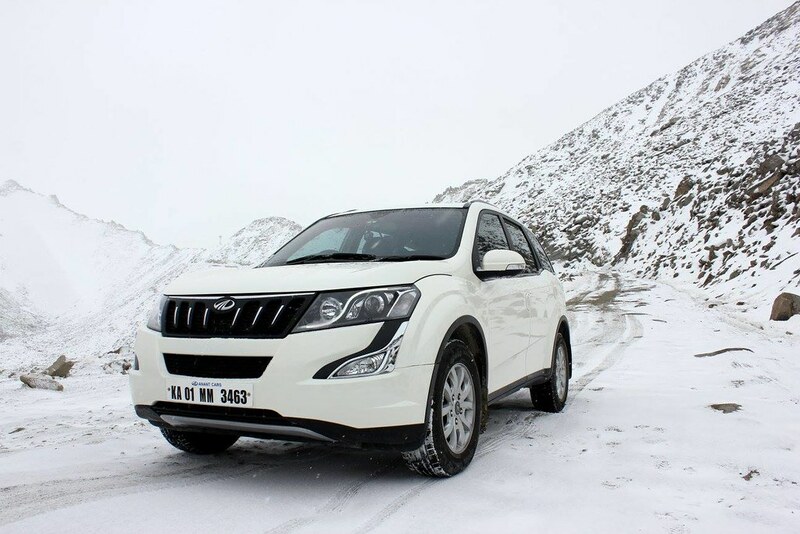 With just 6800 Kms on the ODO, It was a relatively easy affair to prepare the beast. 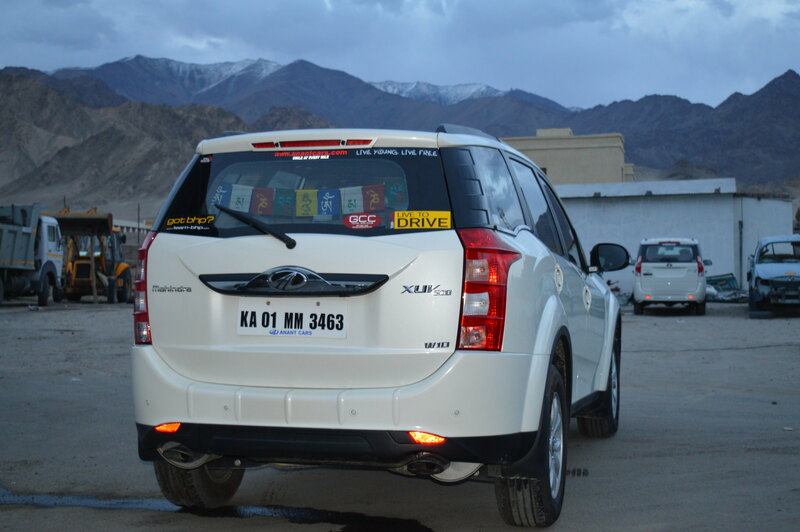 Engine oil was changed at 5000 Kms (First service). 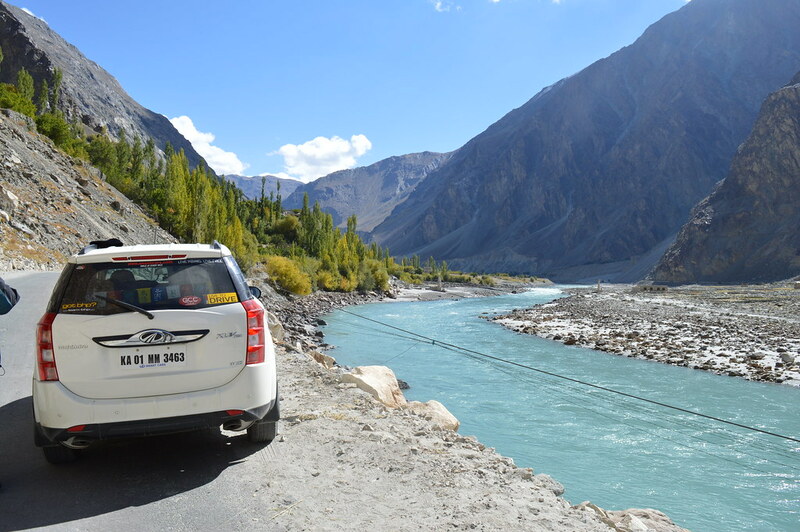 I wanted to carry engine oil and some other important fluids along with me but M&M insisted that I call their 24*7 helpline and they would arrange for a flat-bed towing service to the nearest service center in case of a breakdown. The other advantage was that I could save some valuable boot space. This day was different from any other day of my life. I was more anxious and nervous than the days of my engineering exams. 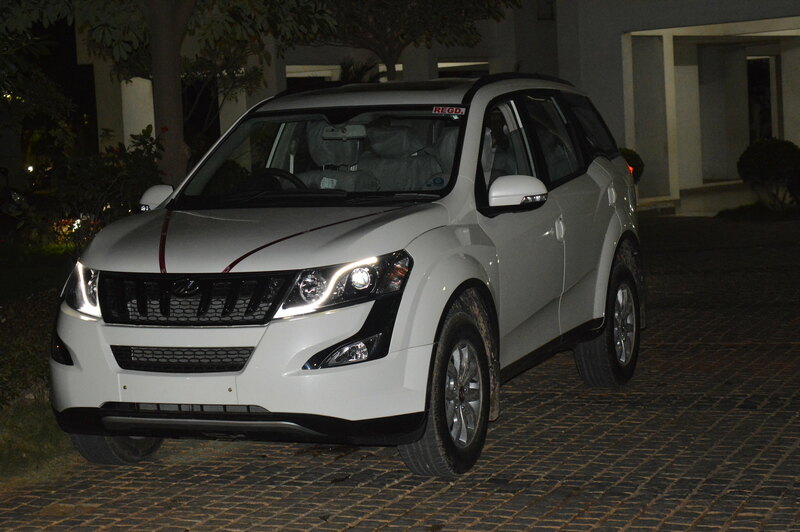 “All is well”, Got the XUV thoroughly washed, Nitrogen top-up on all the 5 Wheels, Under-body checked to be away from last minute surprises and the last row seats were removed completely to utilize the boot space efficiently. Driving continued over-night and we reached Belgaum early morning and the visibility was hardly 50 meters due to dense fog. 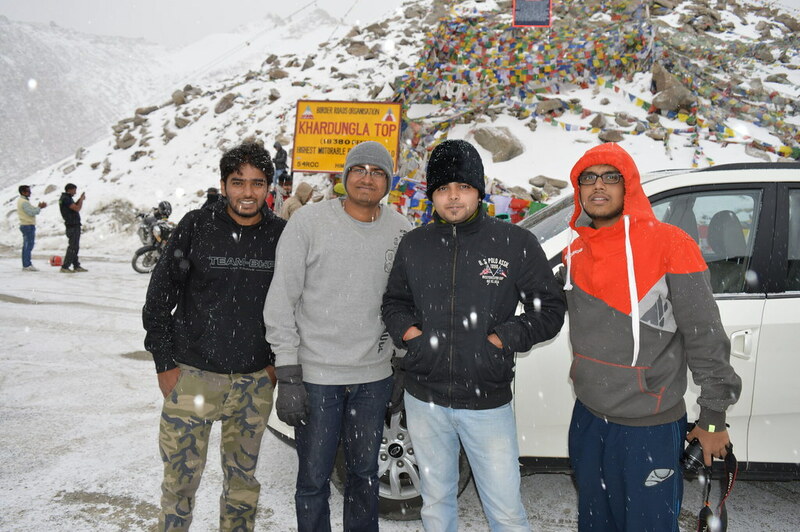 Had a tea-break and continued the drive-a-thon. 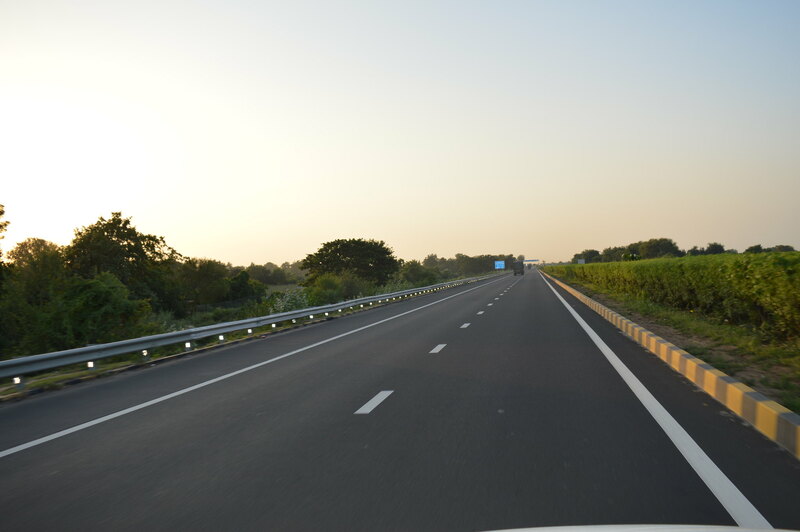 Roads were patchy for about 70 Kms when we entered Maharashtra as the maintenance of the roads was in full swing. Filled the fuel tank to the brim just before Pune and the calculated mileage(Full tank method) was 13.4 Km/l. The road en-route Pune was very Scenic with green dominating all over the plains. We decided to have our breakfast at Pune. Vibhu was excited to meet his good old friends, Me? 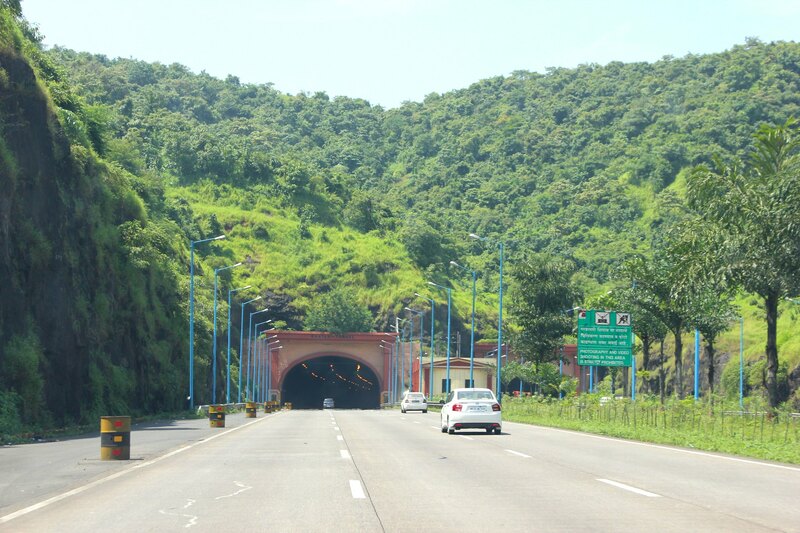 For the much awaited Pune – Mumbai Expressway! After a 2 hour break, We left Pune a 11 AM and Boy-oh-Boy! What a road. 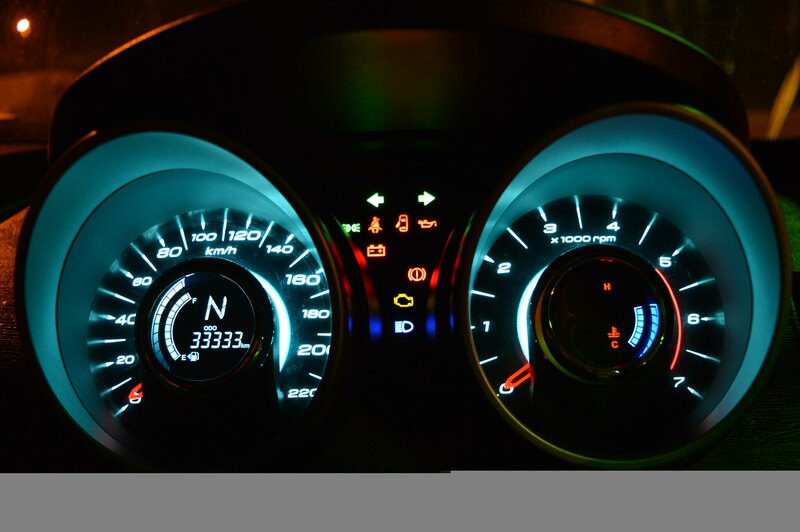 A driver’s delight. The beautiful mountains and the marvelous tunnels left me speechless. 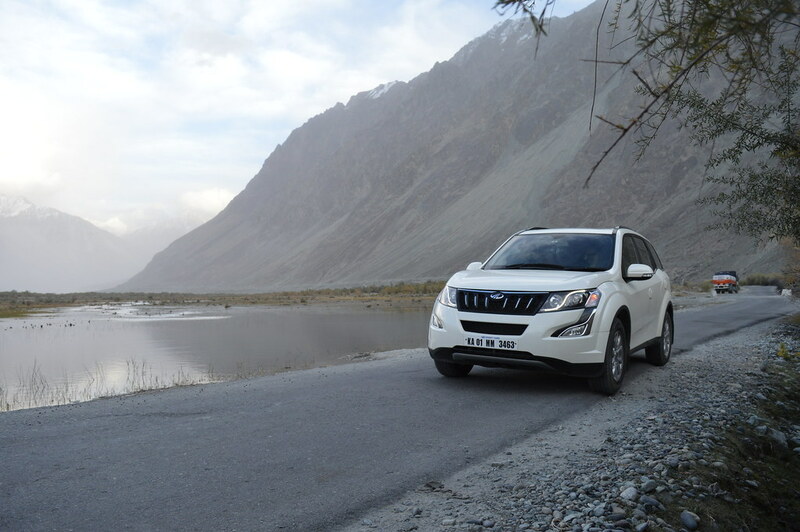 This is when I couldn’t stop praising our beloved M&M for building such a great car with a gem of an engine. I was cruising in 6th gear all along at good speeds and not a moment of nervousness. Entered Mumbai at 1 PM and I had booked the hotel at a location that would be convenient to proceed towards Udaipur the next day. 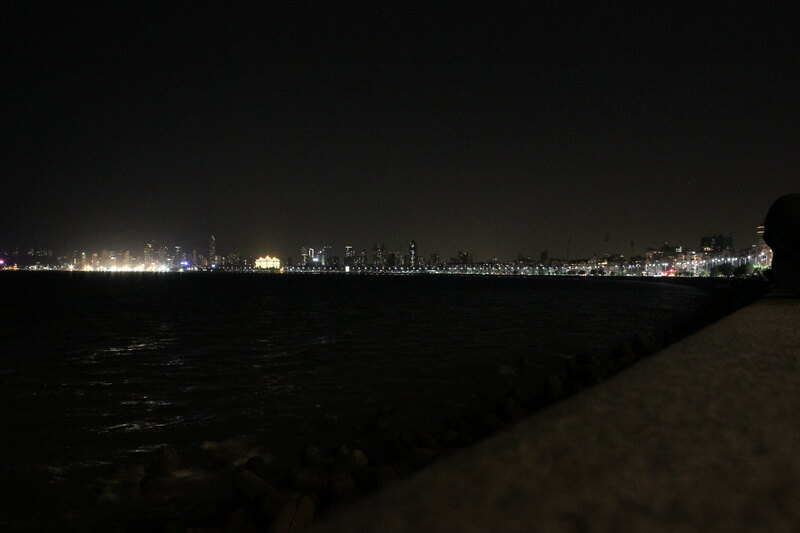 It was a Saturday and Mumbai was at its best, Travelling in the Mumbai Local train was a memorable one(for the good), Had Lovely Vada-Pav at Dadar Station and took a stroll along the world-famous Marine drive. 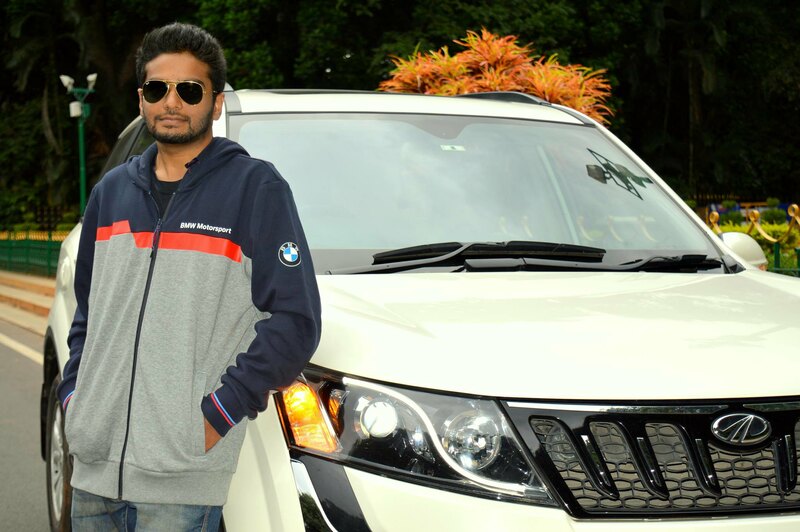 Hopped on to the Ek chaalis ki last local, reached the hotel with the help of a local Taxi. 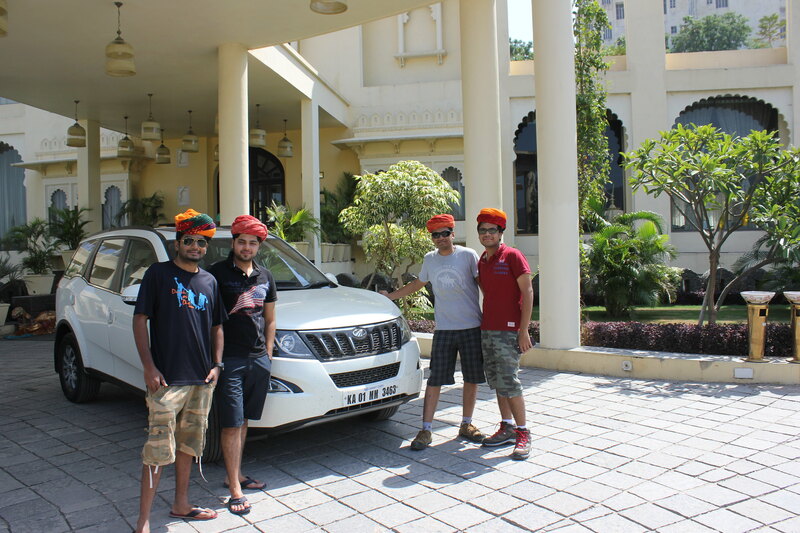 Woke up by 9 AM, had the complimentary Breakfast and left the hotel to hit the “Beautiful Roads” of Gujarat. It was difficult to bid adieu to Mumbai this early. 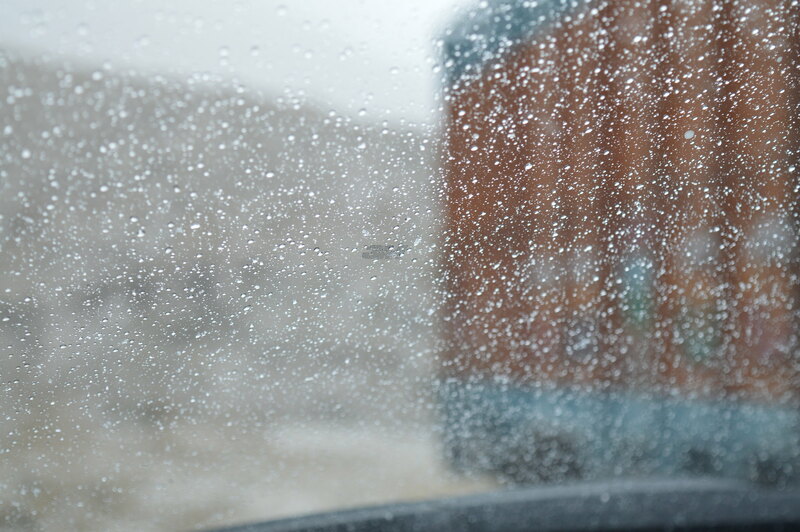 Nevertheless, Monsoon is calling! 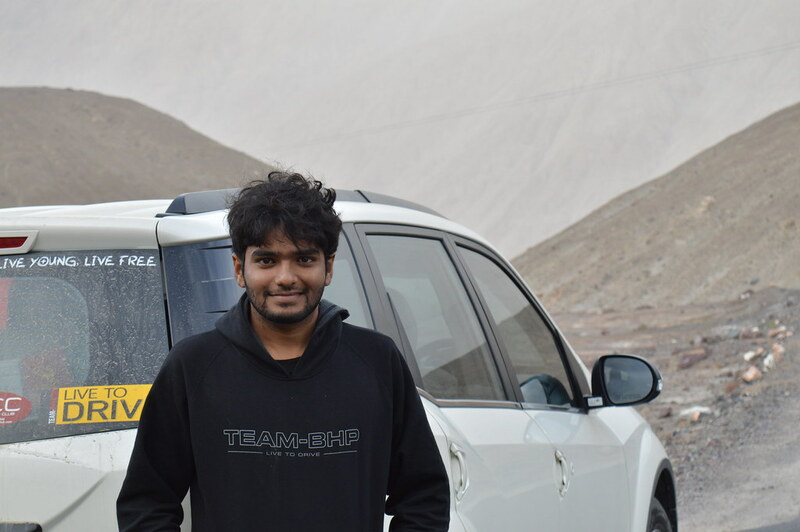 Gujarat had the best roads of all the states in the trip. Couldn’t spot a single pot-hole in the entire stretch. Had the authentic Gujarati food at Surat and it left my taste buds happy. 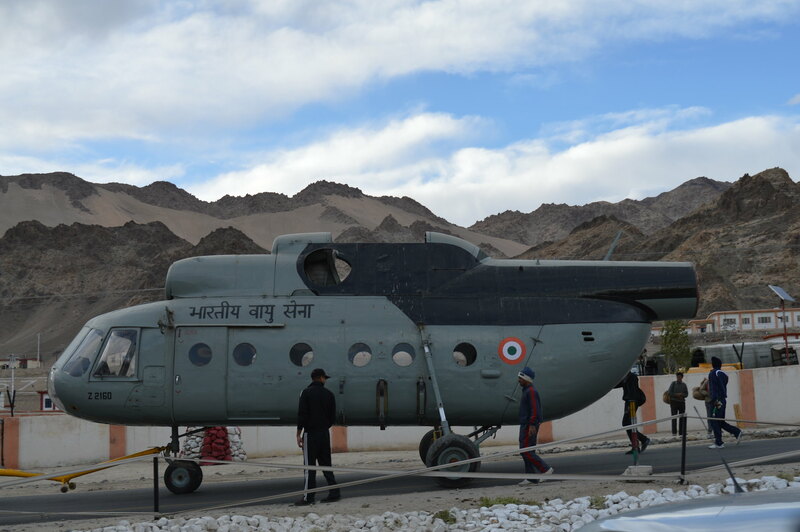 (pic) There was a slight confusion over the route to Udaipur. What do I do? Switch on the Navigation system of the car. The worst had to happen, Navigation goes Kaput! Had to solely rely on the locals for the direction to proceed to Vadodara-Ahmedabad Expressway. The worst had happened? Not yet. 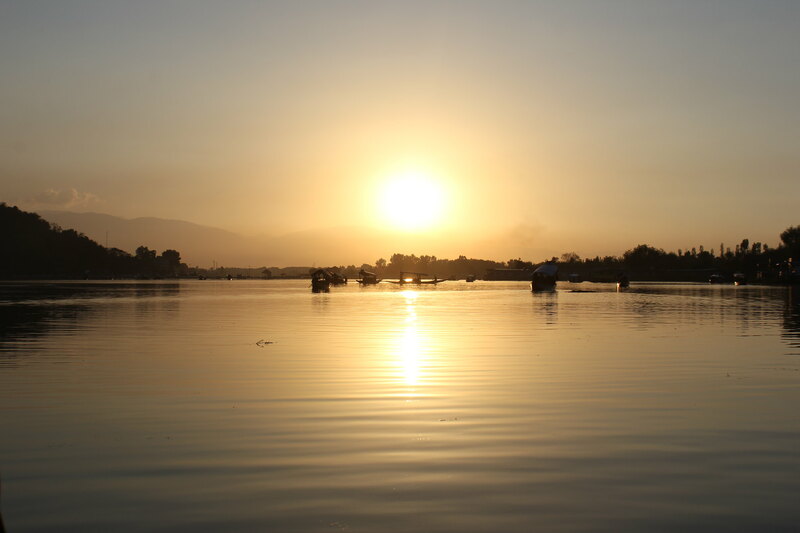 The locals guided us to a place called “Chota Udaipur” which is apparently in Madhya Pradesh. Luckily I sensed something fishy as the road was a single-lane with almost zero traffic. 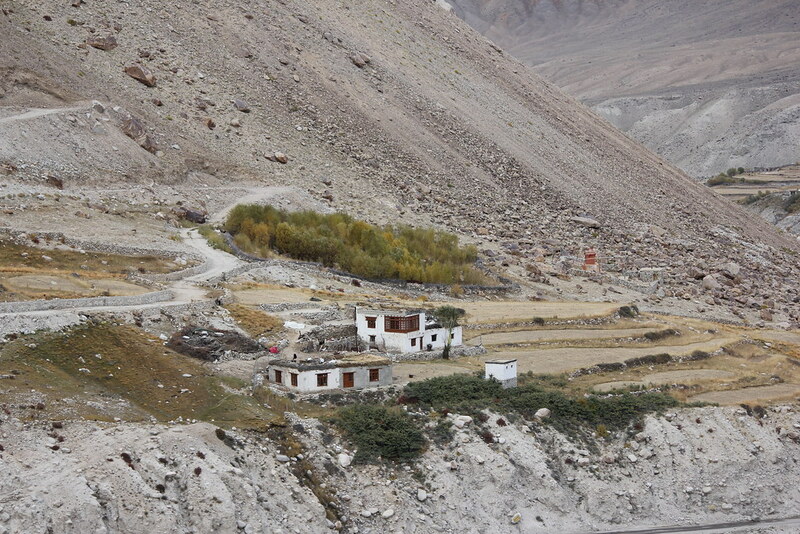 With just 20 Kms I decided to stop at a small hut and confirm the route. I realized the mistake, took a quick de-tour and joined the Expressway in about 30 Minutes. 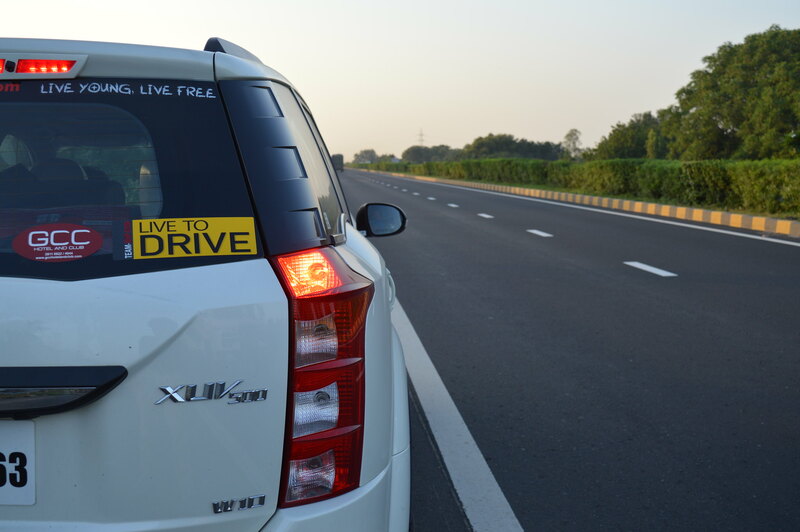 The Vadodara-Ahmedabad expressway was the best road I have ever been on. Butter-Smooth! Covered a distance of about 120 Kms in 45 Min. Meanwhile filled-up the tank to its brim at Reliance filling station on the expressway. Calculated mileage was 13.1 Km/l. Got a call from my friend Vinay around 7 PM that he has reached Udaipur and would be checking-in to Club Mahindra Udaipur. We reached Udaipur by 10 PM. Sadly, he ended up waiting 3 hours for us. 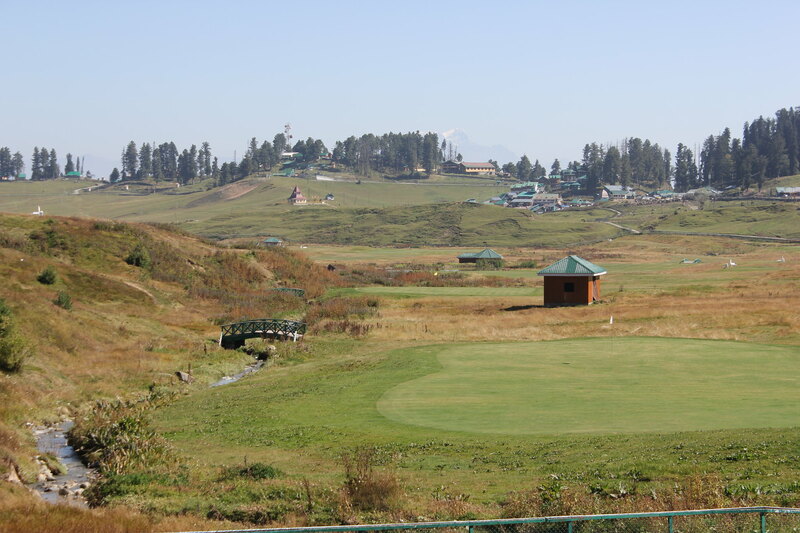 The stay was free(Advantage of having a friend who has a Club Mahindra Membership) and it was a delightful experience. 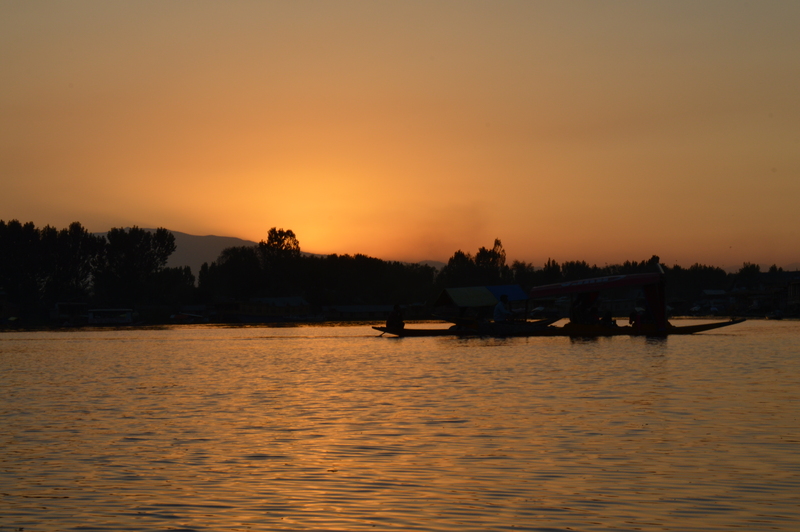 Plan: Leave Udaipur early in the morning and reach Amritsar by late night. (This was achieved by a couple of BHPians) Reality: The feeling of seeing a milestone at 6 PM that reads Amritsar 578 Kms, Priceless! Blame it on the patchy stretch of Rajasthan or the disappointment of Kishangarh-Hanumangarh “Mega Highway”. Filled the tank to the brim, Calculated mileage = 12.7 Kms. 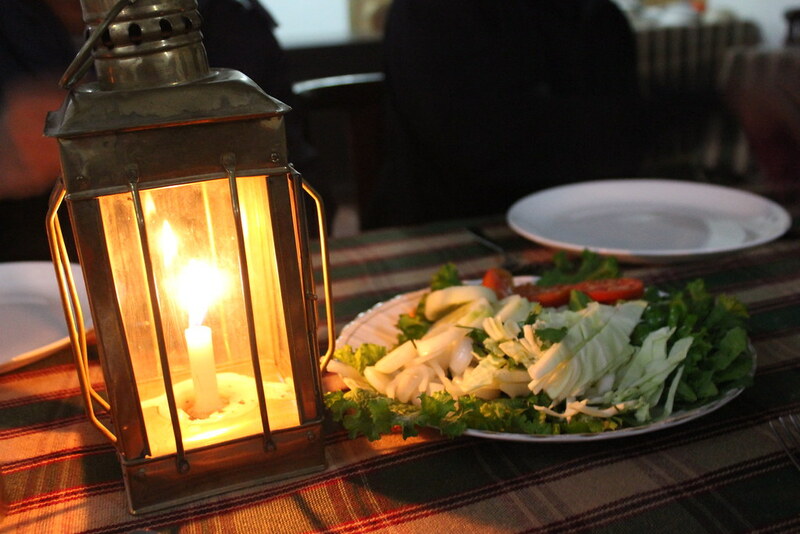 The good part was the amazing Rajasthani thali at a small town near Chittorgarh. 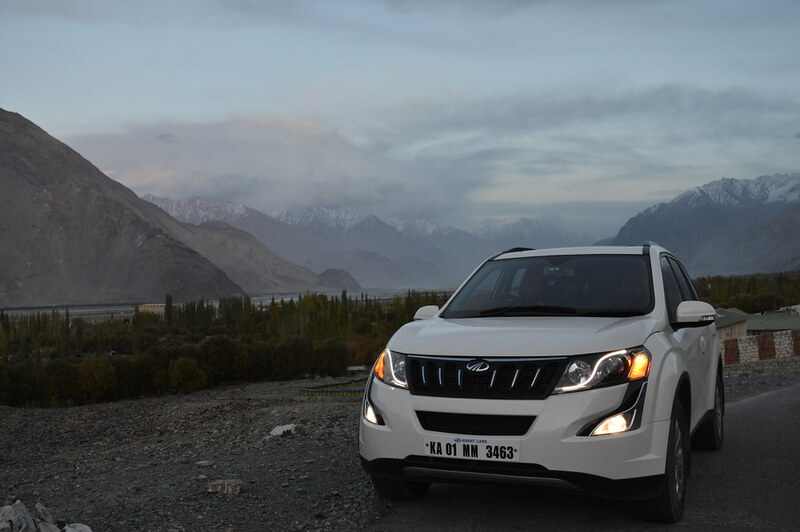 The driving continued after a short tea break and it was pitch-dark around 10 PM and that’s when TPMS(Tyre pressure Monitoring System) decided to have some fun-on-the-go! Beep-Beep : Low tire Pressure. Before I could even think what to do next, I found a petrol-pump(closed) with a light and that was one of the happiest moments of my life. If not, we would be stranded in complete darkness. Call it a blessing in disguise. Parked the car and 12V Electric pump comes to the rescue. 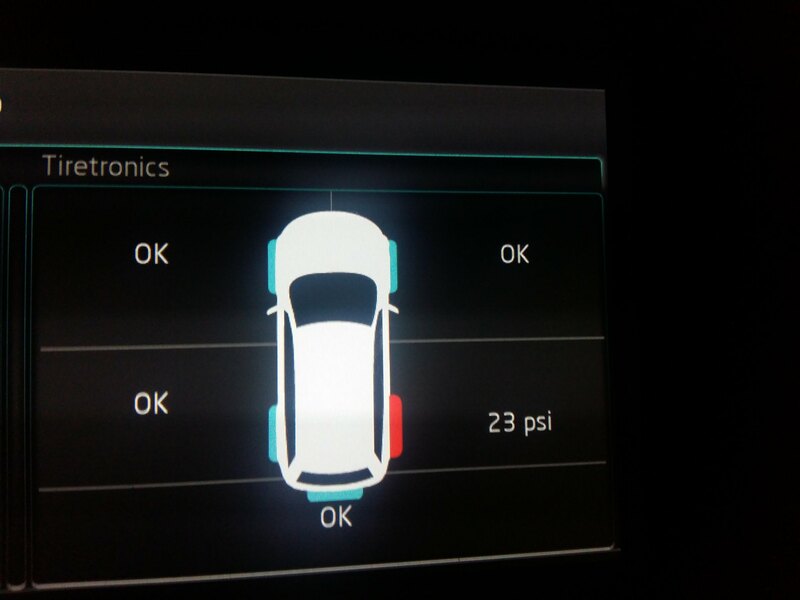 Checked the Tire pressure of the rear left tire and it was 23.1 PSI while the other tyres had ~33 PSI. Filled the air upto 32 PSI and waited for 5 min and the reading dropped down to 25 PSI. Hence, Puncture was confirmed. Quickly swapped the punctured wheel with the spare wheel. Was heart-broken to see a Non-alloy. 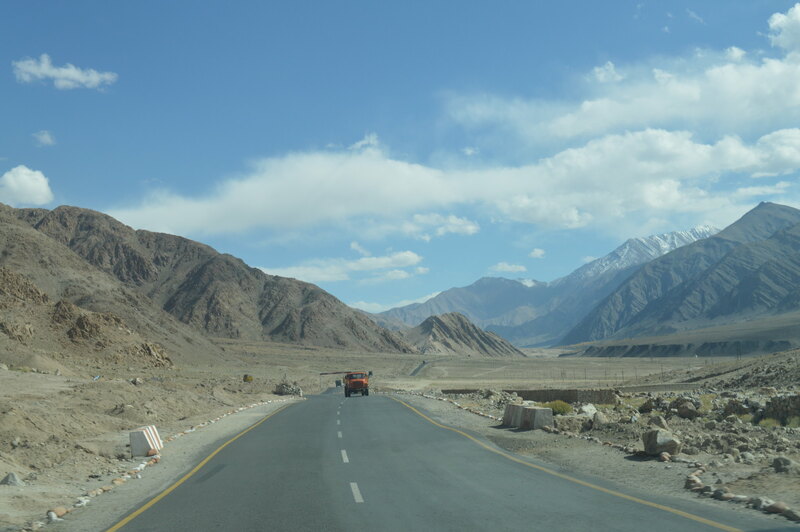 Continued driving and roads finally became better after crossing the Punjab Border. It was 3 AM and Amritsar was Faaaar away. The best thing to do was to stop by a road-side dhaba and order some yummy food : Dal Makhni, Rotis and a Lassi(came with a spoon to “eat”). 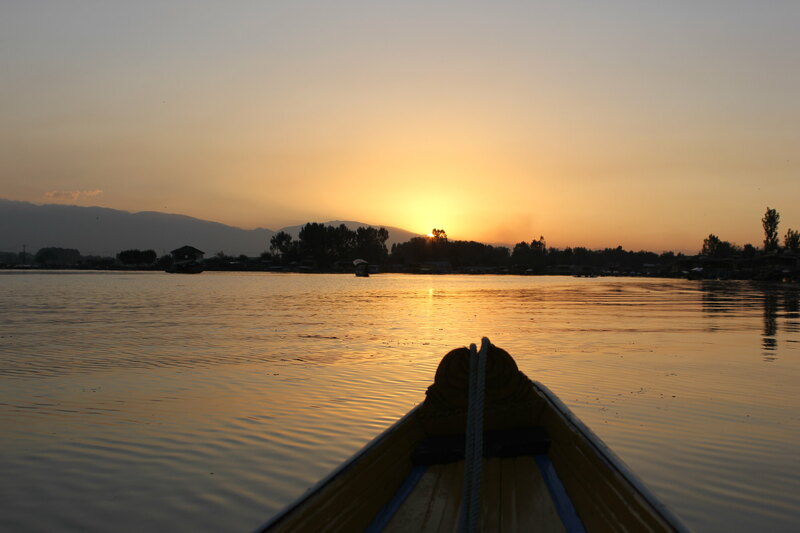 Continued the journey after a much-needed break and the road was surrounded by DDLJ Inspired Sarson ke kheth on either sides with one of the most beautiful sunrise of my life. 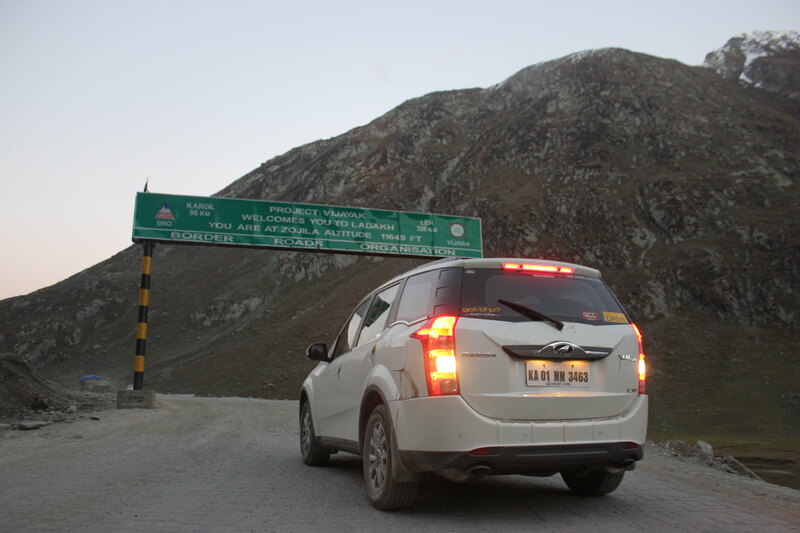 After an hour of driving, I saw the Milestone that read “Amritsar 2Kms”, I felt like I had conquered the Everest. 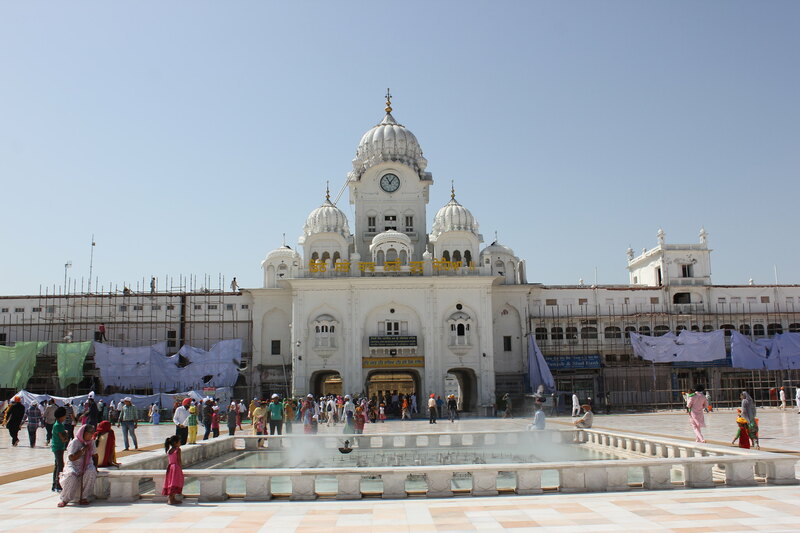 Finally, We made it to Amritsar by 7 AM. Checked-in to hotel Puri Palace, No! I wasn’t fortunate enough to sleep. While Vibhu and Vinay decided to have a nap, Me and Hardik went out looking for a puncture repair shop. We found one in the vicinity and the punctured tire was quickly repaired. Next? Get the car washed as it was as dirty as it could get. Met a really nice Sardar ji who was getting his truck bathed and was co-incidentally driving to Bangalore in his truck. We ended up having a good conversation for almost an hour on all the possible things in the world. Went back to the hotel, stayed for an hour and check-out! 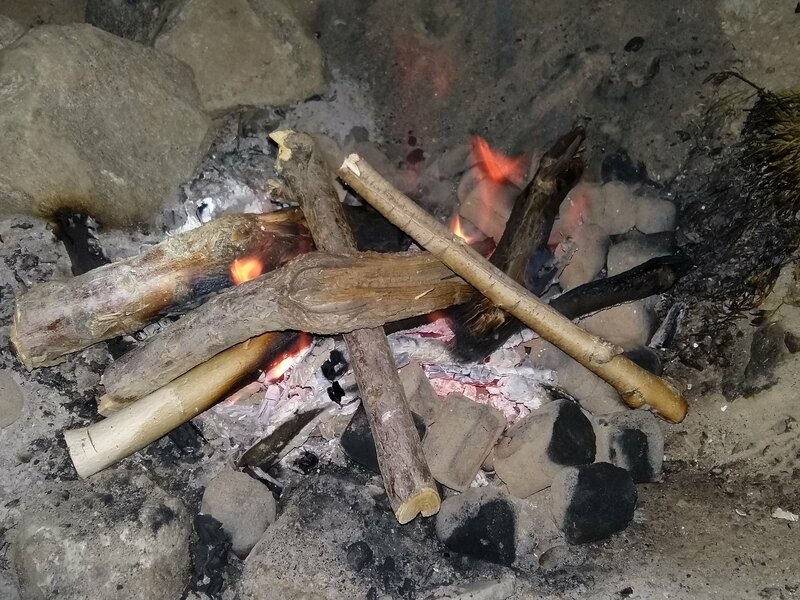 Meanwhile, We realized that we need kerosene as it would be handy to prepare something in case of an emergency and that turned out to be a blunder! 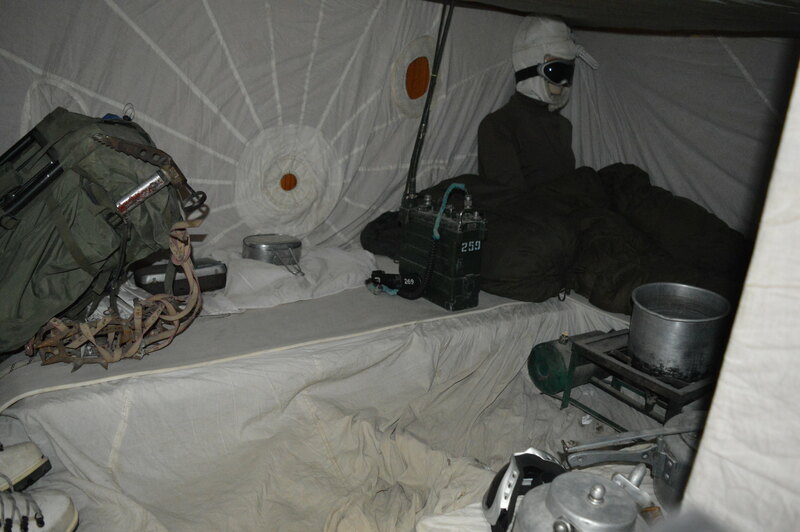 There were 4 small bottles which were tightly sealed and kept inside the 20L Diesel Jerry can which was further sealed. Yet, there was the odour of kerosene inside the car. It was nearly impossible to figure out the source of the leakage. Sherlock & Watson, Help ? 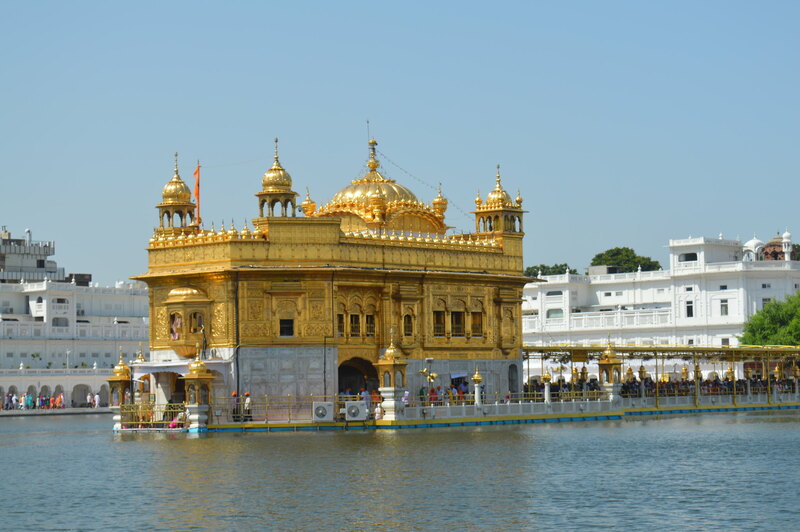 Visited the beautiful Golden Temple and loved it from the bottom of my heart. 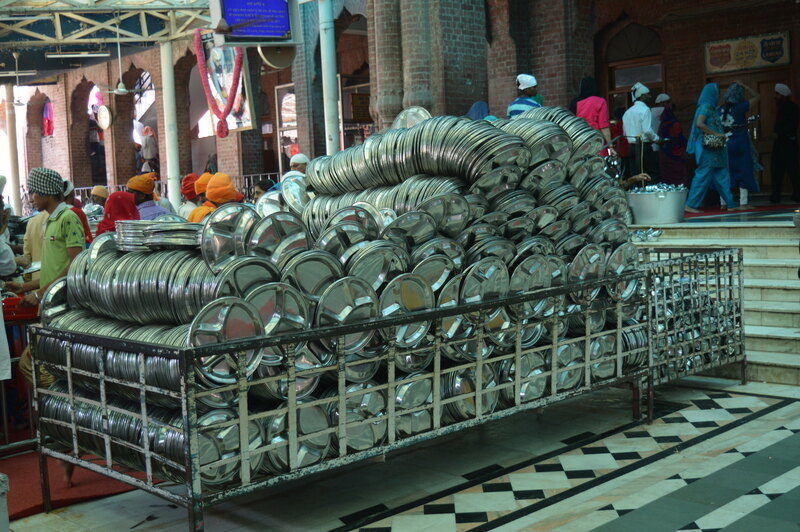 Langar is served to over 2 Lakh people daily and the sheer amount of dedication is truly respectable. 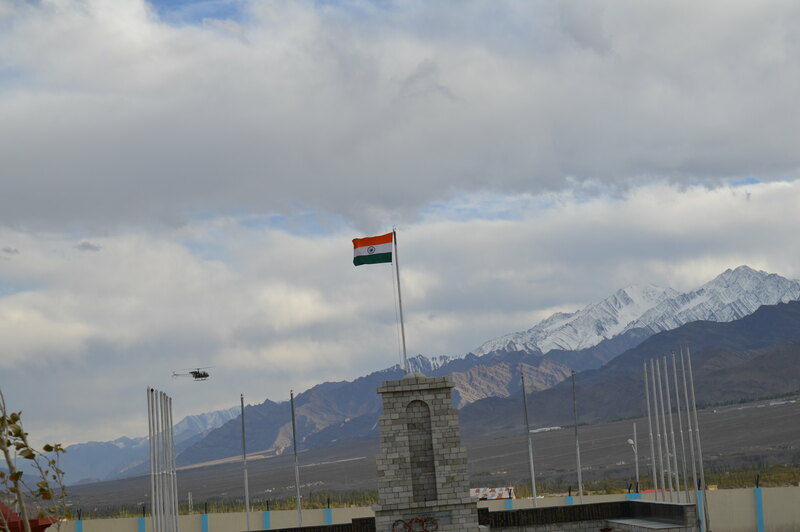 Left Amritsar and reached Pathankot in couple of hours and proceeded towards the border of Jammu & Kashmir. 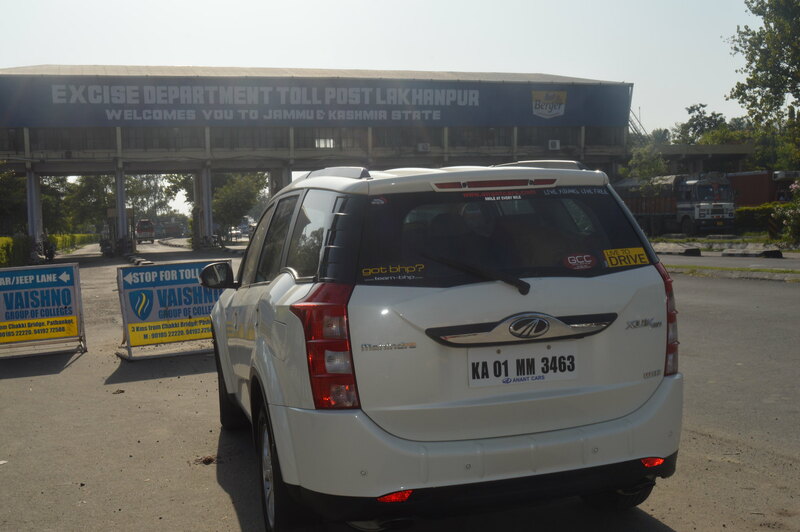 As we reached Lakhanpur toll plaza I couldn’t resist but take a pic. 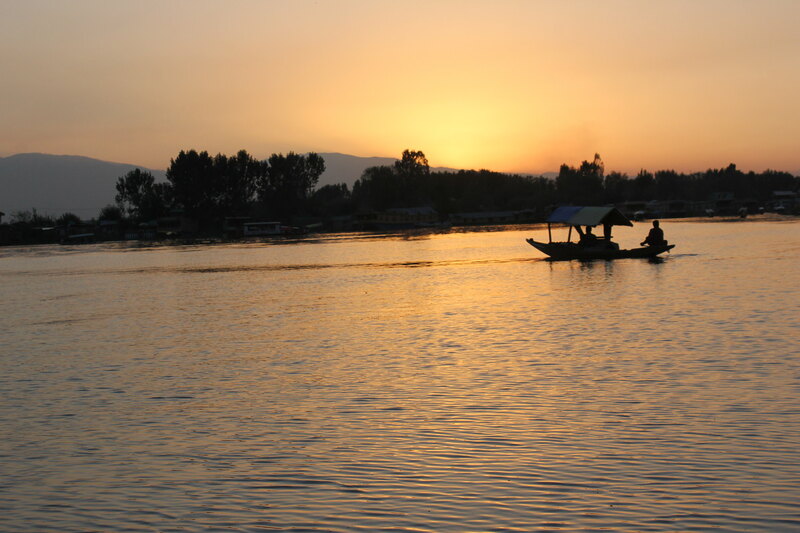 Finally entered the state of Jammu & Kashmir, a dream turned into a reality. 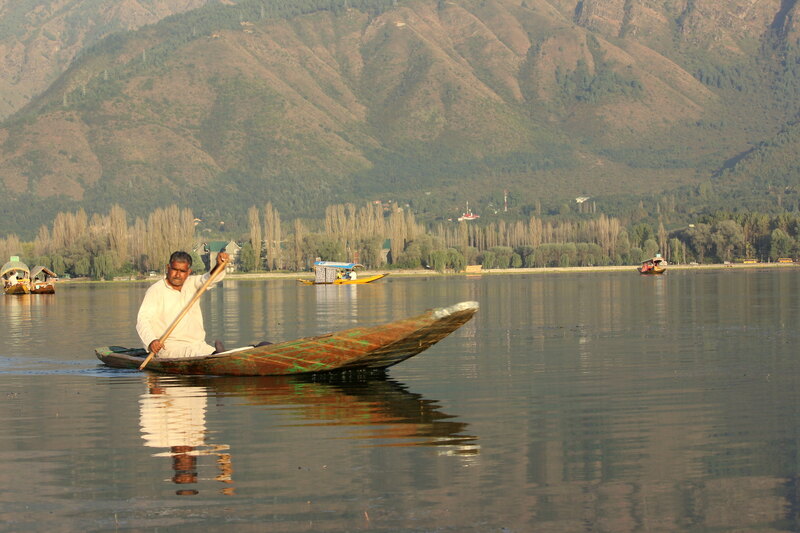 Welcome to Jammu & Kashmir! 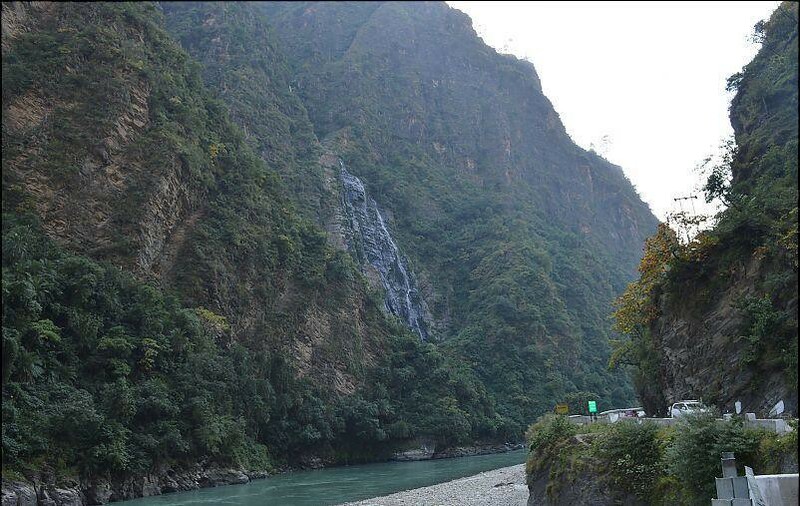 The roads became better and better once we crossed Jammu and proceeded towards Katra. 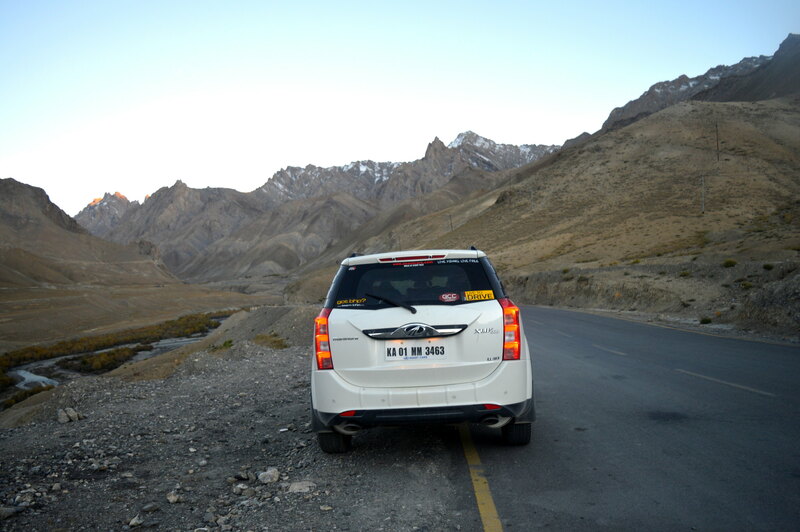 We were stopped at the Army check post and the documents of the car checked. 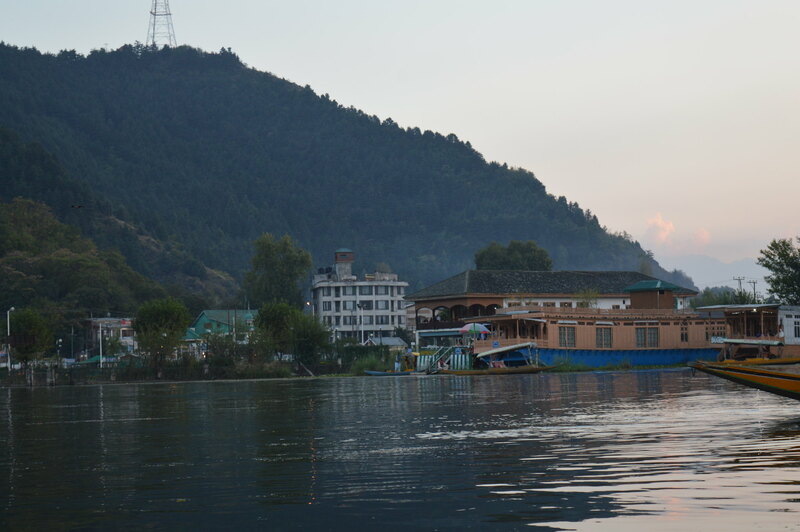 The initial plan was to reach Srinagar, But the ghat section and the truck traffic took a toll on the time consumed and we decided to stop at Patnitop for the night. 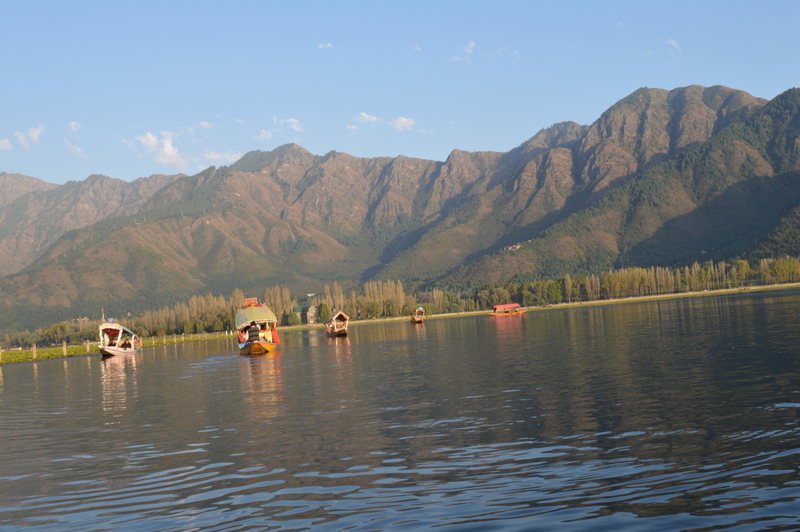 The day began at 9 AM as we proceeded towards the Kashmir valley. 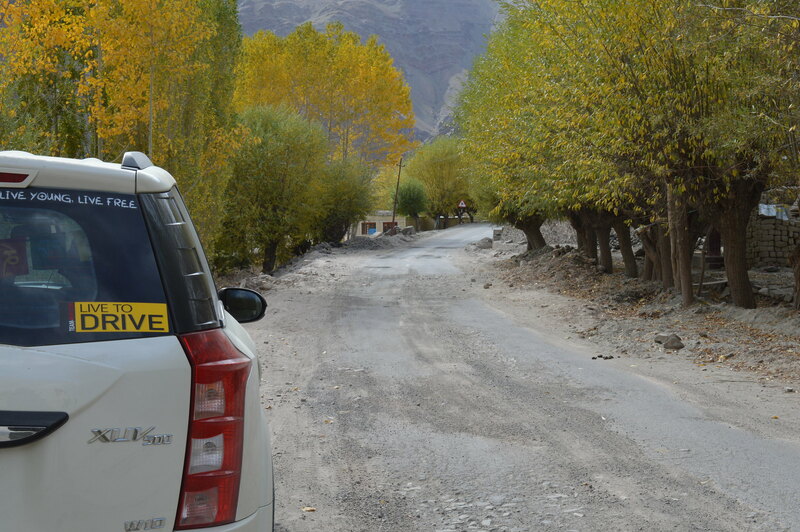 It was a very delightful experience to drive through the twists & turns of the valley. 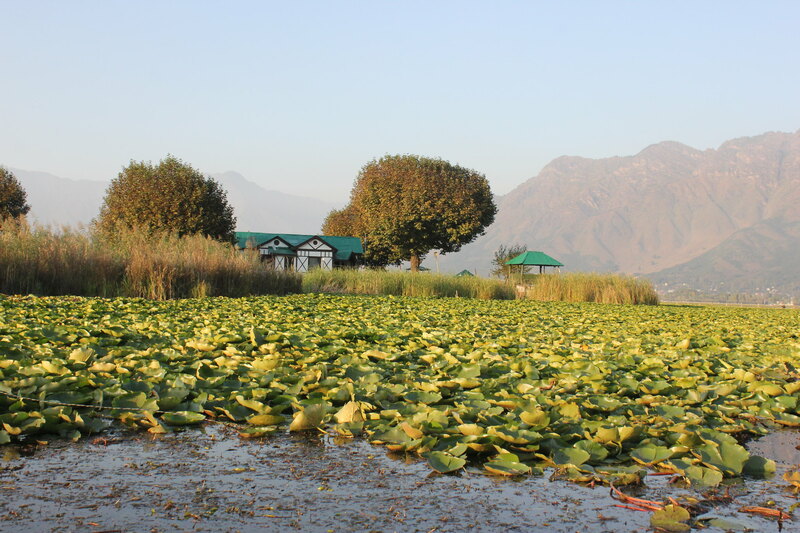 Reached Srinagar at 2 PM and had one of the best lunch of the trip at Ahdoos Restaurant which serves lip-smacking Wazwani food. 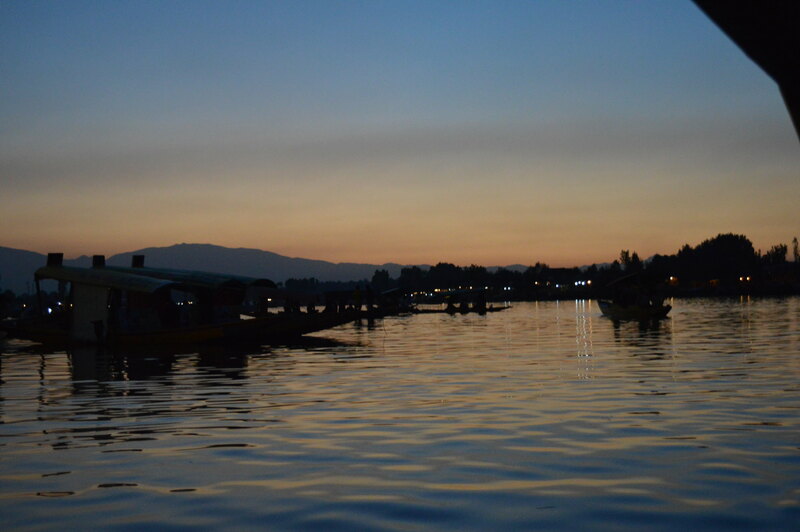 Left for Gulmarg at 6 PM and reached there by 8 PM(Didn’t mind doing this stretch at night as i had to come back to Srinagar the next morning) . 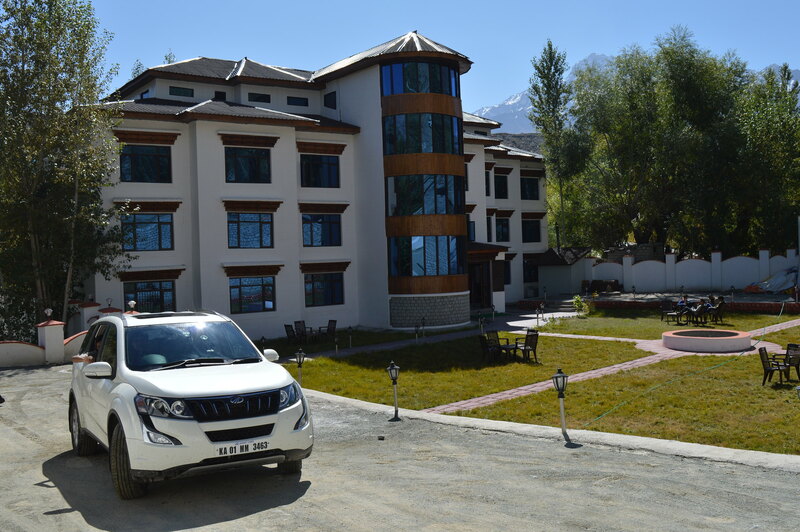 Checked in to the hotel which was just few yards from the Gondola ride. A highly recommended place to stay. The day started at 8 am with a view to die for. 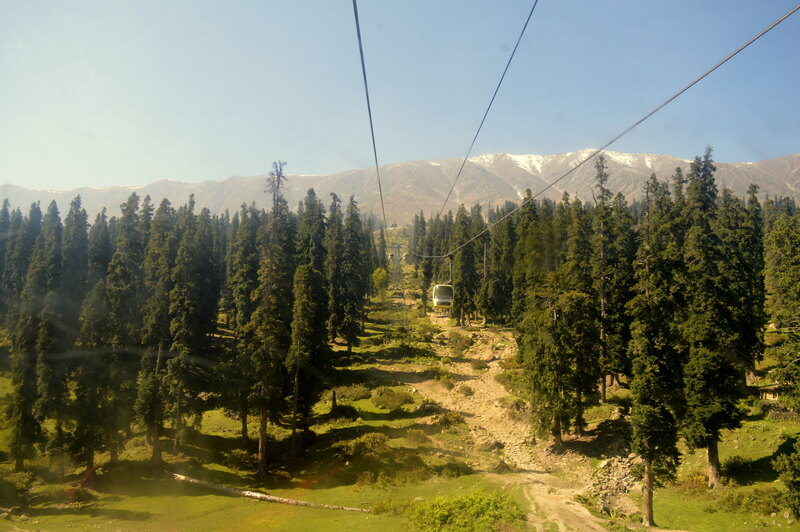 Surrounded by majestic alpine trees, and the view of the Gondola cable car which was at a distance of 300 Mts form the hotel. We had to walk over stones and water stream to reach the ticket counter which was supposed to open at 9 AM. Grabbed a cup of tea which was sold as “kawa”. The Gondola ride was great, if not excellent as it is at its best when there is snow all over. 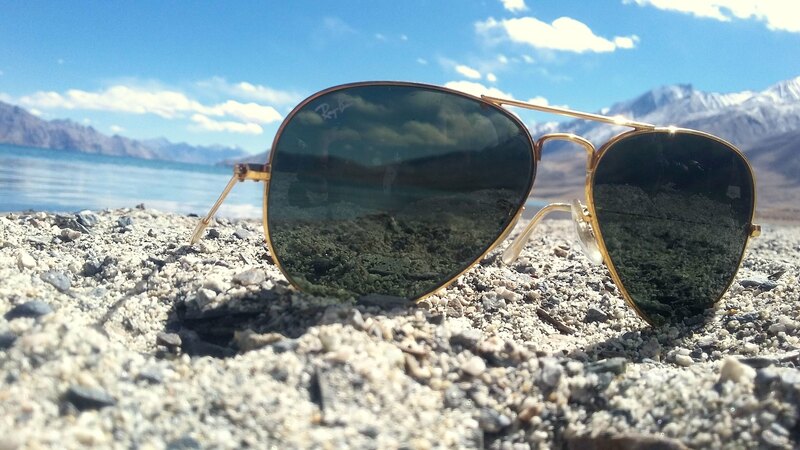 I bet it would give you a clear picturesque of Switzerland. There are 2 Levels of Gondola Level 1 and Level 2. 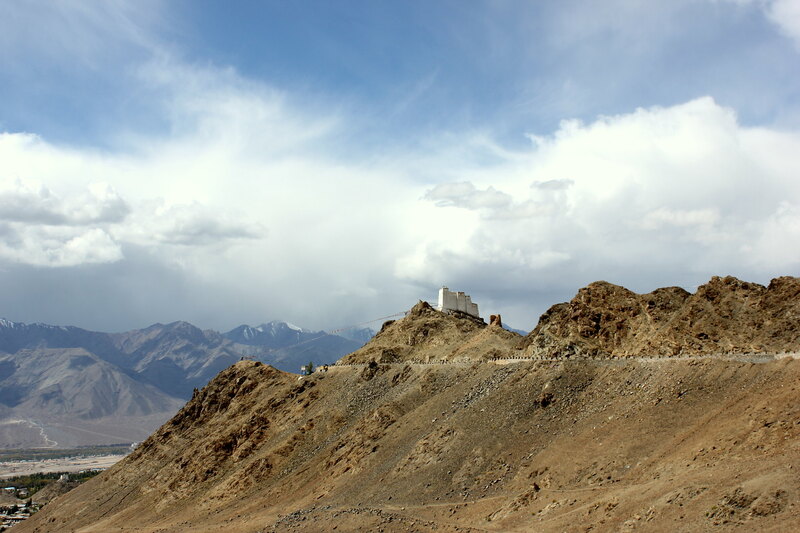 At 14000 feet, It is officially the highest cable car ride in the world. It was 11 AM, proceeded with check-out. 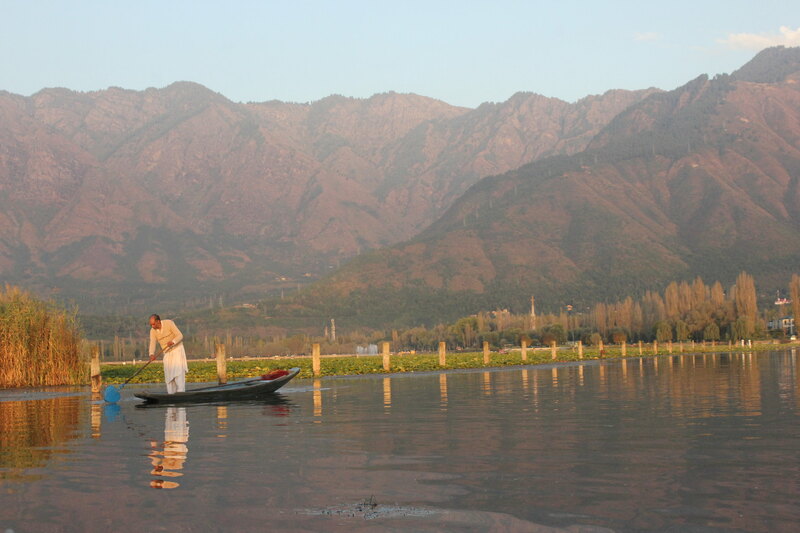 Kashmir and Apple’s go hand-in-hand. 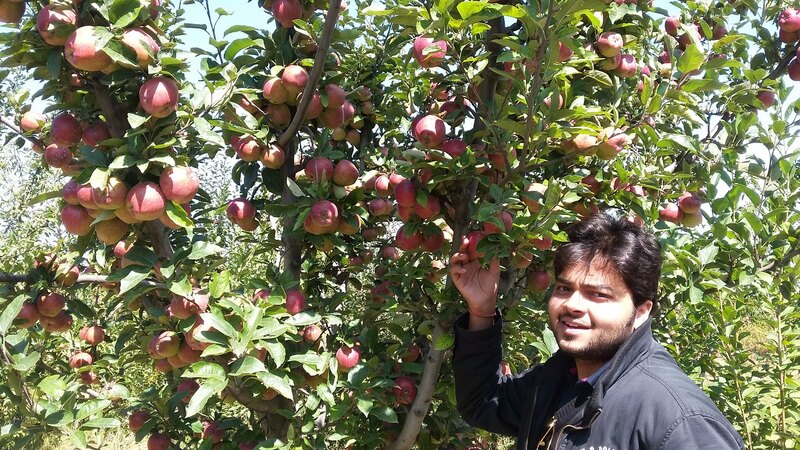 Visited a beautiful Apple Orchid and packed along 10Kgs of Apples(including green apple) as we would majorly rely on them in our journey to No Man’s Land in the coming days. 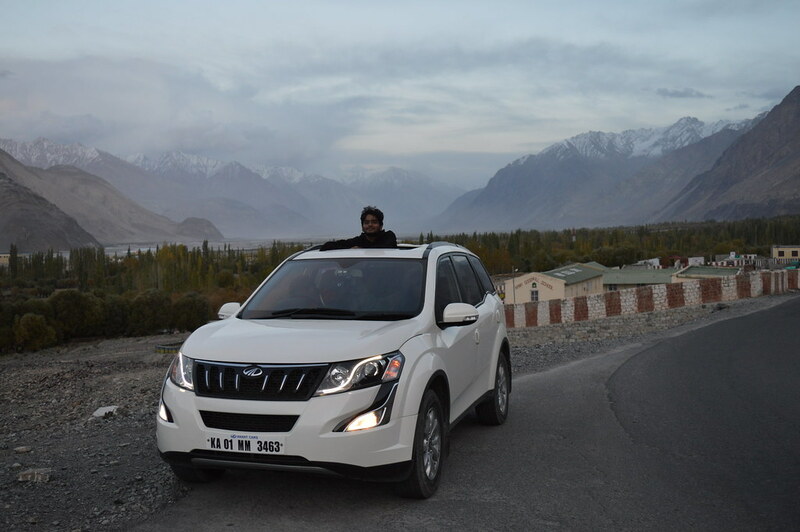 Left Gulmarg and took the Srinagar By-pass to proceed towards Kargil. Enough to keep the doctor away for a year! 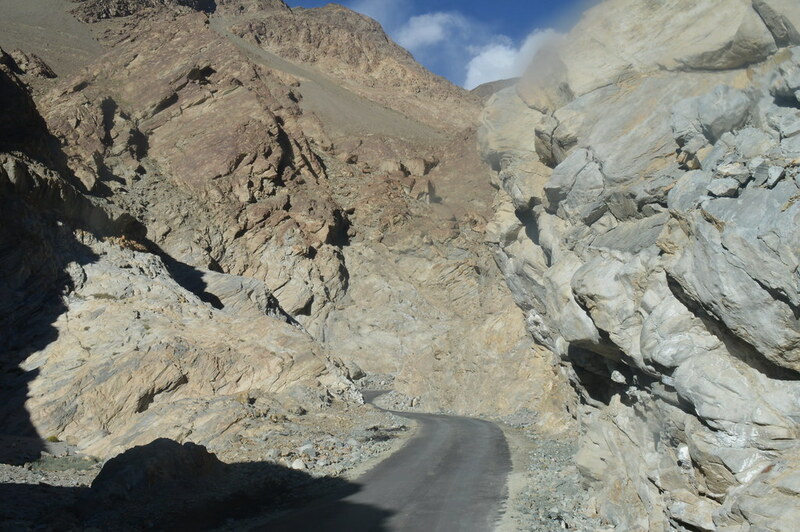 En-route to Kargil lies this super-magnificent Natural/Man-made/BRO-made road, the mighty ZOJI-LA PASS! 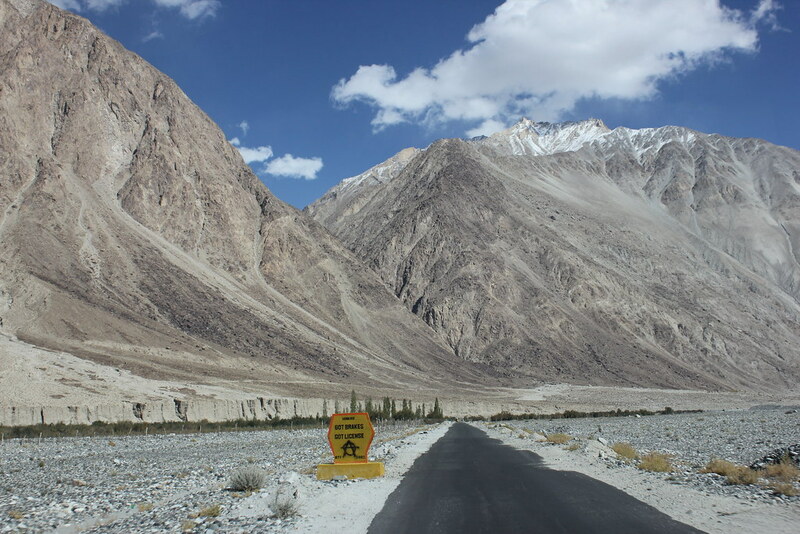 On a serious note: This stretch needs to be strictly covered during the day as it is extremely risky and grabs a spot in one of the World’s most dangerous roads. 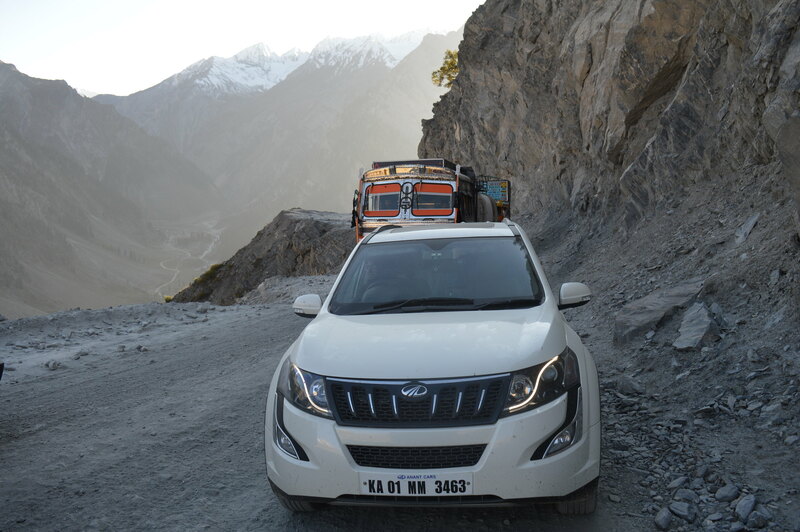 Stay focused and maintain good distance with the vehicles especially trucks ahead of you. 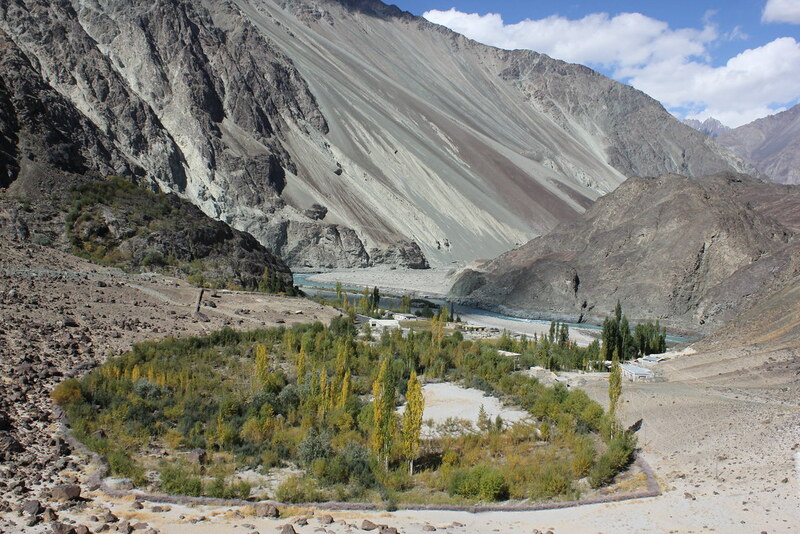 This was the most challenging road I had driven in my life. 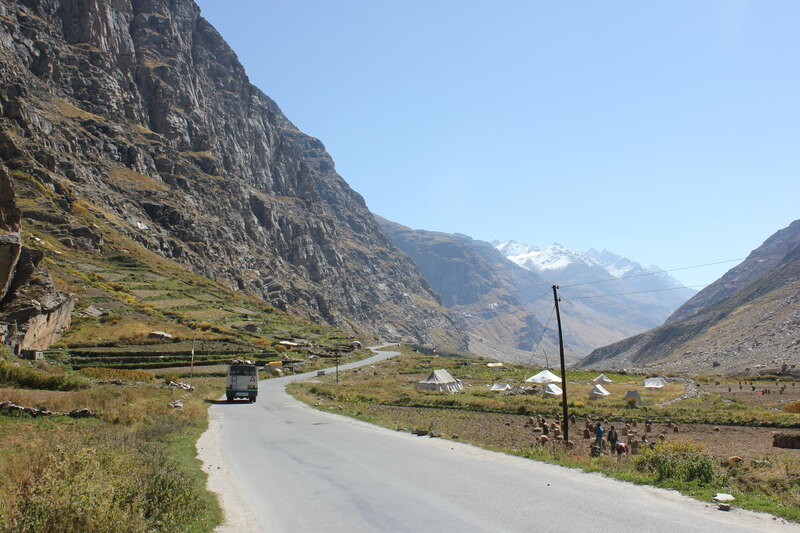 Reached Sonmarg, Boy-oh-Boy! It was postcard-perfect. 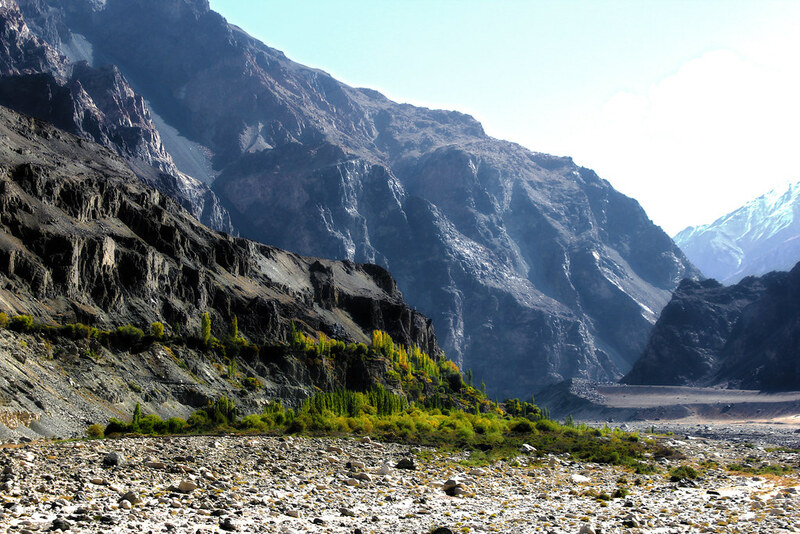 Mountains, Alpine trees, Bridges, River all at once. 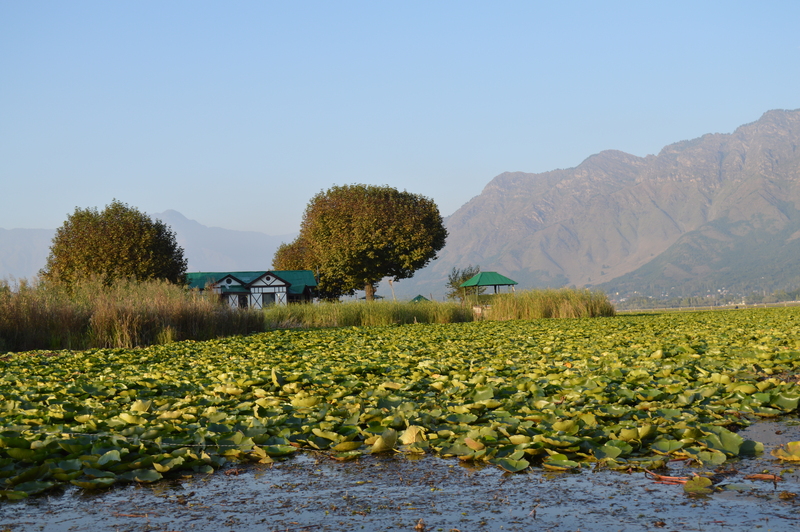 We were lucky enough to have the “Banned-Maggi” at such a beautiful place. 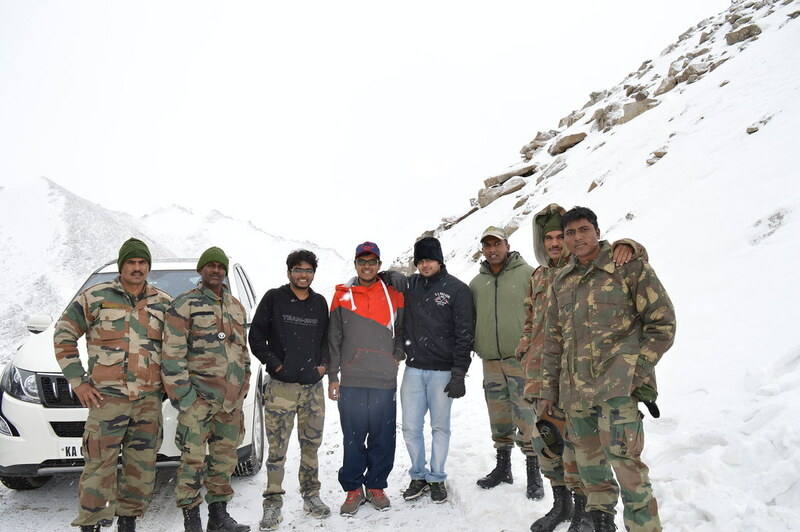 In a while few Army Jawans joined us and we had a good conversation. 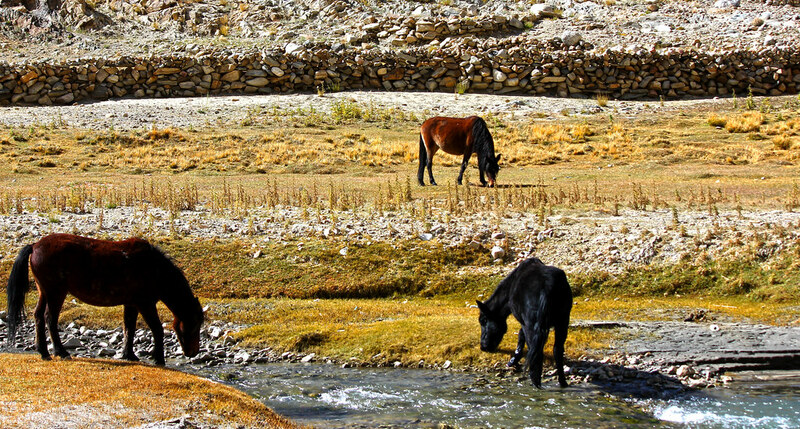 They told us “ Stay fearless and go ahead with your plan, there is Army everywhere Roads, Mountains, Forests, Bridges and Rivers” A big Salute to them! 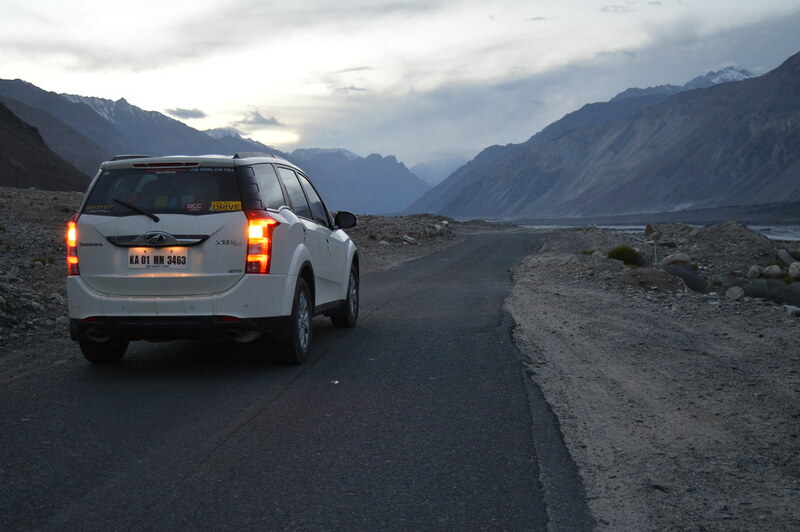 Reached Drass by 7PM and the road drive from Drass to kargil was a runway like tarmac which was fully illuminated. Kudos to BRO. I wouldn’t be surprised if I had spotted a Sukhoi-30-mki in my rear-view mirror. 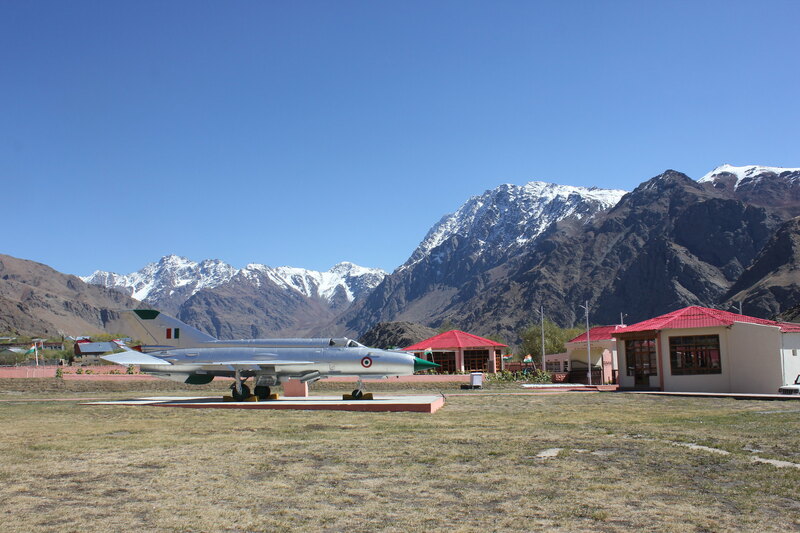 Kargil! 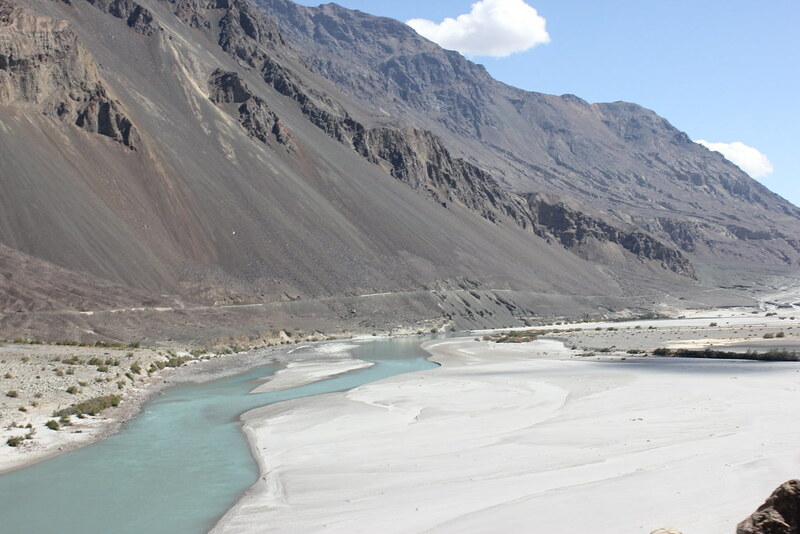 Had only heard and dreamt about visiting it until this day when I was really privileged to step on the soil of one of the most remarkable places of INDIA. 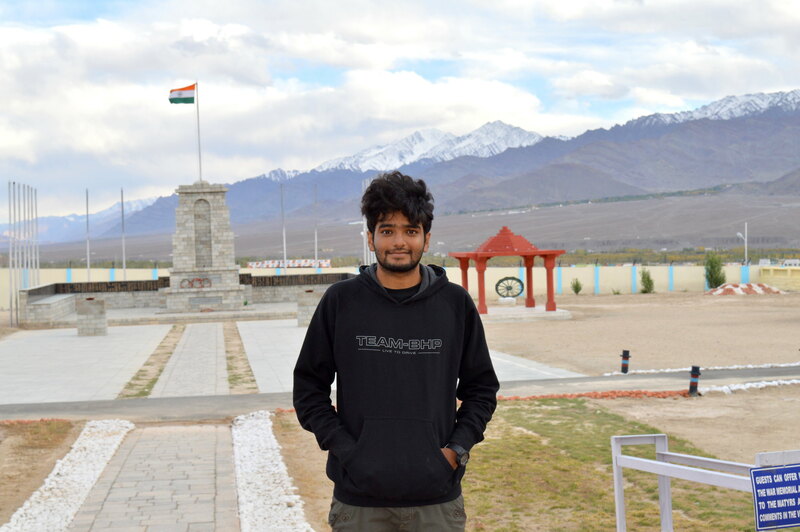 Being from an Army School, This place certainly holds a special place in my heart. 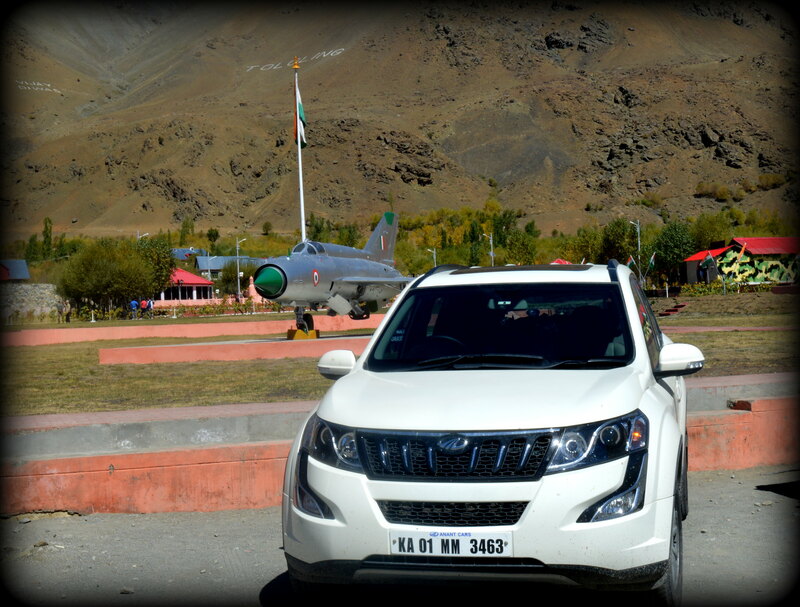 Had to go back to Drass to visit the War Memorial and pay tribute to the HEROES who laid down their lives for us. 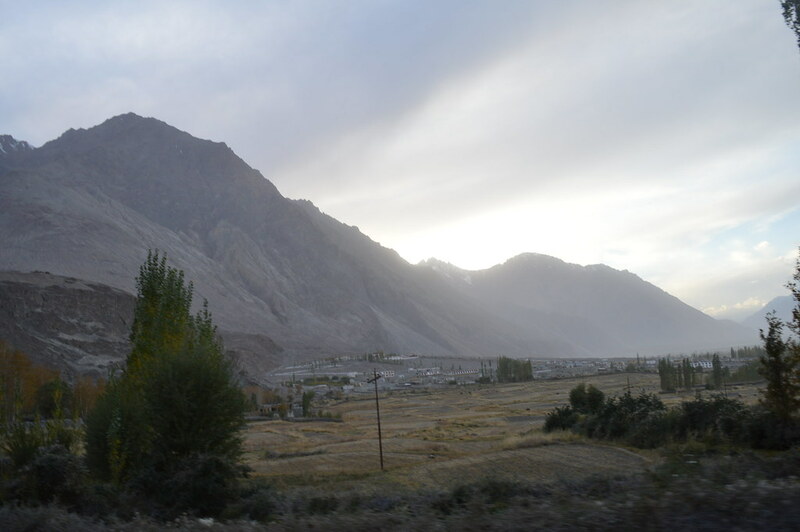 Departed from Kargil around 1PM and drove across mountains & mountains to reach Leh at 10PM With couple of breaks. 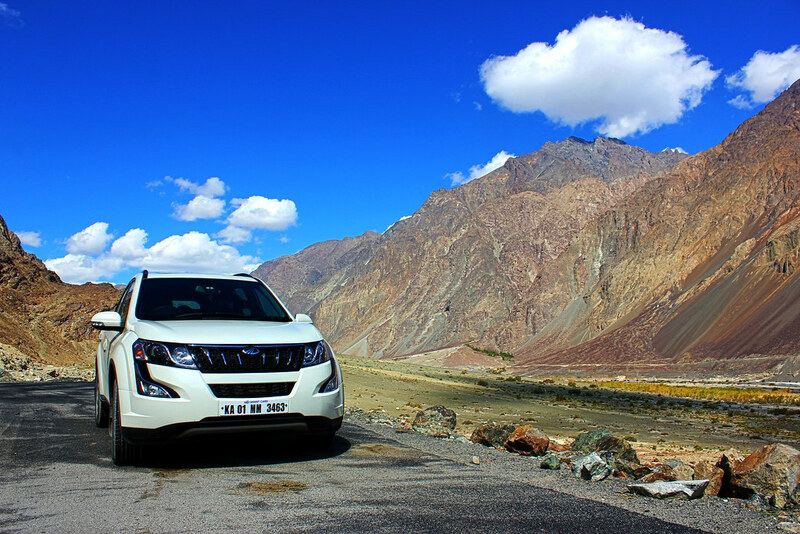 Every mountain was charismatic in its own way, easily one of the best driving experiences of my lifetime. The only “rest day” of the trip. 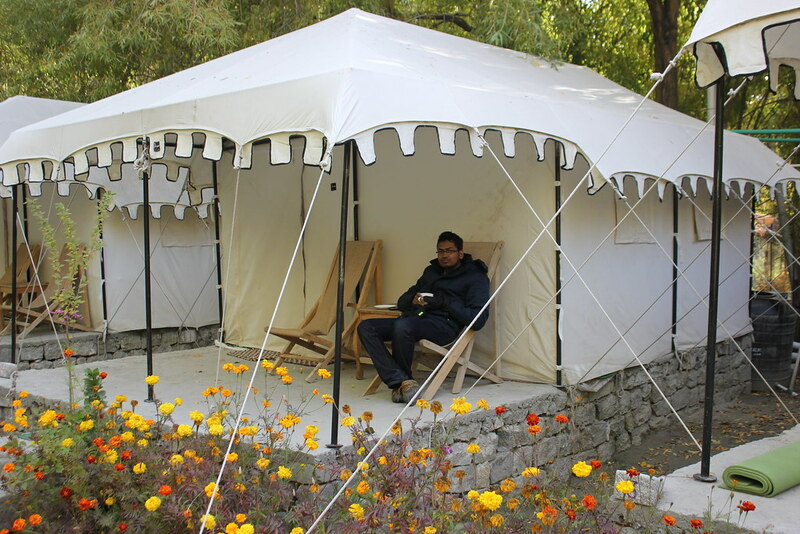 Woke up around 11AM and had breakfast in the lovely garden area of the hotel Kidar. *First things first, Inner Line Permits : It was a breeze to obtain them. Simple and hastle-free paper work which was done in half an hour. The officials were very co-operative. 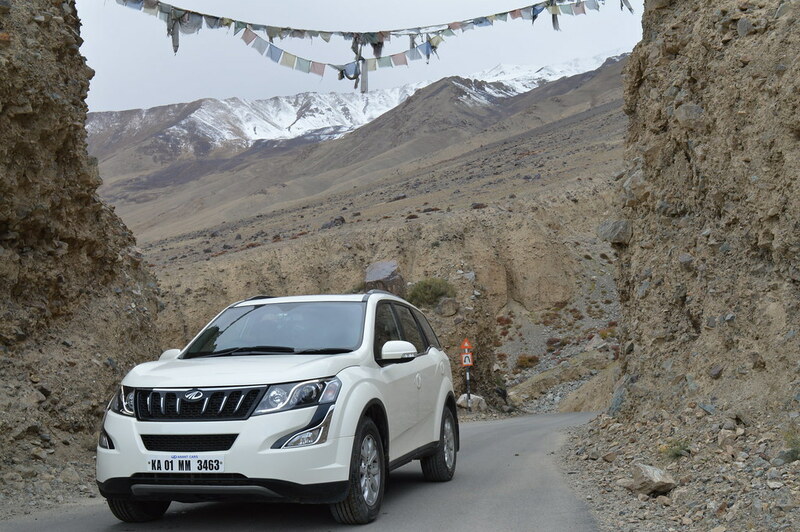 *Headed towards Leh-Ling motors(Authorized Mahindra dealer) for my 2nd free service of the car. 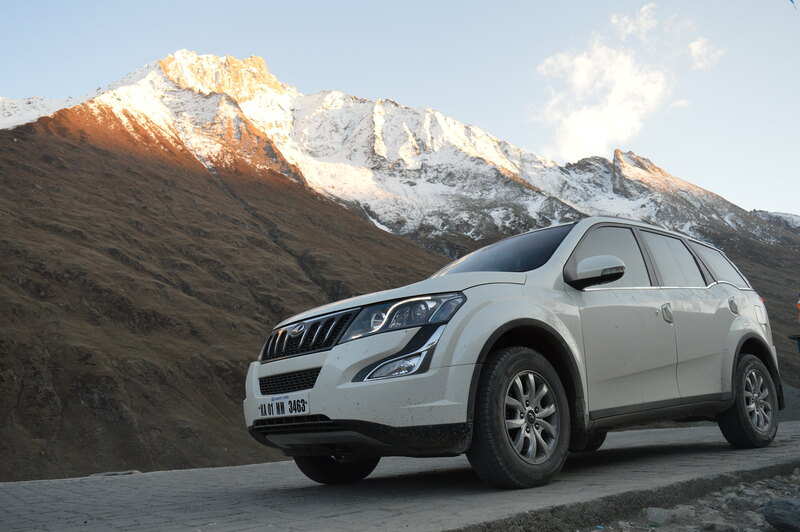 It was an out-of-the-world experience to get the beast serviced at 11,564 Ft . 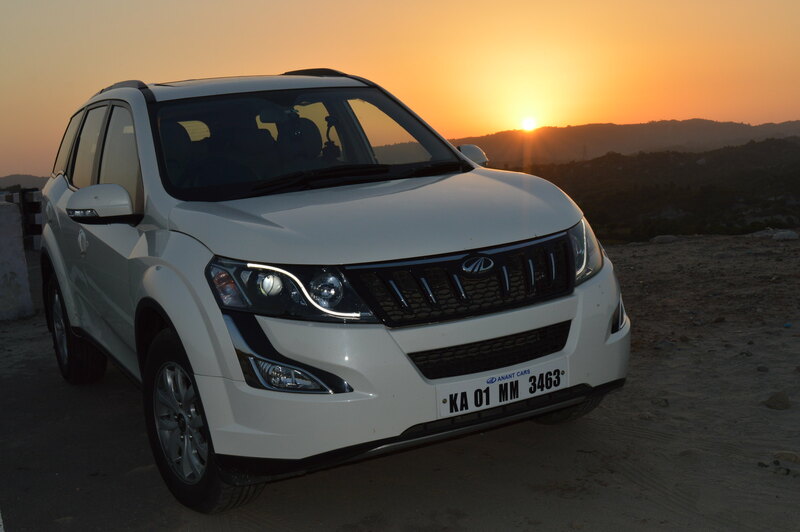 The 2nd free service comprises of changing the AC Pollen filter and the normal check-up. 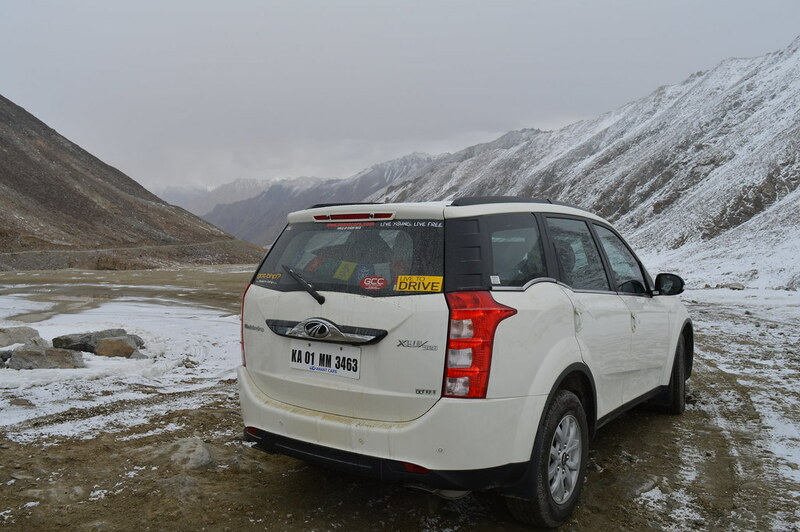 But, unfortunately, the Service Adviser told that due to the cold weather conditions of Leh, they do not have stocks of AC pollen filter and hence, only the check-up was carried out with a thorough wash which left the car sparkling. 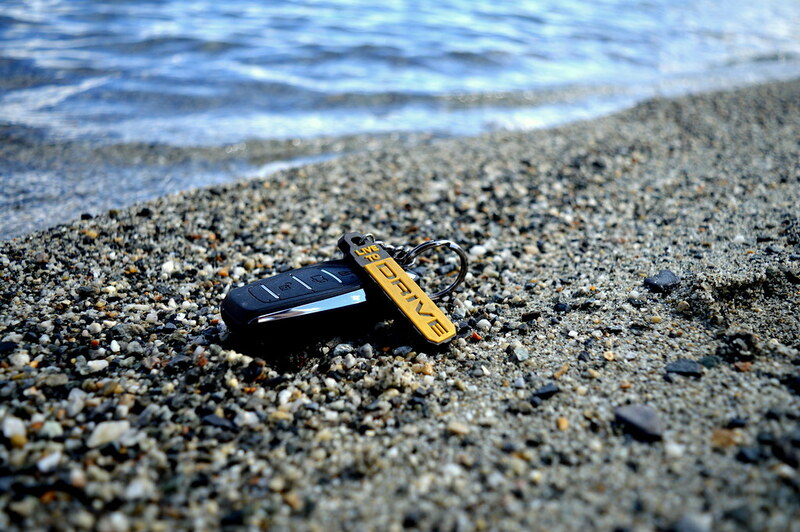 It was right time to get the GPS rectified as it would be needed the most in the coming days. Kudos to the gentleman who took every effort to get it rectified. 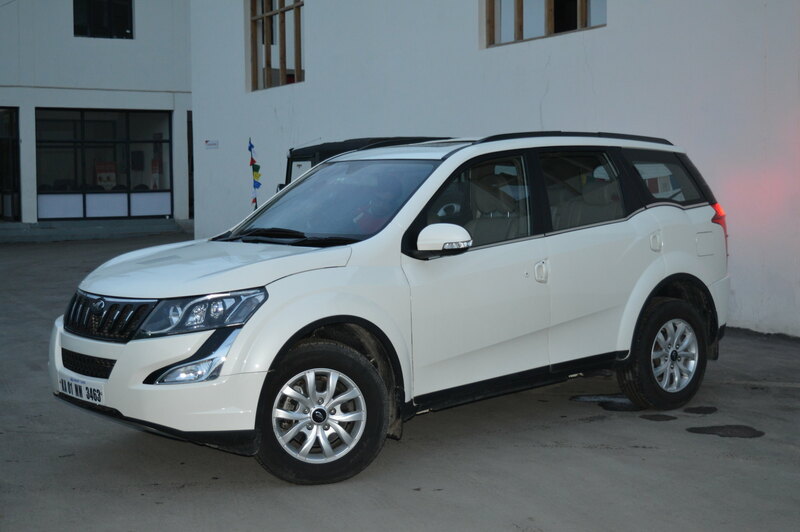 He made a few frantic calls to Delhi and rectified the problem because it was never carried out before at this Service centre as hardly any XUV’s come here for servicing. That’s a neatly done THAR! 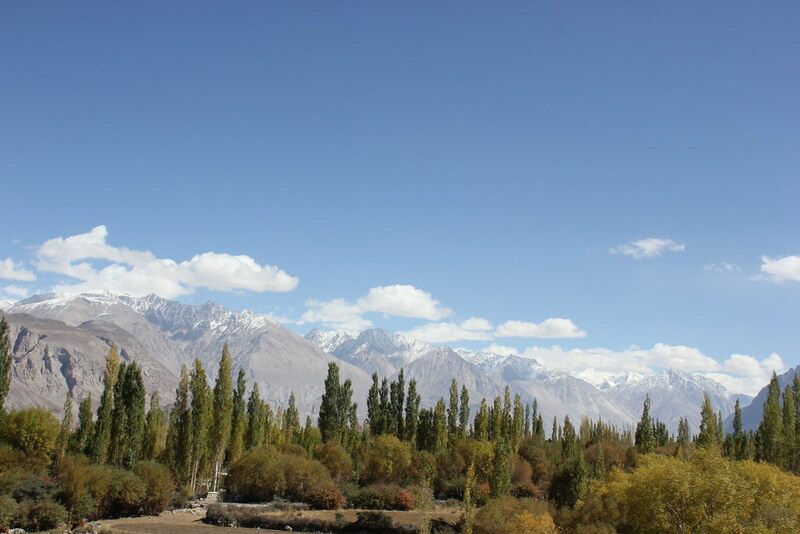 *Proceeded to Leh market for shopping in a local taxi(Omni), spent good 3 hours in purchasing the souvenirs and Kawa(A unique blend of Kashmiri tea). 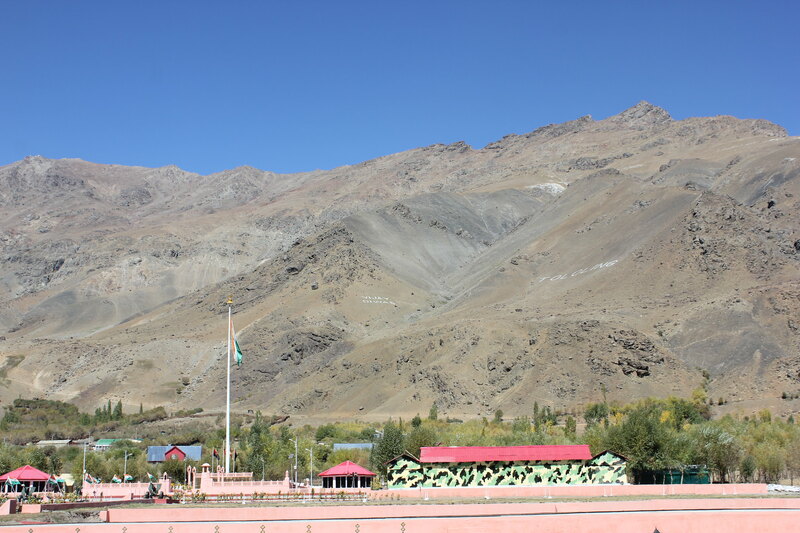 *visited the Leh war memorial. 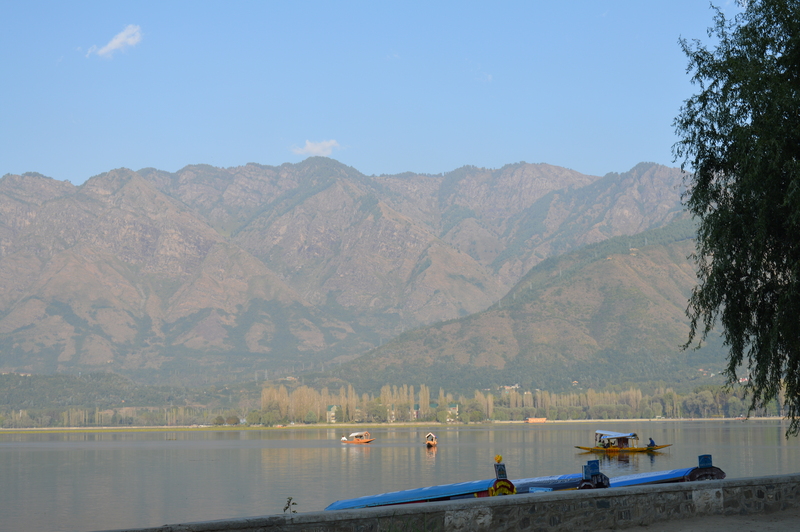 With the gigantic Himalayas in the backdrop, this was by far the best runway I had ever seen. 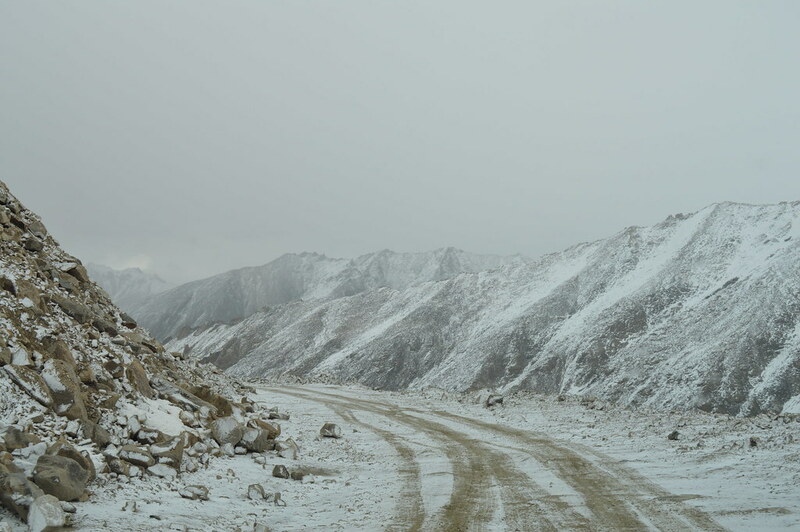 It was pretty cloudy and we heard from the locals that there are reports of fresh snowfall at Khardung La and this was enough to send shivers down my spine and was equally exciting. 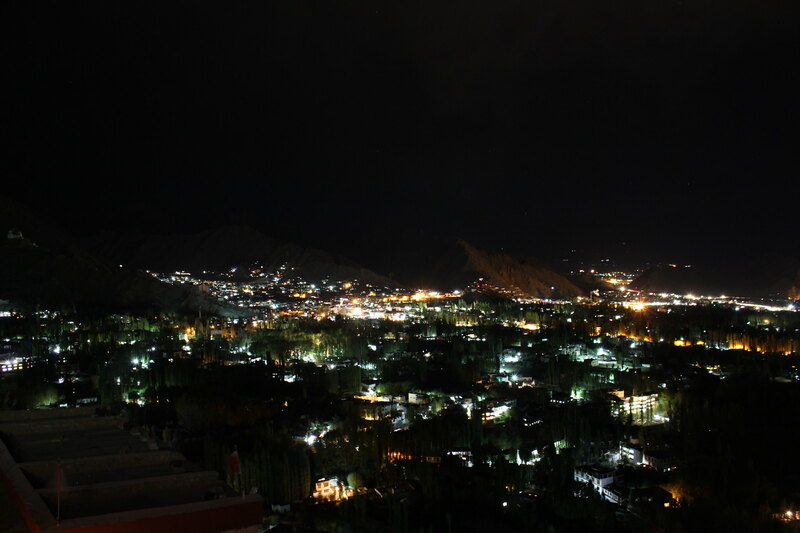 *Shanti Stupa at night offered lovely view of Leh with beautiful stars in the sky. 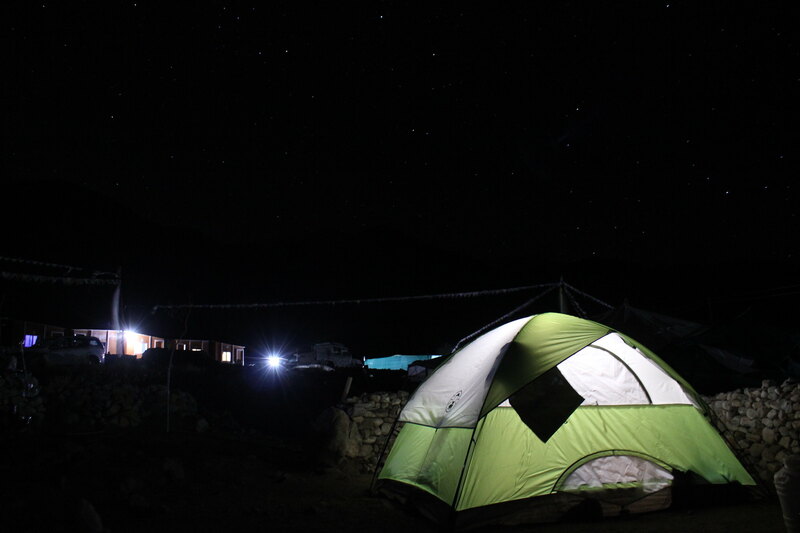 Hit the bed pretty early as we were to brace ourselves to the mighty Khardung La the next day. If I had to to re-live one day of my life, it would be this day. Had a much-needed sound sleep the previous night as we were aware that our capabilities would be tested to the maximum today. 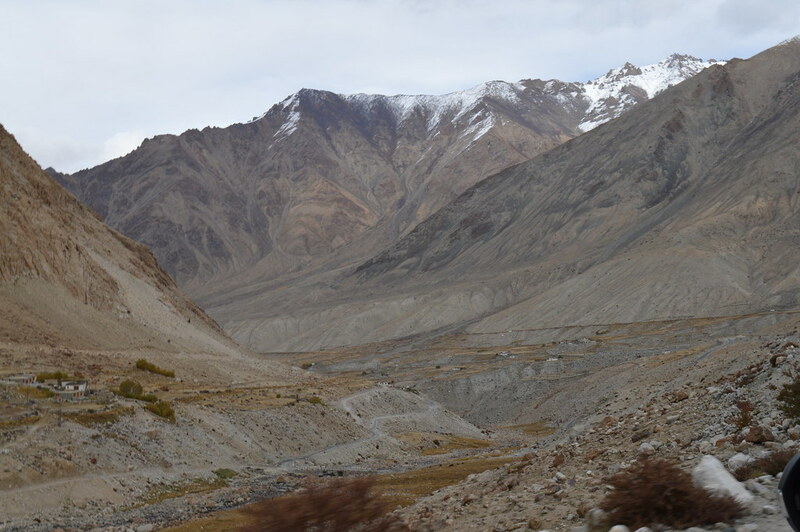 Left leh at 9 AM and the altitude kept increasing every minute. 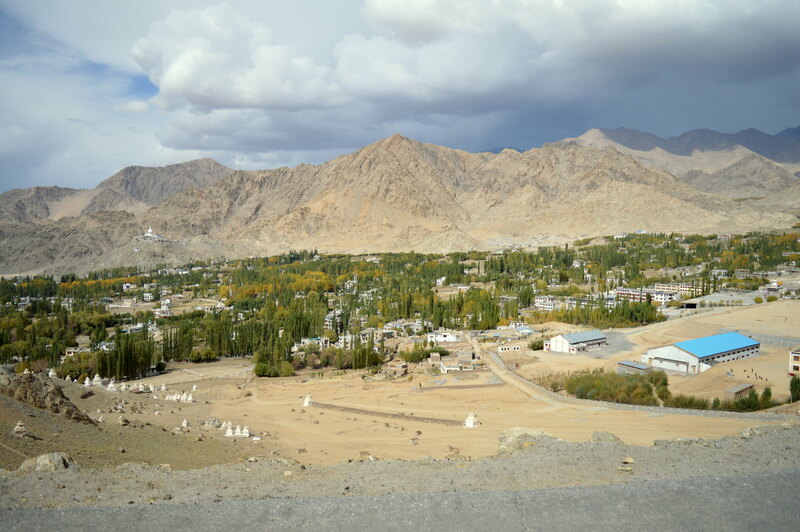 Soon the concrete buildings of Leh city disappeared from the rear view mirror and we were welcomed by the barren and equally majestic mountains. 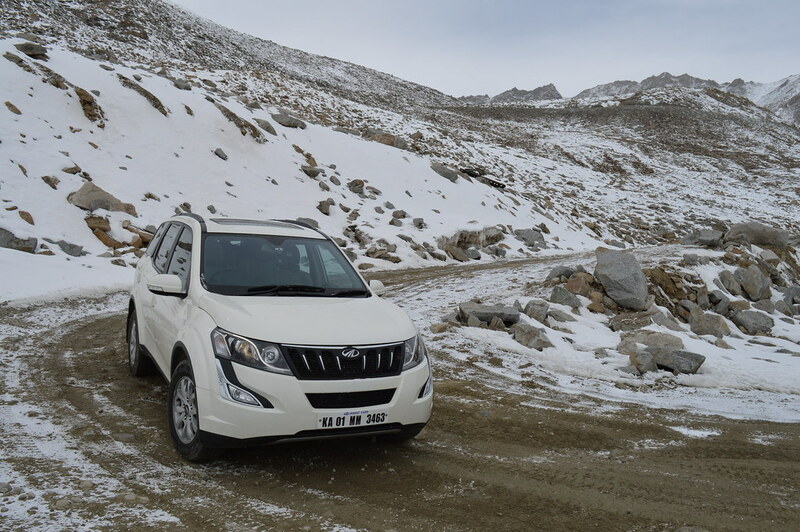 I knew that if I could do Zoji La, Khardung La was an equally seamless affair but was bound by 2 constrains: Altitude & Snow! I wasn’t wrong. 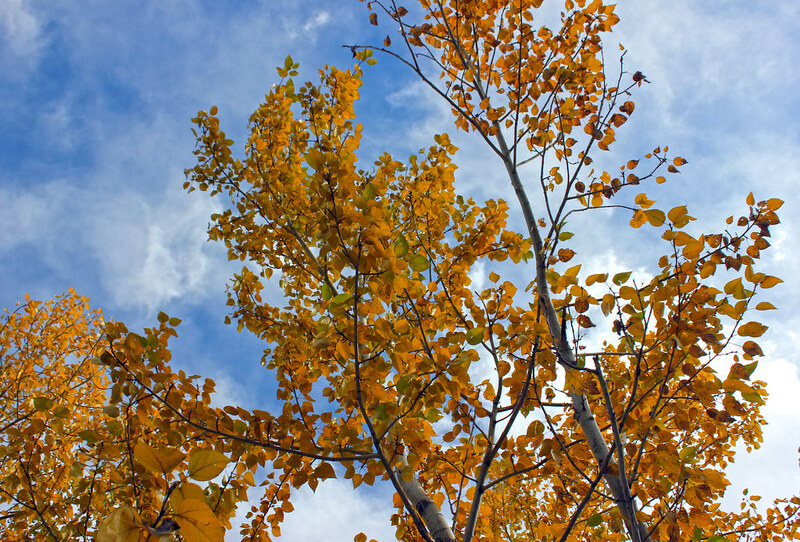 Most of the time during the ascent, I did not have the advantage of shoulder while the one who were descending had it. 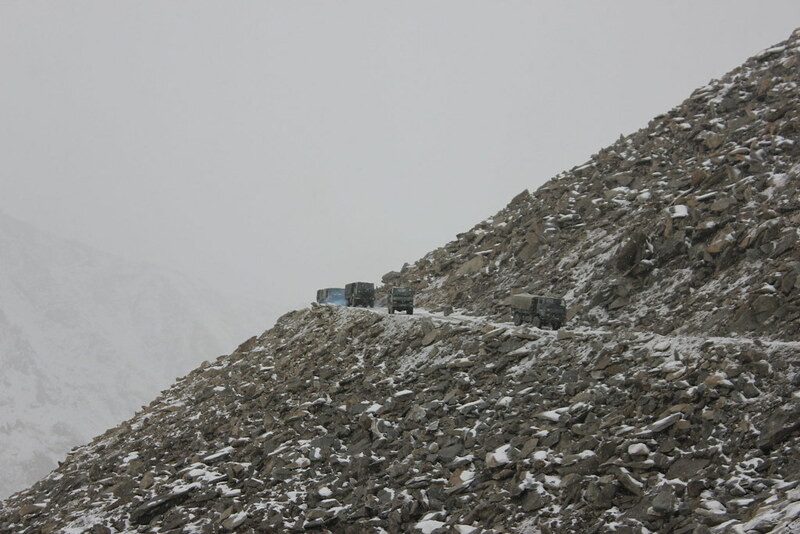 There were times when it was really challenging to let the Army convoy pass with just a few cms of clearance on either sides which meant that even a smallest error could prove fatal. To make things even more challenging, it started to snow! 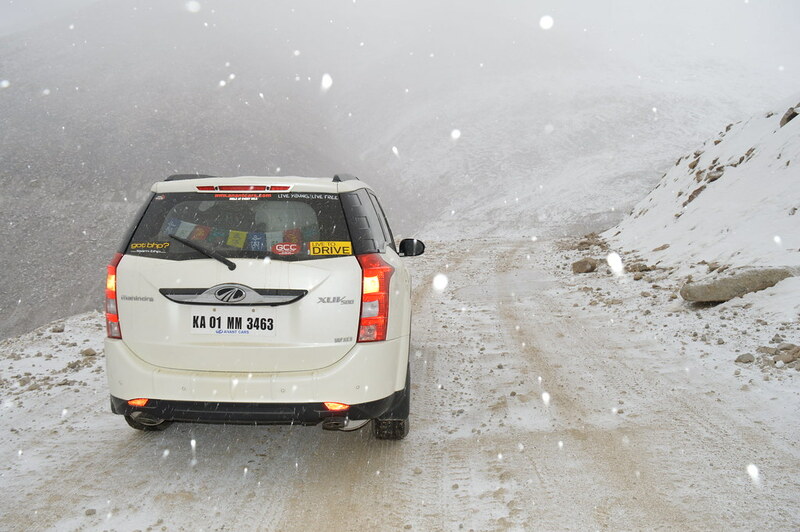 Kudos to Apollo Apterra’s for performing seamlessly at such conditions. 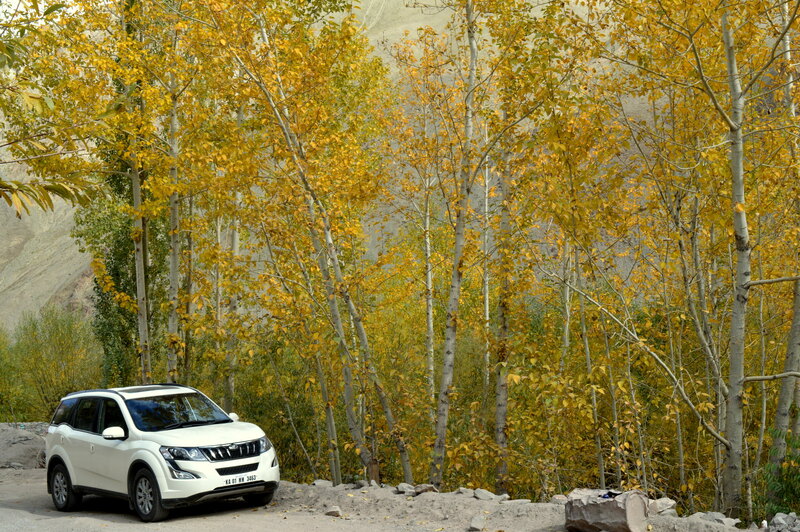 The traction was less but they performed at their best, probably an AWD would have made things simpler. 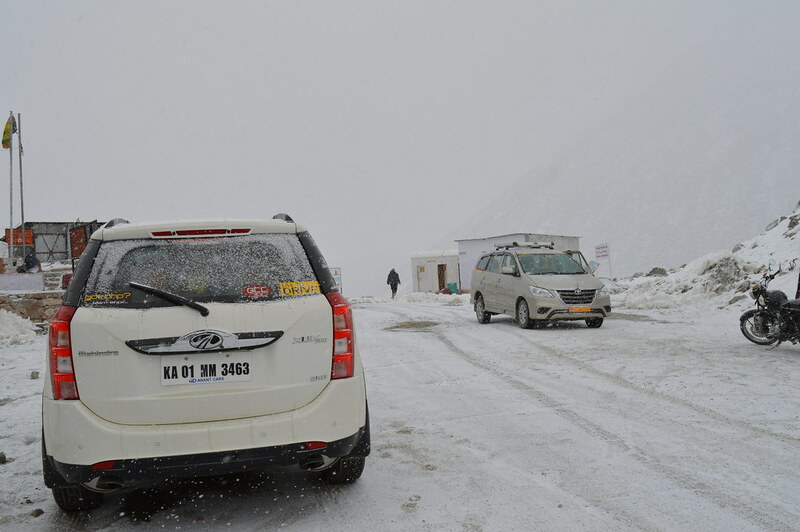 Took a one-minute break and continued the expedition to reach the “Highest motorable road in the world – Khardung La pass” at 18,630 ft.
We were told by the Army not to stop for more than 20 minutes as the weather was getting harsher accompanied by strong cross-winds. 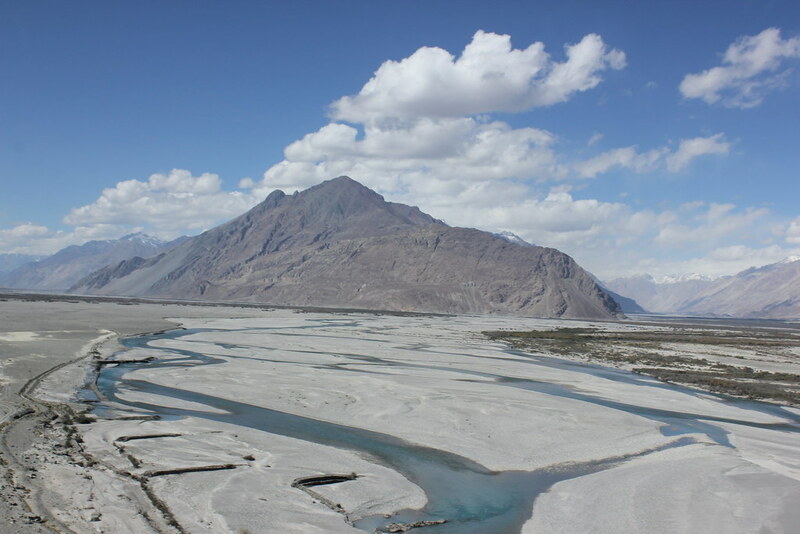 Continued the journey to Mountains, rivers, plains and plateaus to reach the destination for the day, Turtuk. 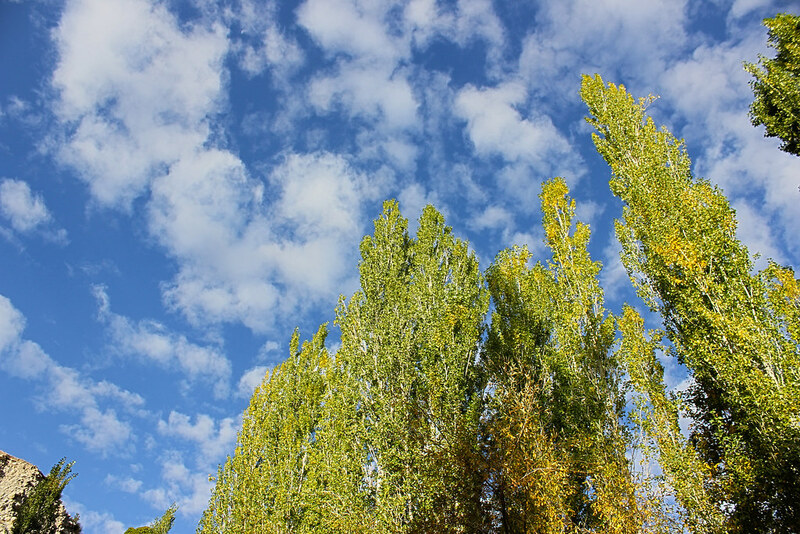 Took two breaks of half an hour each to rejuvenate with the nature, Apart from the multiple photo-stops. Crossed Hunder en-route and what a lovely place it is. 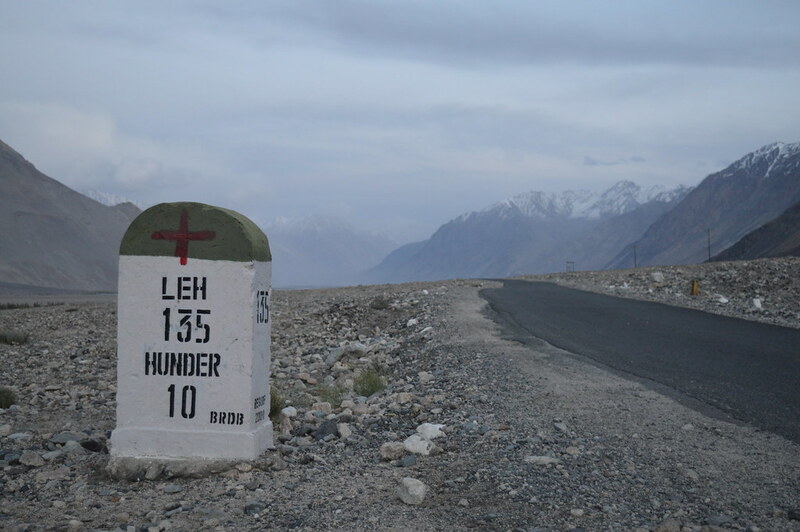 I was asked to show the permit at the checkpost at Hunder and once more at Siachen Base camp where it was 9PM already. 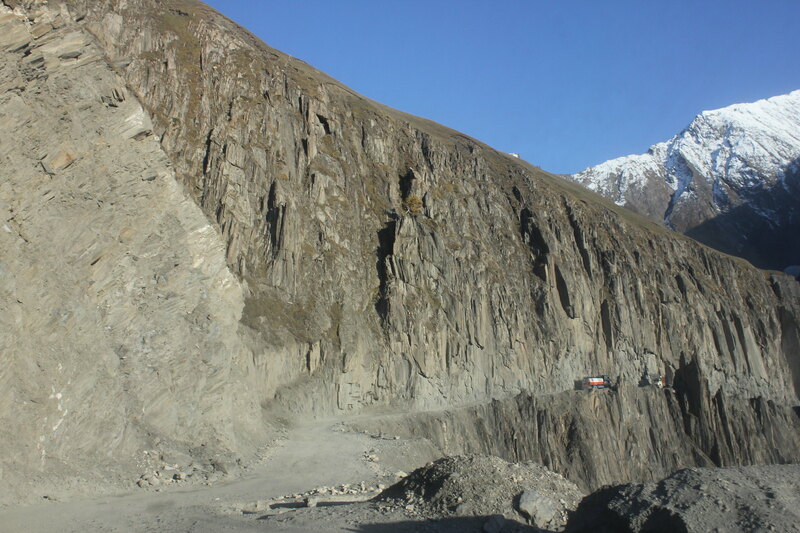 A stretch of the road was completely broken as there was a landslide very recently. 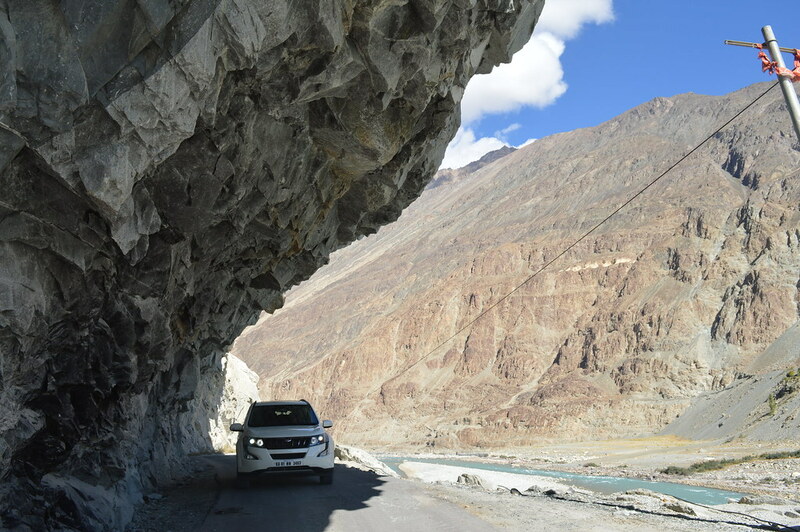 The road was shattered to such an extent that others had to get down from the car and clear the obstacles which clearly indicated that the rocks had fallen-off after the last vehicle had passed on this road. 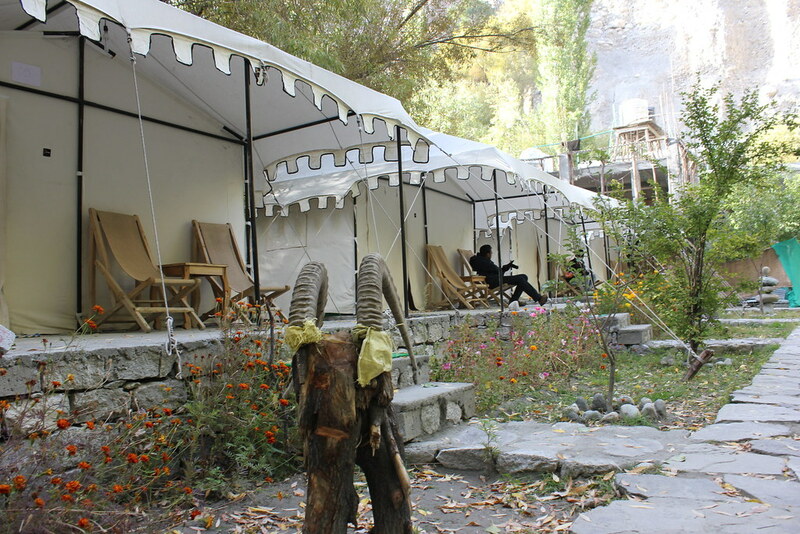 We reached Turtuk Holiday Camp and it was one of the best places I have ever stayed at. 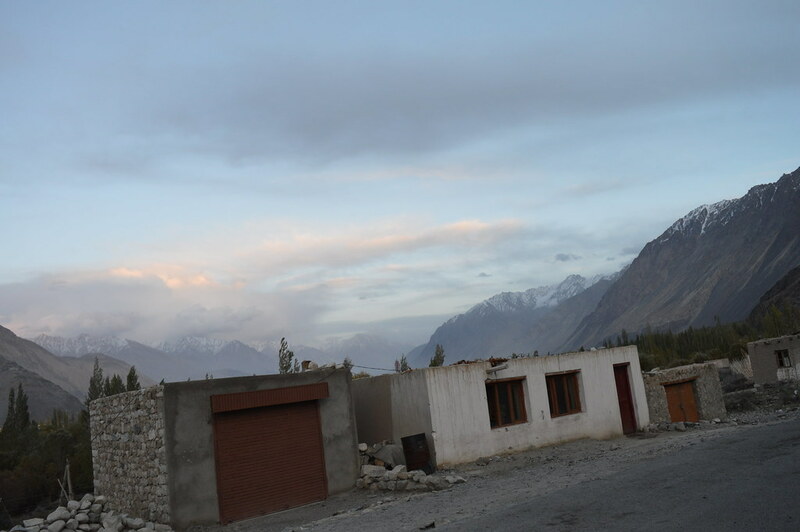 We were warmly welcomed by the host Mr. Rashid who contacted the Army at check post to know if we had crossed and got a positive response from them and accordingly had made the necessary arrangements. He served us lip-smacking dinner at 10PM. The best part is that all the veggies are grown organically at their garden. The day started pleasantly with a sip of coffee and lip smacking breakfast. 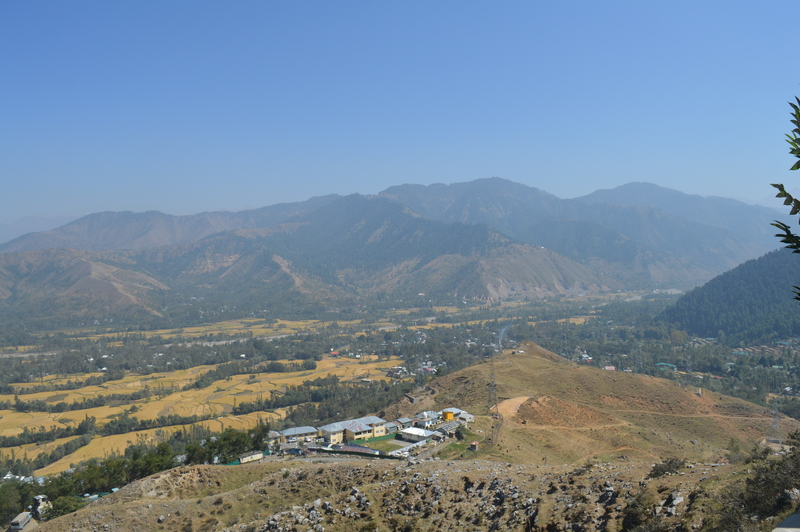 We could go for another 2 Kms which would be the last point for civilians on this side of the border. 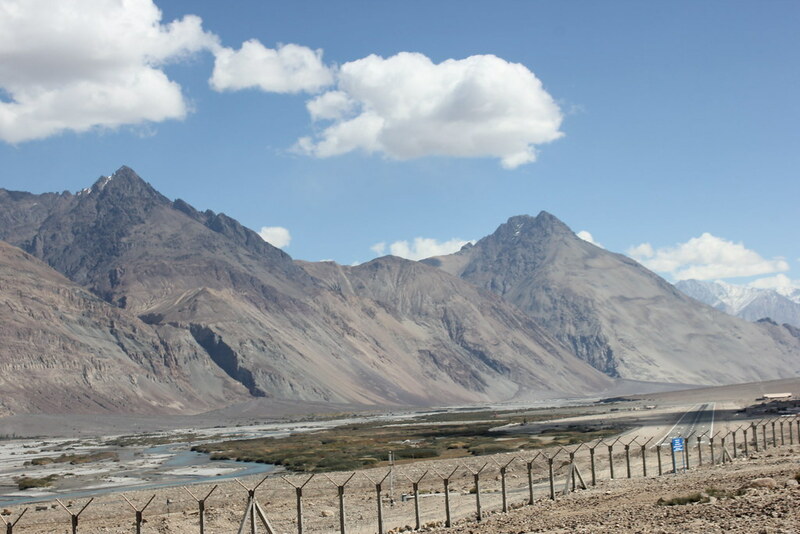 We reached the check post which was heavily guarded. 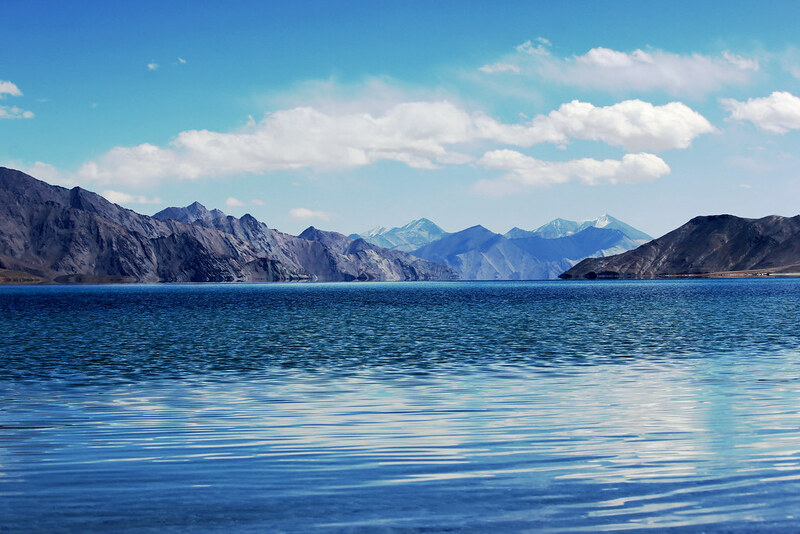 When requested upon proceeding further, We were politely refused as it would be too risky. 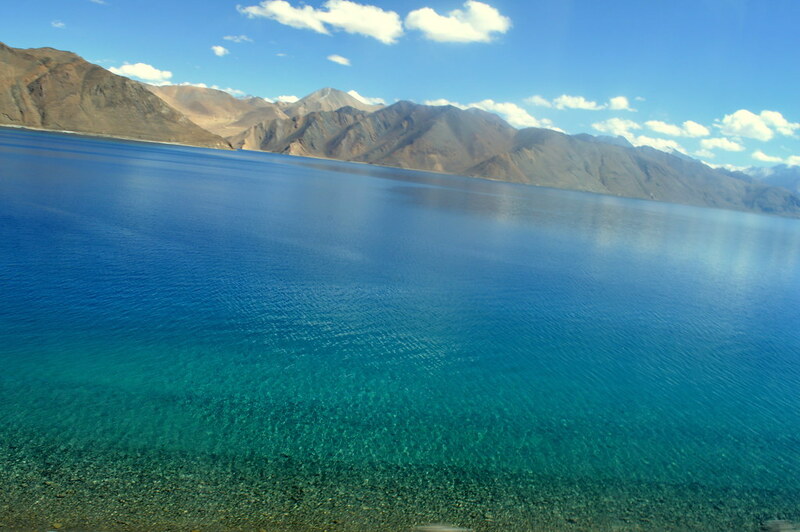 Headed towards Pangong Tso and no words of the English dictionary can describe its true beauty. 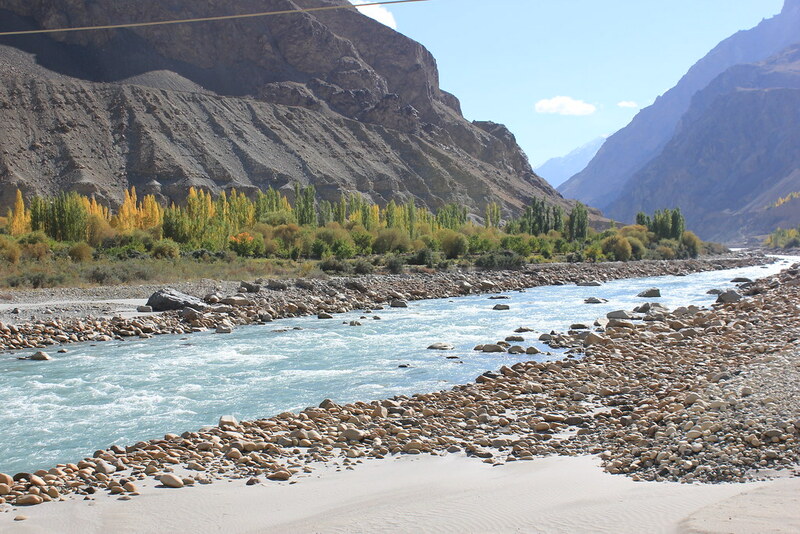 There was a point where I had to decide between 2 routes: Agham-Shyok OR Wari-La. 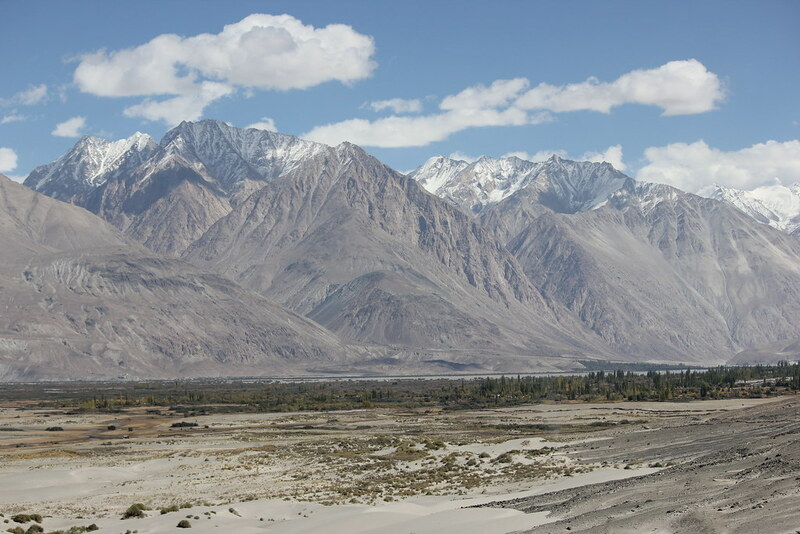 According to the tentative plan I had planned through Wari-La because as per the information, I knew that Agham-Shyok would be extremely difficult for a 2WD vehicle. 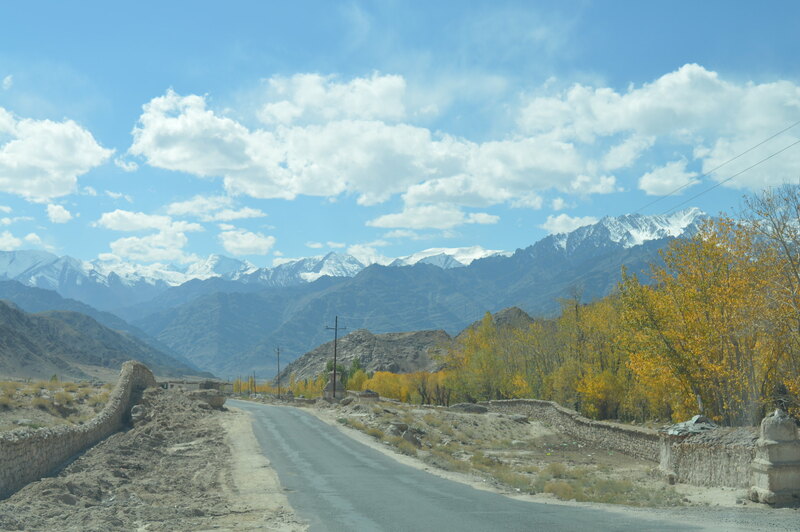 But when we enquired with the local taxi drivers we were told to proceed through Agham-Shyok as fresh snowfall was reported in Wari-La and Wari-La would take a lot of time than the Agham-Shyok. 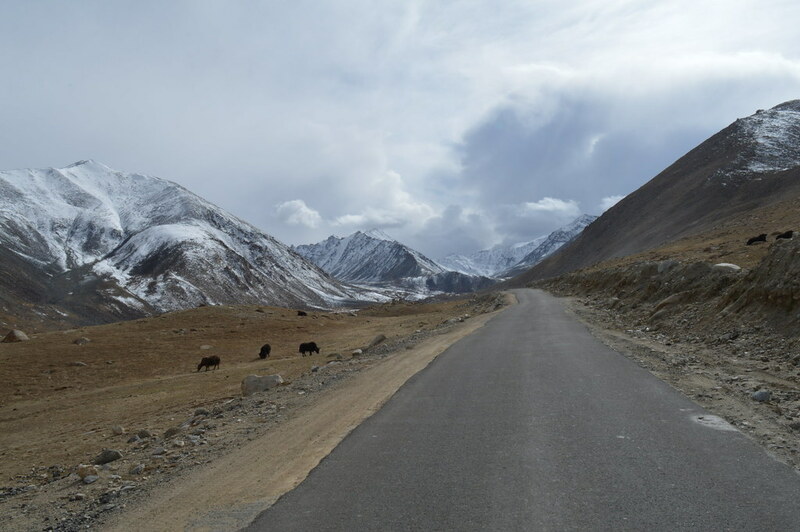 Taking the Agham-Shyok route meant that I had to be prepared for a couple of under body hits(with a GC of 200mm). 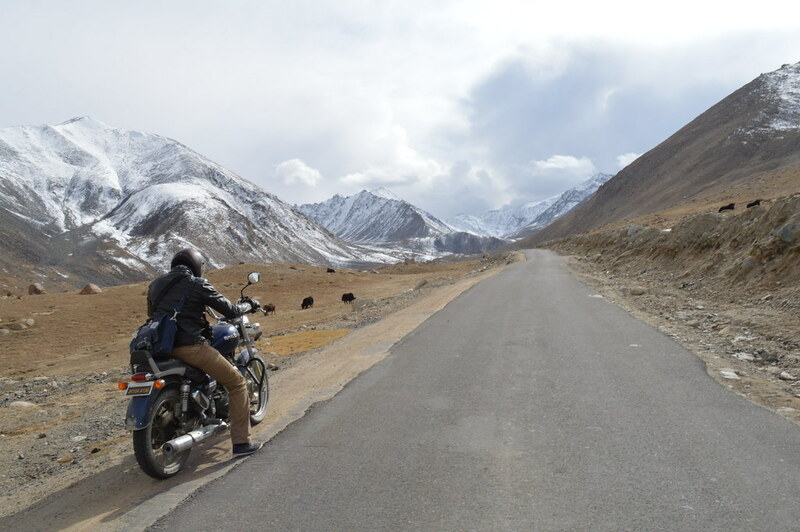 A few words on Agham-Shyok route: The toughest stretch of the entire 9000 Kms trip. Basically No-road for 4 hours. 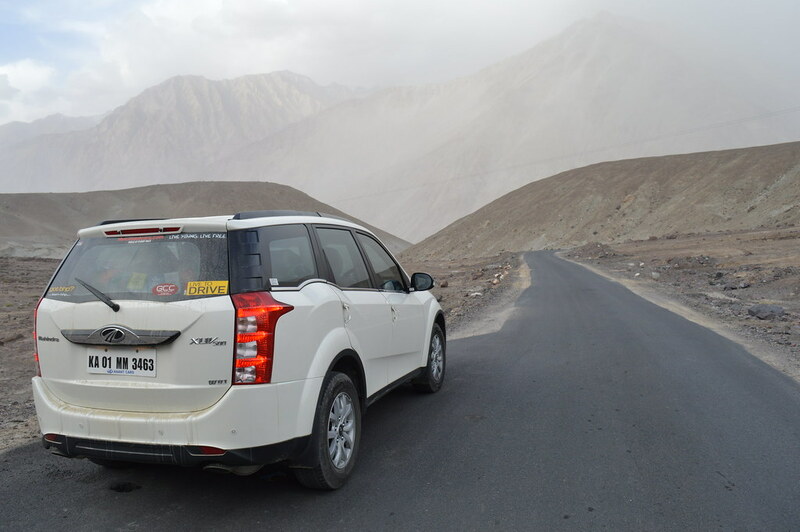 By telling No-road I am not referring to muddy road, It refers to An extremely tough terrain with mud, stones, sand and gravel which doubles-up as a river bed in some places in the months of June and July. 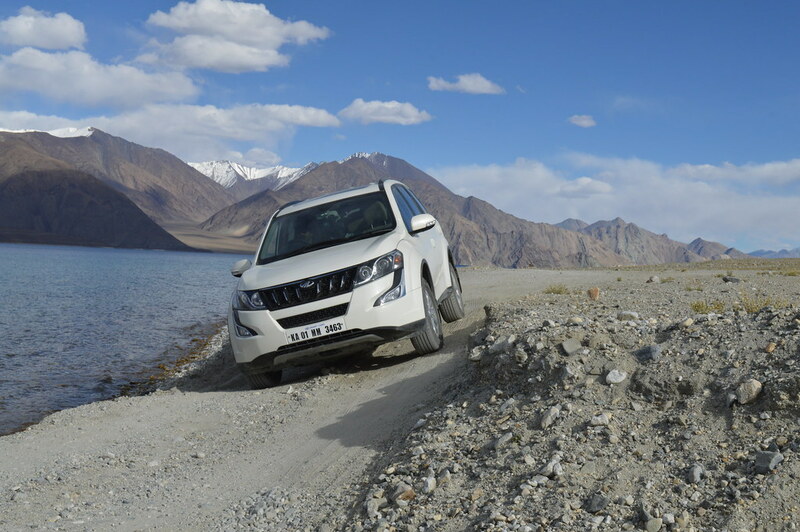 There was a particular inclination of 40 degrees approx which had loose-mud and stones which required 3 trials to pass through as the tires lost all the traction. There were couple of such “obstacles” in the stretch which resulted in a broken Sump-guard at the end of the day. 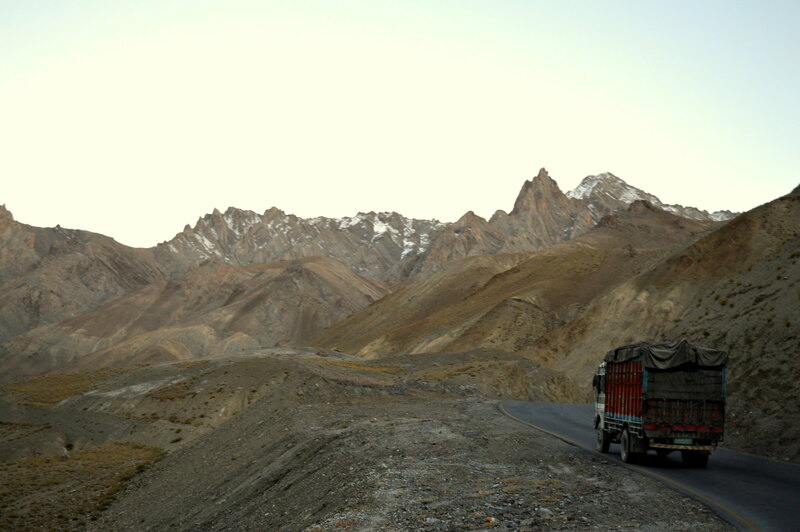 From Shyok till Pangong the roads were relatively much better which looked like a highway after the previous horrendous stretch. 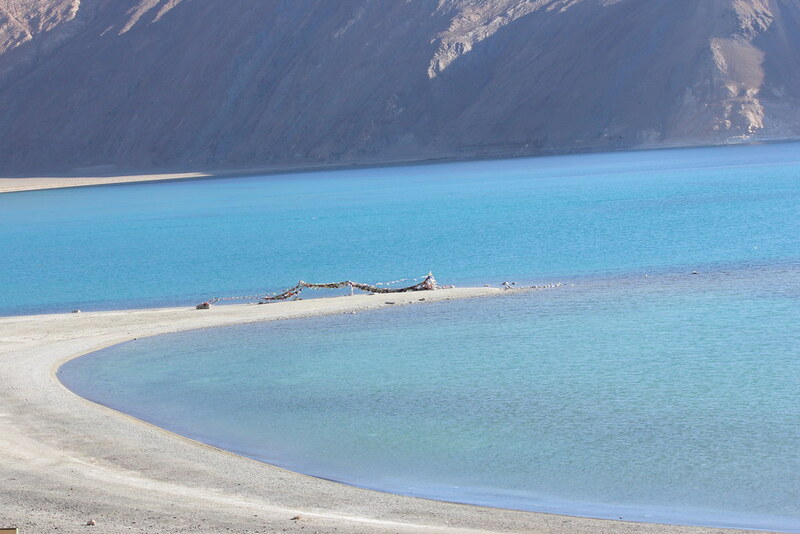 Reached Pangong at 7 PM and it was extremely cold, The temperature was 2 degrees. 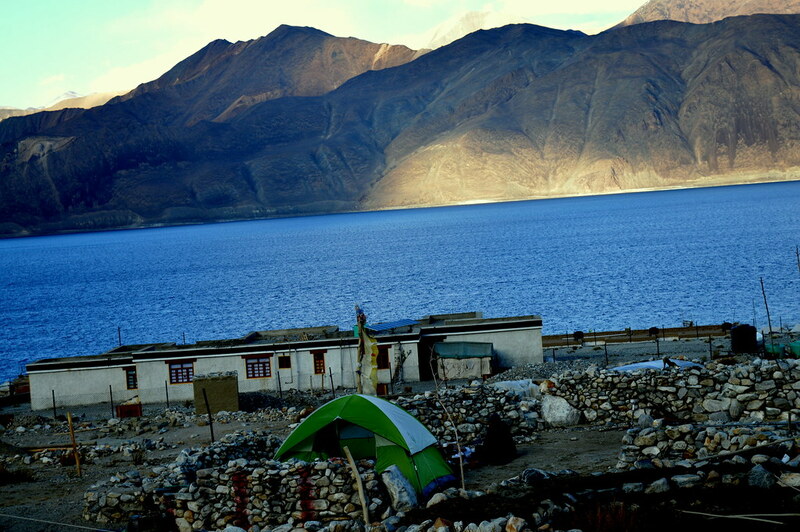 We pitched our camp at the premises of hotel Pangong-Inn and rented a room for the night, Just-In-Case. 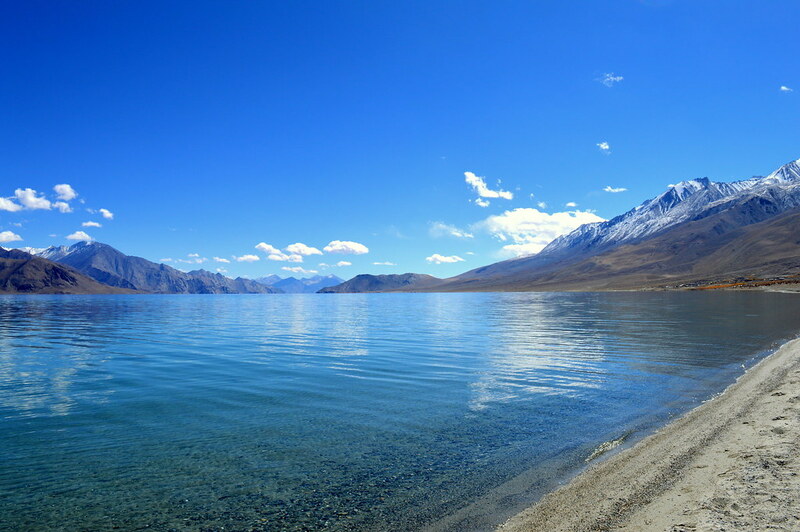 We had our dinner at Pangong-Inn and it was decent enough to fill our stomachs after an exhaustive day. 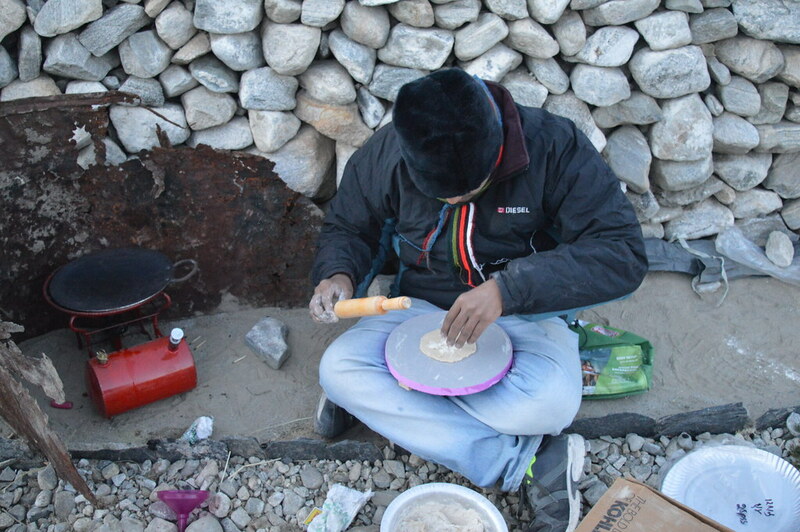 The temperature dropped to sub-zero around 11PM, Me and Vibhu moved into the cottage in middle of the night. 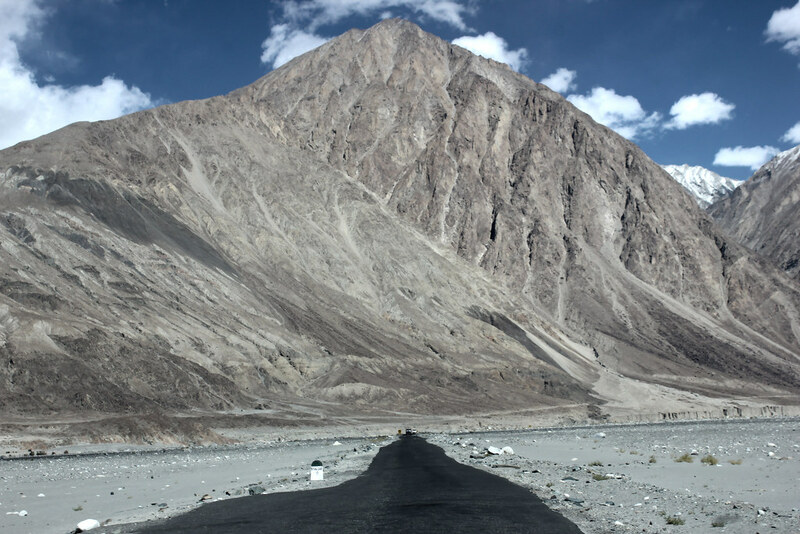 Initially the plan was to proceed to Tso-Moriri but we were told by the locals and the Army that the Road ahead is in a very bad condition as the recent Landslides have destroyed most of the road but it wouldn’t be as worse as Agham-Shyok. 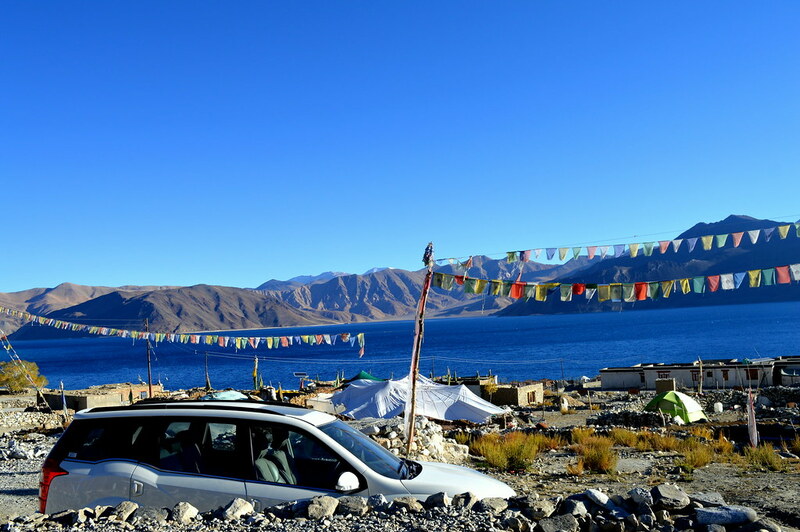 I had multiple discussions with the locals and came to a conclusion that it would be really difficult to drive down to Tso-Moriri. 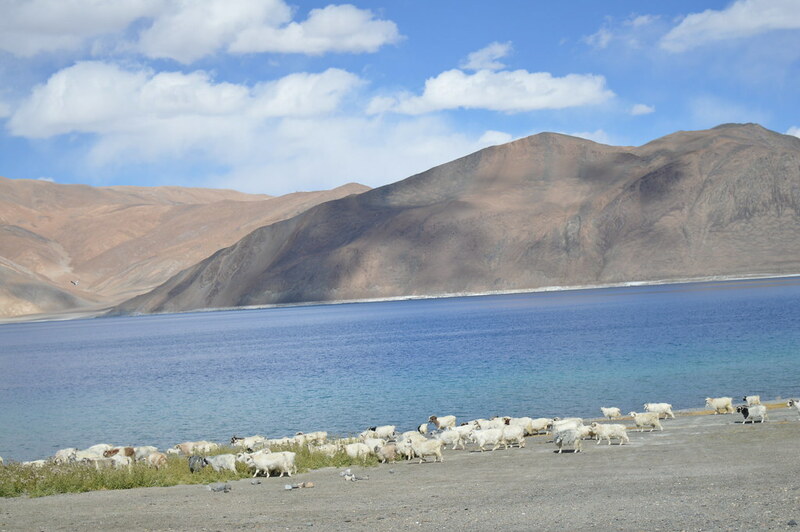 We decided to spend the day at Pangong and head back to Sarchu the next day. 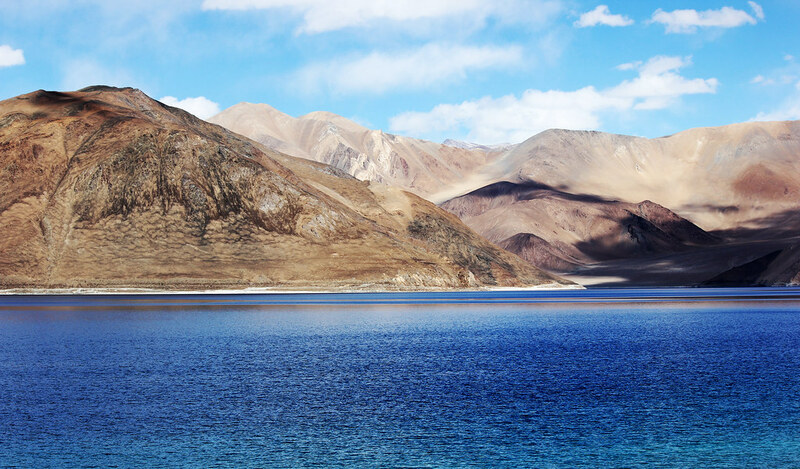 Explored the beauty of Pangong and we were completely mesmerized by its landscape and changing colors. Decided to cook our own dinner and this turned out to be a mistake. Read on..
As a kid, I always admired Le-Mans 24 hours race. 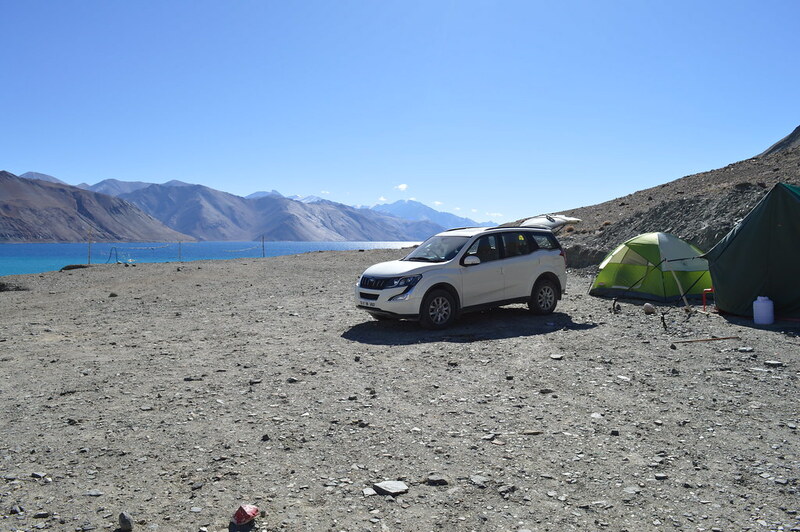 Little did I know one day I would end up driving continuously for 18 hours in the mighty Himalayas at an altitude north of 10,000 Ft. left Pangong at 8 AM and crossed the Chang-La pass. 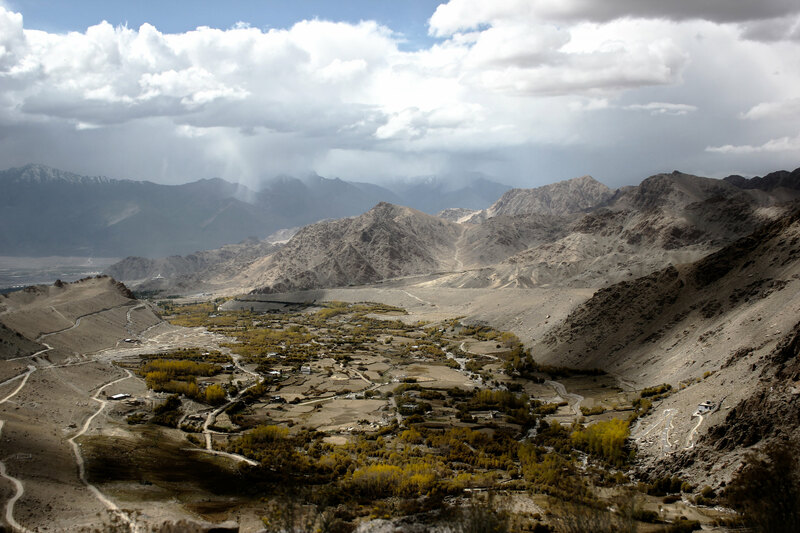 The magic of Himalayas is such that you feel like stopping at every turn to capture the beauty in your lens and still you can barely come closer to the reality. 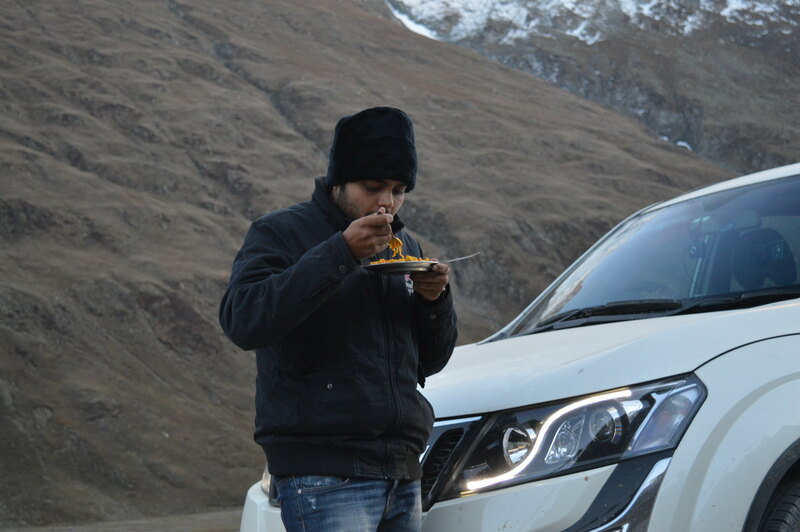 The food started to take a toll on Vinay, It wasn’t healthy as expected and he was sleeping for most of the day. 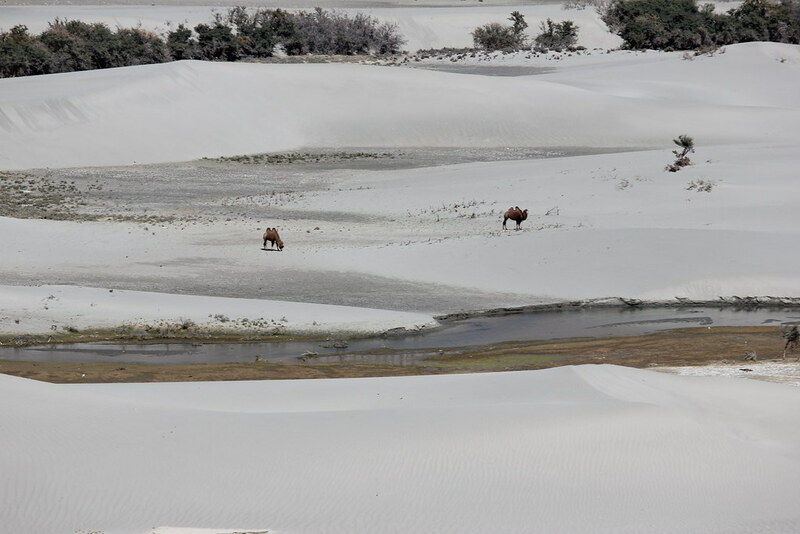 We spotted a group of horses gazing around in the barren land. I kept driving and the road started to detoriate as BRO was carrying out some repair. They were huge potholes and I was motivated after spotting a red Punto 90 HP. Had a word with the group who were from Delhi and we exchanged few tips on the condition of the road on either sides. 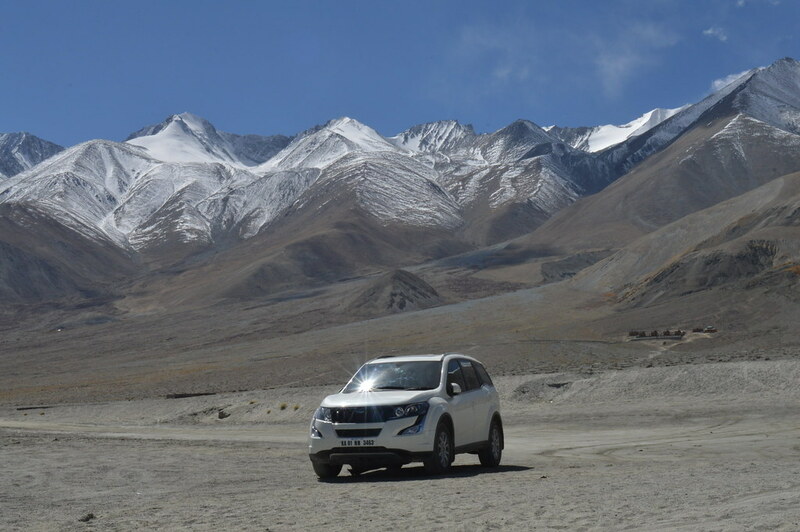 It was relatively challenging to drive on that terrain which had drastic changes in the altitude. 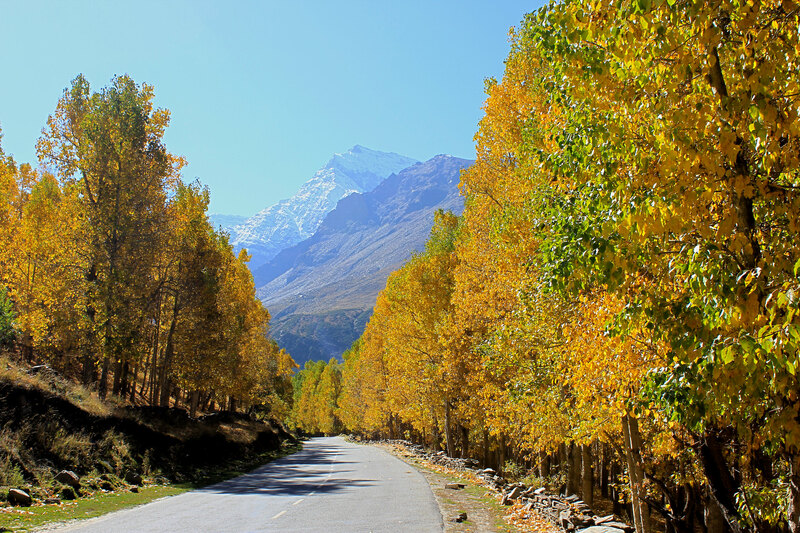 We now came across one of the most beautiful roads to drive in the country, with mountains on either sides and the road was like a runway! 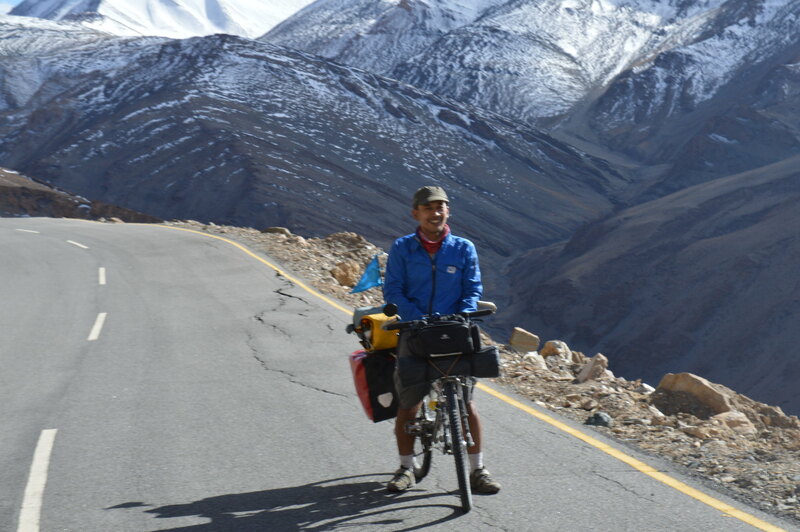 We met a cyclist from Indonesia who cycled down from Leh and was proceeding to Manali. 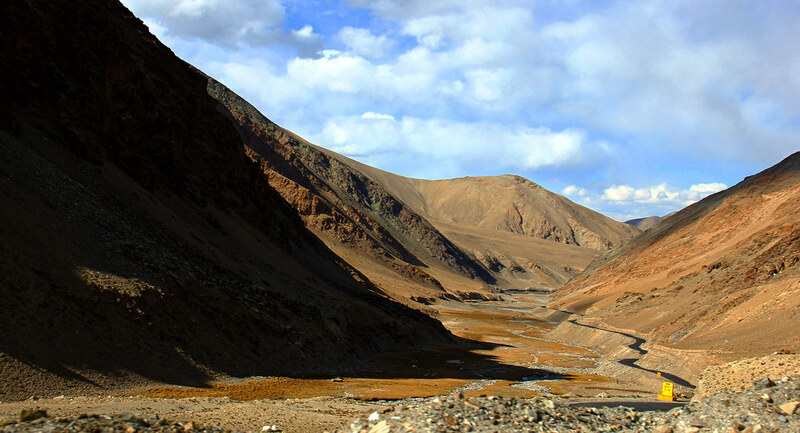 It was nearing dusk and we reached Sarchu at 10PM. Much later than the ETA. 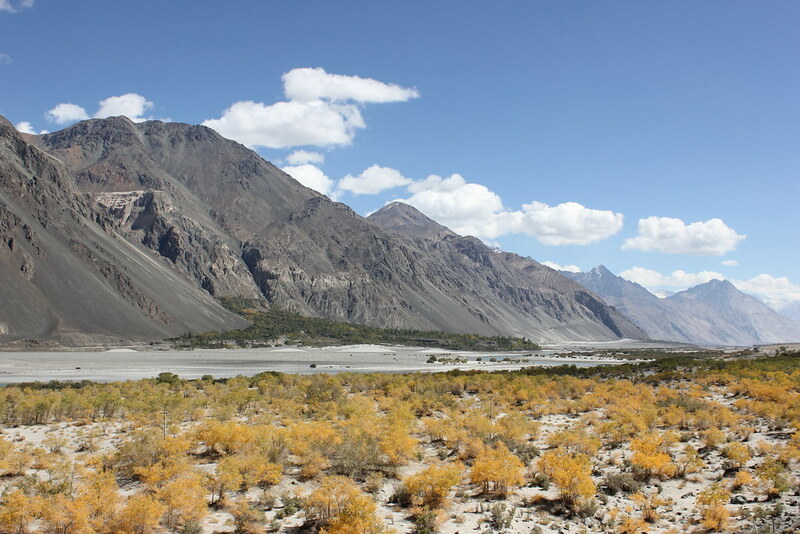 As per the original plan, I had decided to halt at Sarchu for the night but the harsh weather in Sarchu made us think the other way. 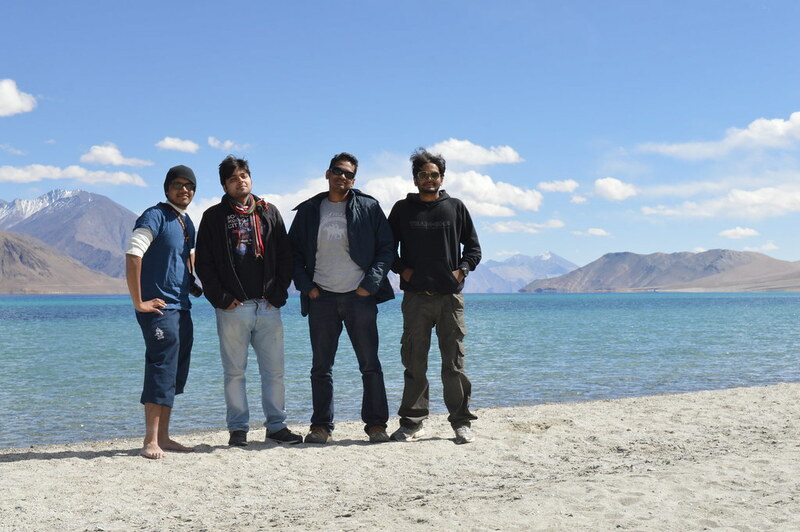 We met a really good group of bikers from Chandigarh who had done the Leh circuit couple of times in their RE’s. 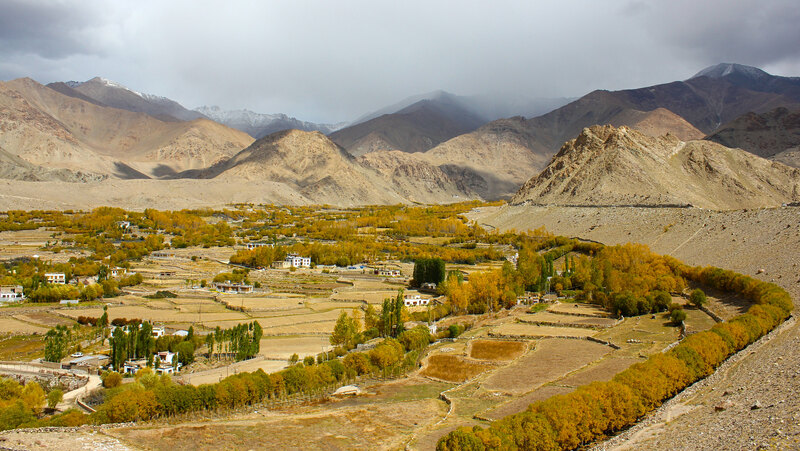 They strongly recommended that we head to Keylong for the night as the accommodation in Sarchu was bare-minimum with just Tin-sheds and the temperature was already sub-zero which meant we had to be prepared for the mercury level go down upto -10 during the course of the night. 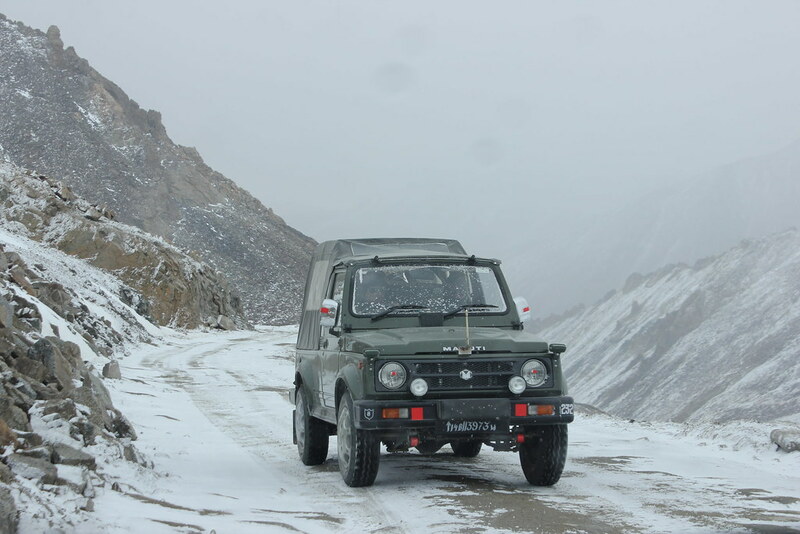 I was told to be extra careful as we would be covering the Baralacha La(16000 Ft) at night which would be slippery as few patches of snow on the road are expected. 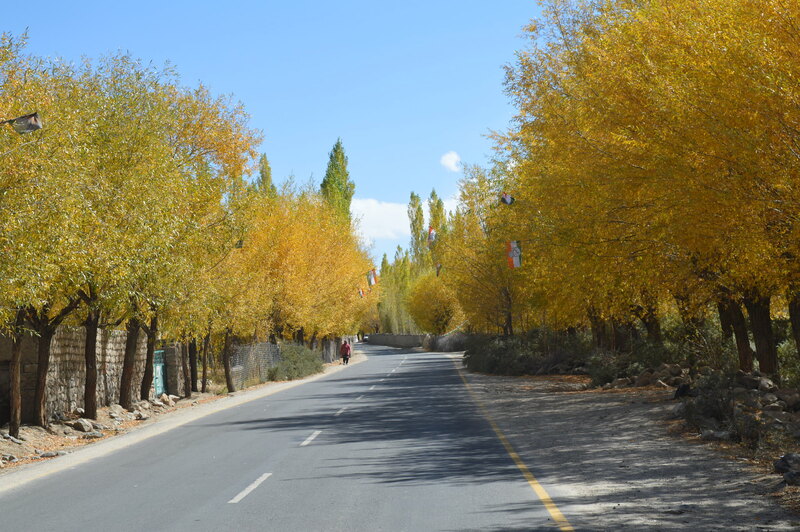 We had a lovely tea break and with full determination I made up my mind and was pretty confident that I can still drive down to Keylong. 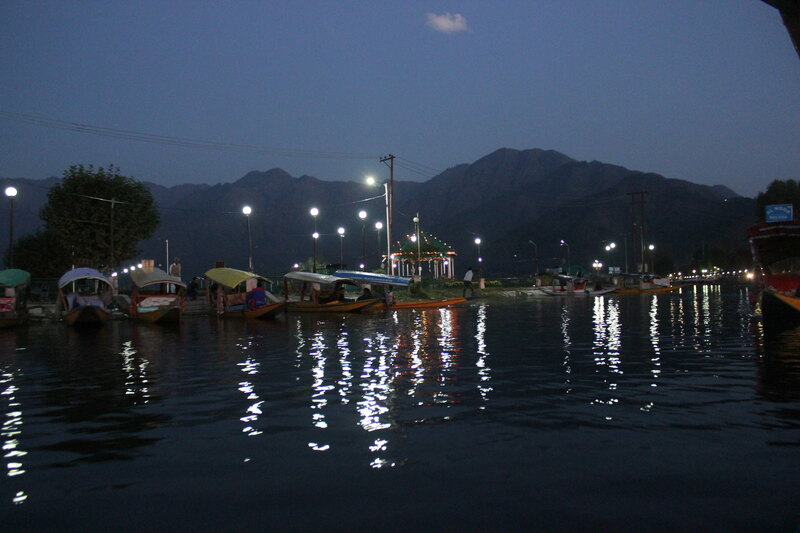 It was around 10:30 PM and we started with the 2nd part of the journey for the day which was quite challenging. 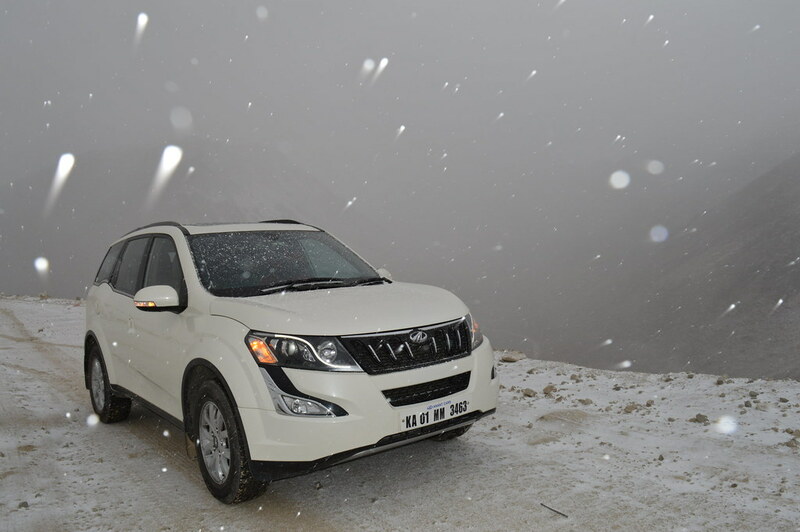 It was pitch-dark, so high beam+Fog Lamps was a must. 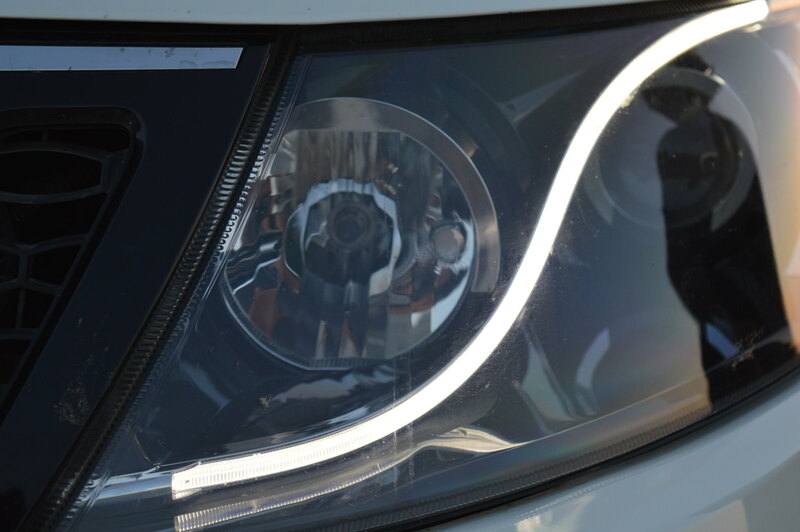 A better throw of light was expected and at this moment I did feel the need to upgrade the stock headlamps. 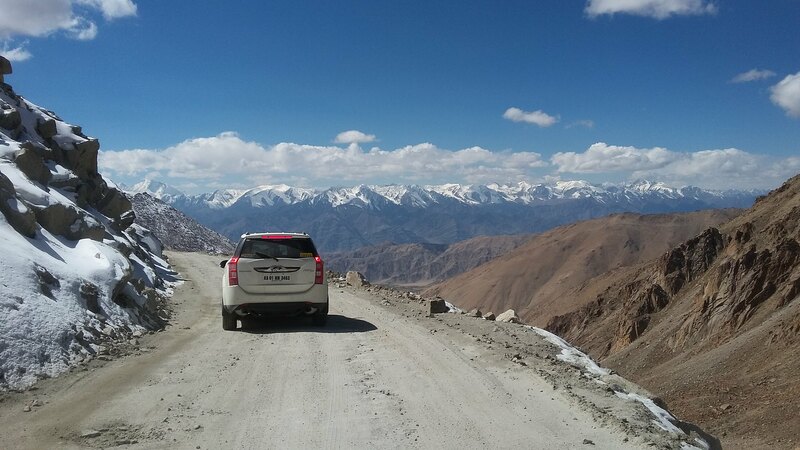 Stopping even for a minute wasn’t sensible as the roads were narrow and neither safe. Somewhere mid way through the journey we passed-by an on-coming santro. 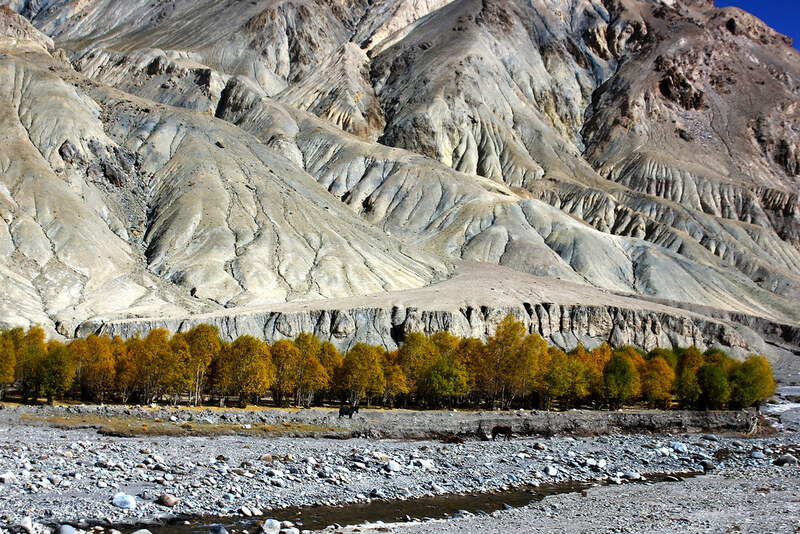 Reached Keylong at 2 AM and hopped into a hotel. 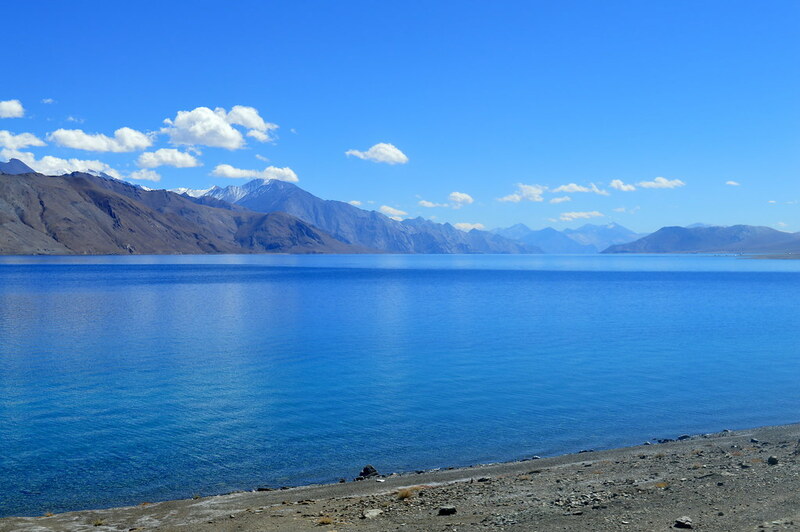 This was one of the most scenic drives. We left Keylong around 8 AM. 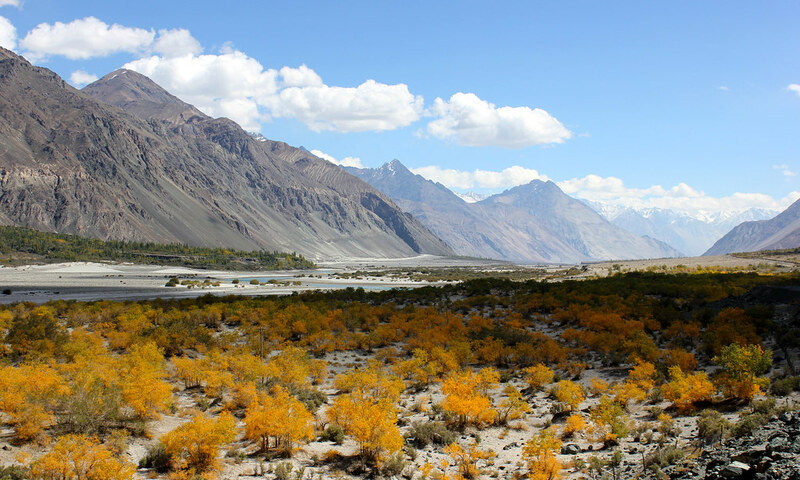 The drive passes though scenic vegetable farms between the mountains, Yellow trees, beautiful hair-pin bends as you approach Manali. 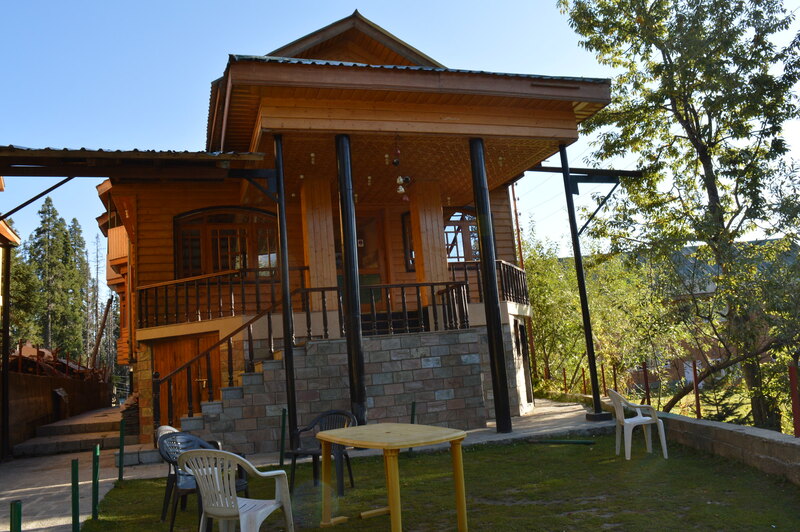 Had lunch at a restaurant in Mall Road, Manali and later checked-in to Tree Hill cottage. 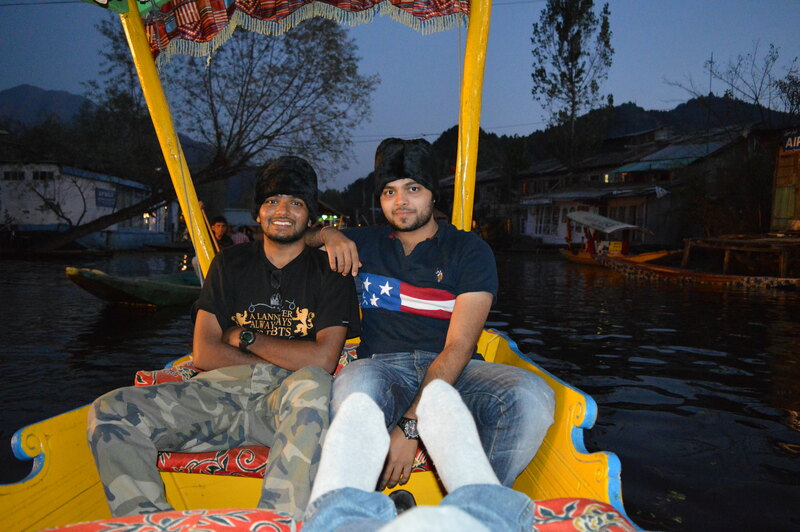 Went to Mall road for some shopping and later visited old Manali and it turned to be such a happening place. 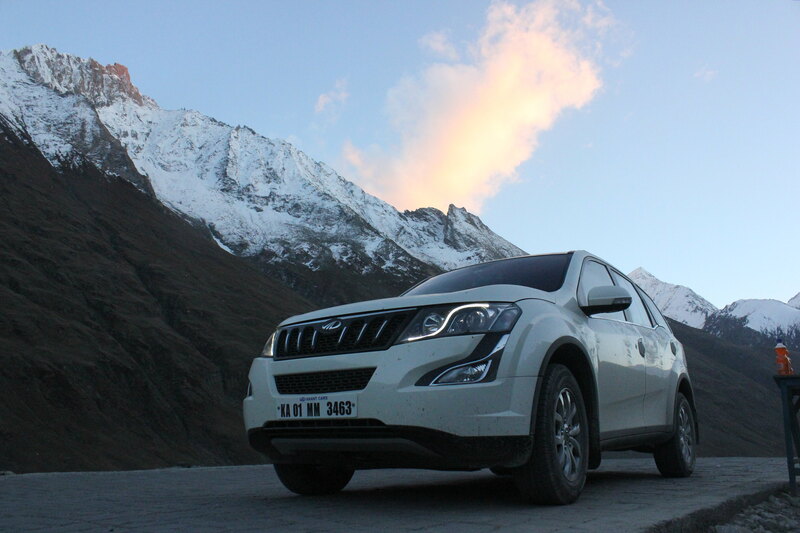 This being our second time in Manali in less than 2 years, It was more of a stop-over in the trip. One of the top most priorities was to change the sump guard. Called up the Service centre at Chandigarh but it wasn’t available. So, I thought of replacing it after reaching Delhi. 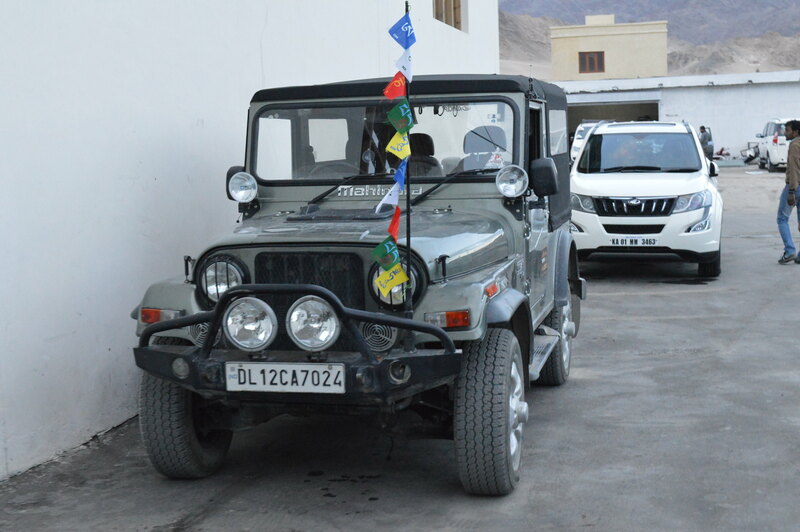 I was driving through towns of Himachal when I crossed Mandi which had several new car showrooms of key manufacturers including Renault. 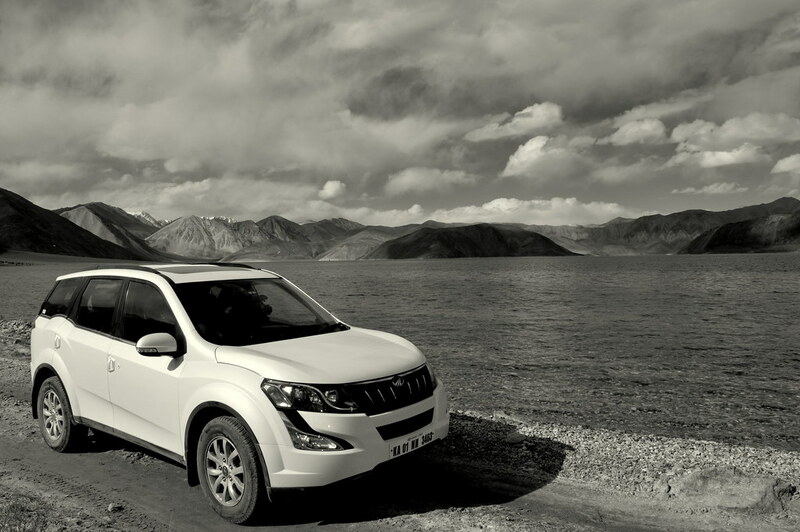 I came across Mahindra Service center and upon enquiring I was told that the part is available. Got a quick fix in 30 min and it costed 2300/-. 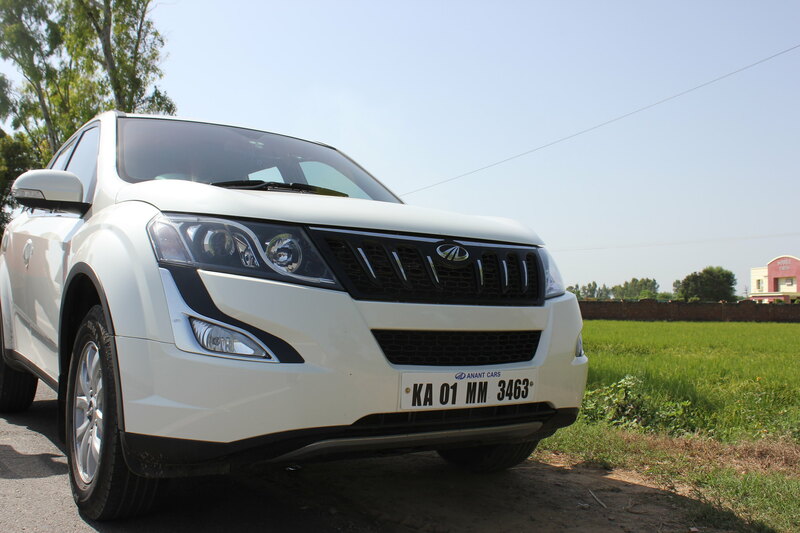 Proceeded to Delhi via Chandigarh. That moment when you realize that the half-cooked food that you ate 2 days ago has started to take a toll on you. Next thing to do? Visit a doctor. Doc : It looks like a case of food poisoning, are you from Delhi? Me : No sir, Bangalore. Doc : Don’t worry, you would be fine before you leave for Bangalore. By the way, When do you plan to leave? Kitne baje ka flight hai? Doc : Oh, Karnataka express? (continues) Be careful with the food in the train. Avoid it if you can. Me: Actually the thing is I would be driving down to Bangalore, Today, NOW!! 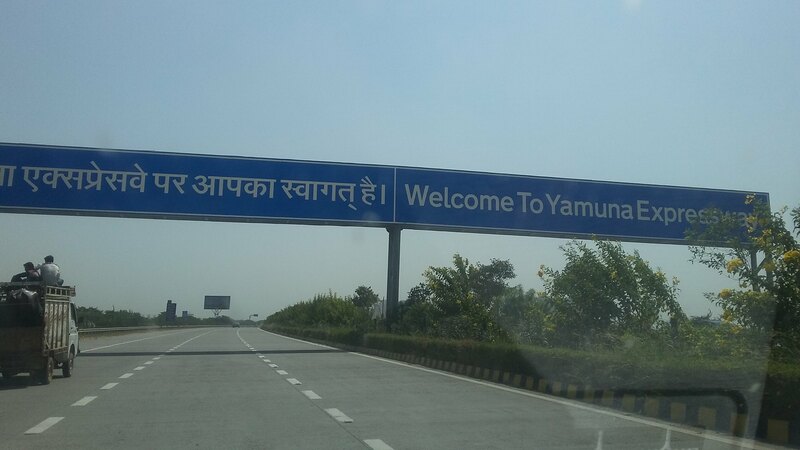 Say “Delhi to Agra” and Probably, Yamuna Expressway comes before Taj Mahal to the mind of a petrol-head. 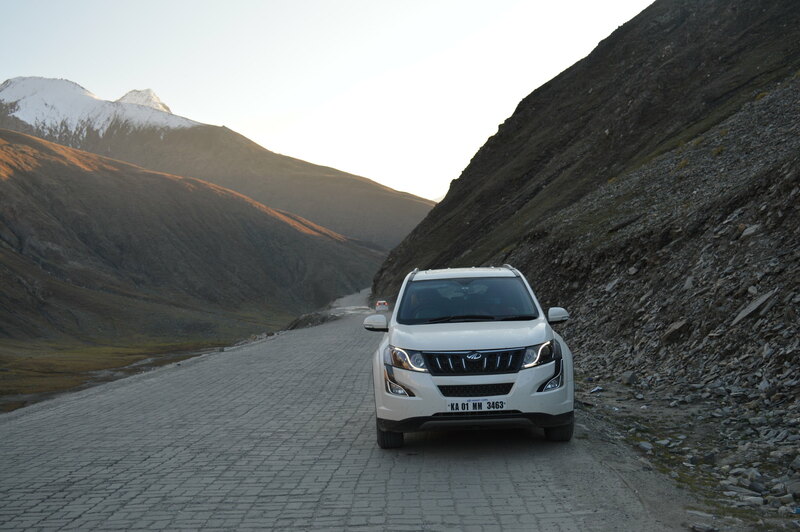 One of the best roads in the country to drive on where you can test the true potential of the machine to its maximum extent. 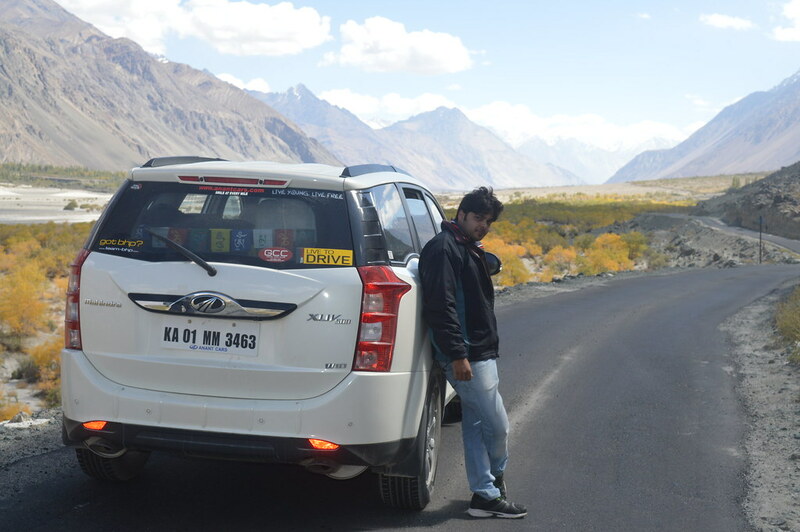 Loved the drive every bit. 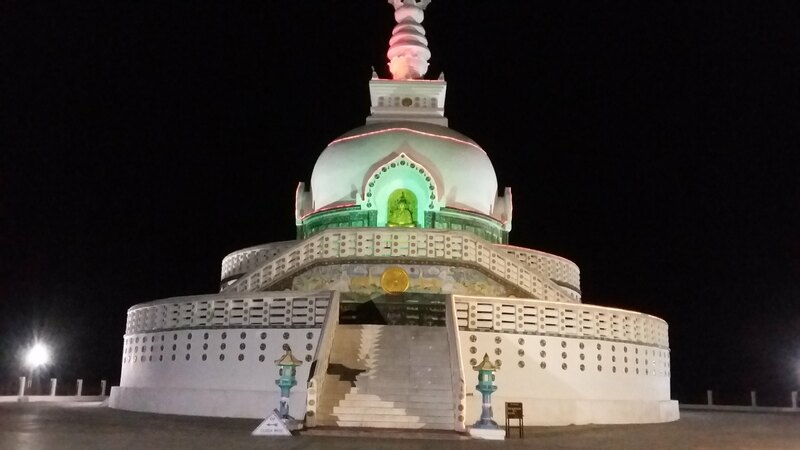 Reached Agra in a “while” and passed by Taj Mahal to continue the journey through Towns of Madhya Pradesh and finally made it to Nagpur by 11 PM. The doctor on duty made sure I get the “needling” work done with 2 bottles of glucose in addition. Was discharged from the hospital at 2PM. When asked for the fee I was told it’s free! 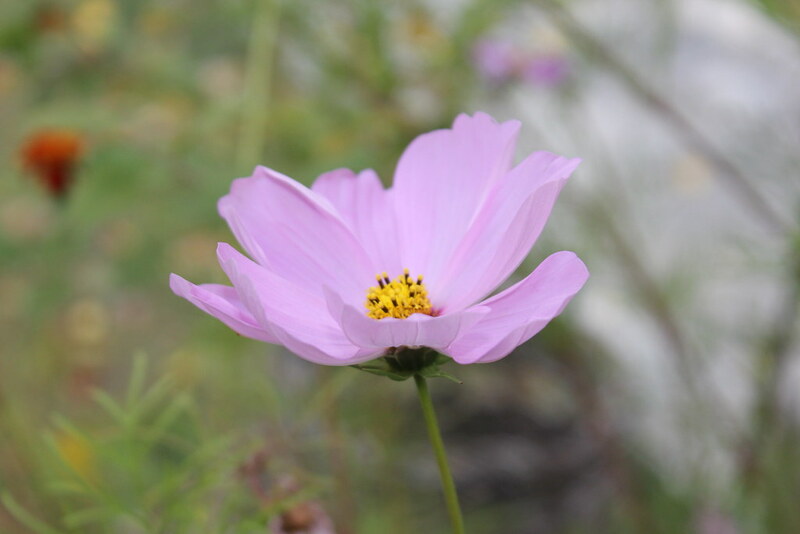 With a complementary lunch  by 3PM I was back on the steering wheel as the road was too hard to resist and certainly, I was back to normal after the excellent medication. Butter smooth road upto Hyderabad. Reached Paradise hotel at 11PM. 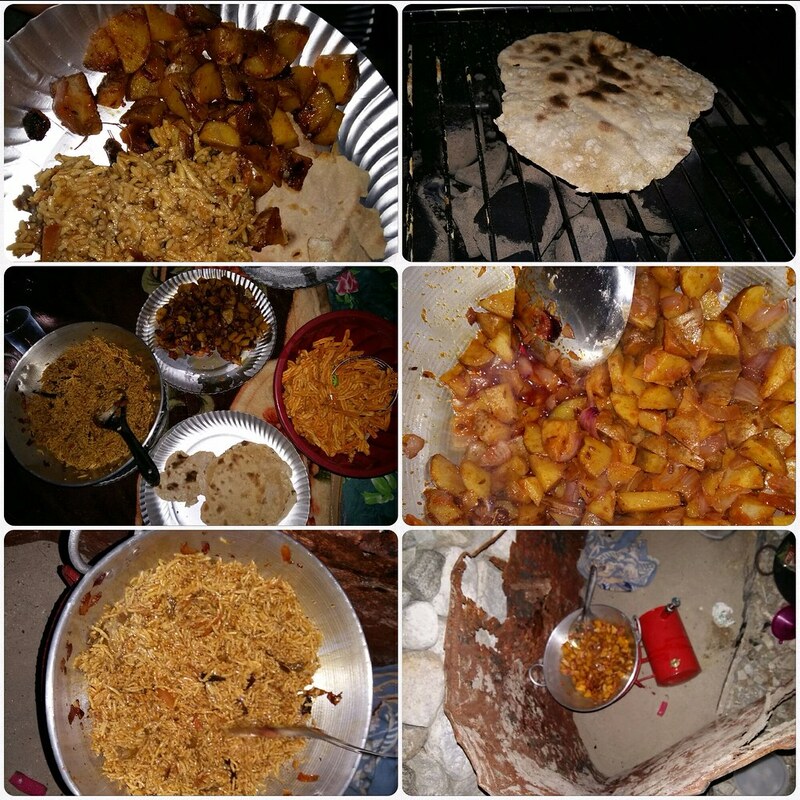 After a long day and hospital melodrama it was time for some yummy Biryani! Left Hyderabad at 12:30AM. Technically this comes under the next day but there was no stoppage for the night. Needless to say, this was a breeze. 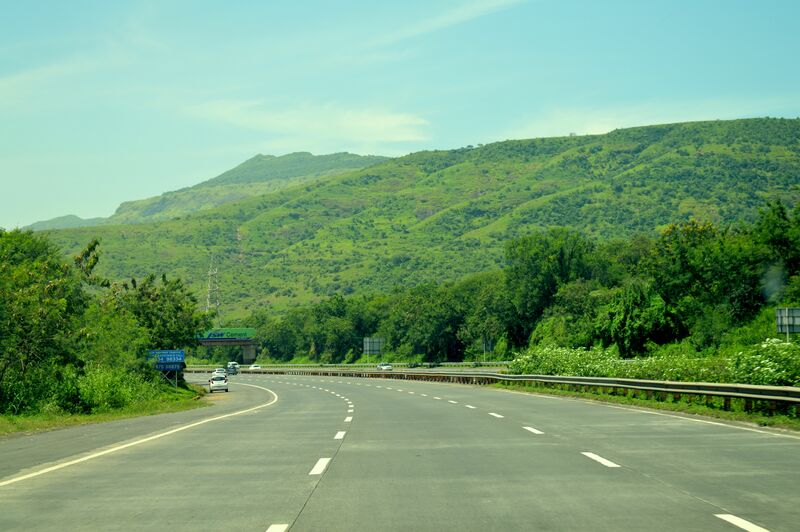 Minimum traffic along with superb roads all the way upto Bangalore. It was 06:30AM when we reached Bangalore International Airport. 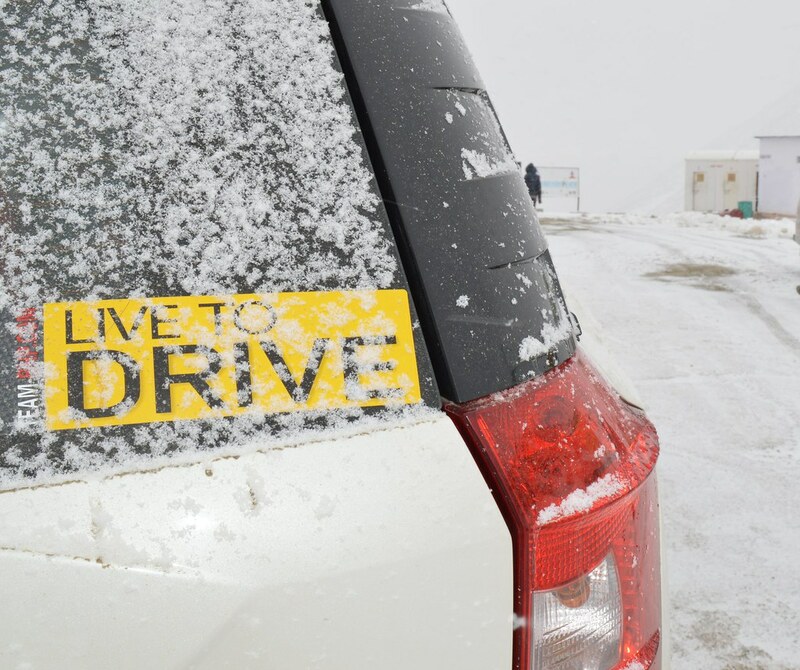 At 8AM, The 17-Day Road Trip came to an end. 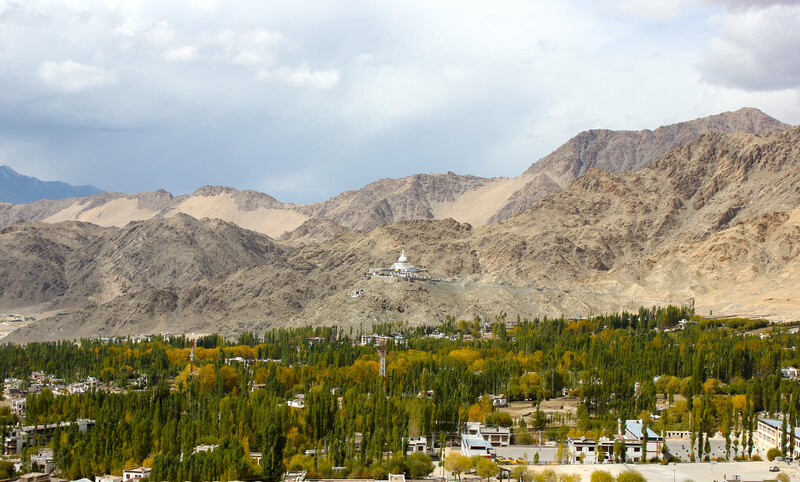 At 23, It was one of the best decisions of my life to explore Ladakh. It was an amazing experience, indeed. 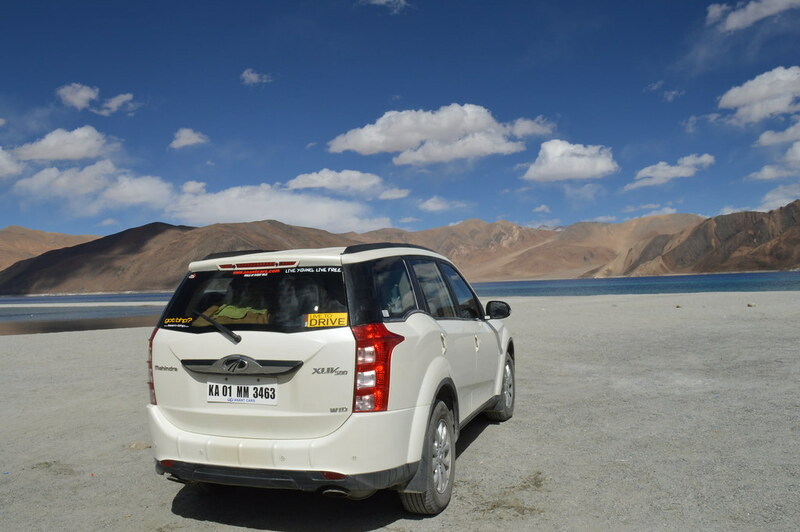 A road trip to Ladakh, should definitely be on every traveler’s bucket list. 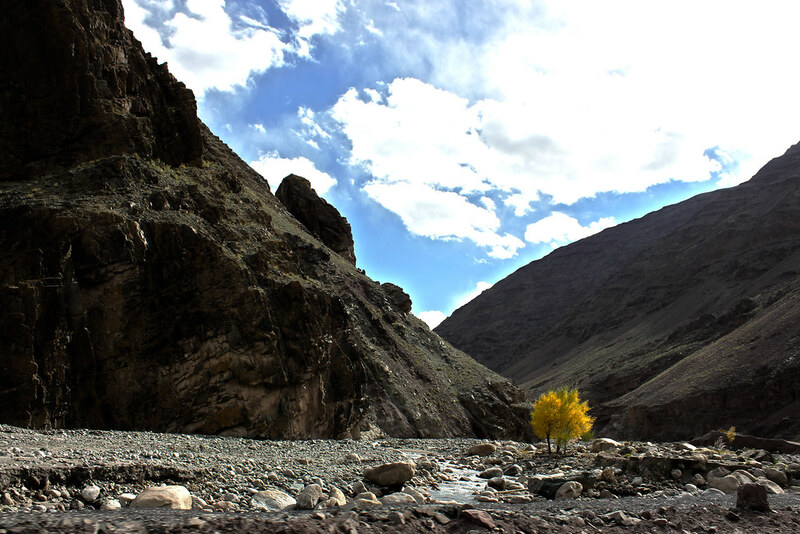 It is very essential to get out of our comfort zones and explore the nature. We get to realize how fortunate we are to have access to the all the comfort creatures. 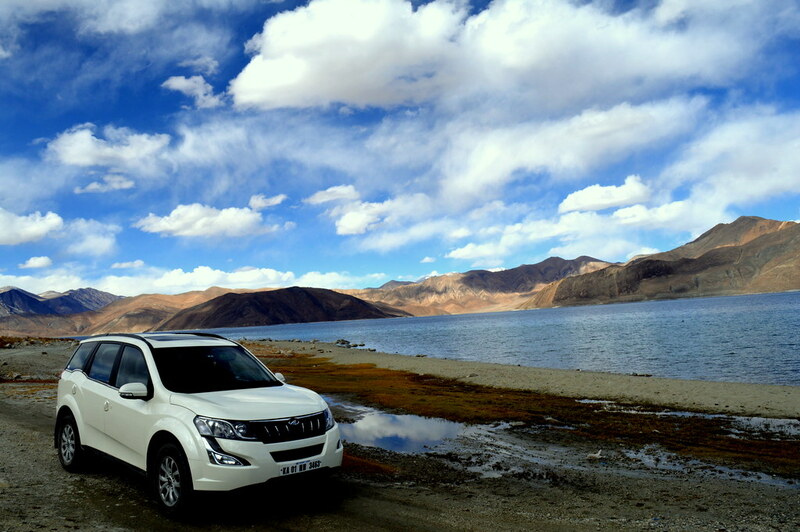 After all, Travel is the only expense that makes you richer! Throw off the bowlines. Sail away from the safe harbor. Catch the trade winds in your sails. Explore. Dream. Discover!!! 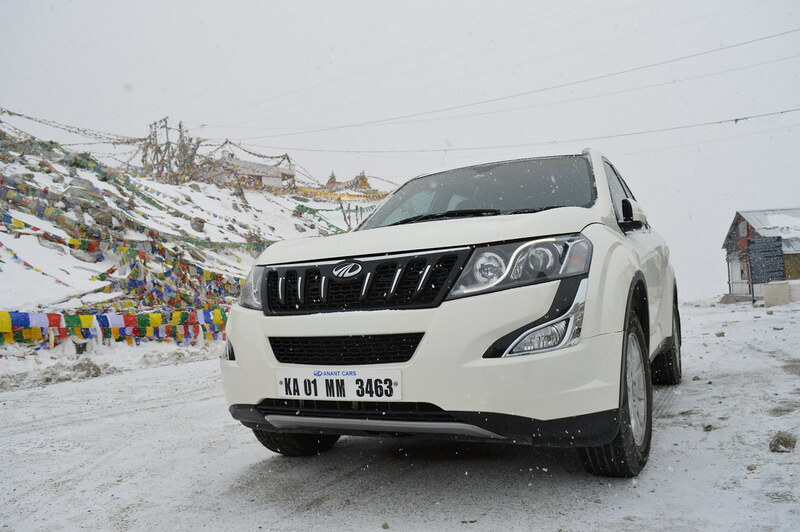 For the potential buyers of XUV, Go ahead and get the Cheetah home! Get the AWD version if you could stretch. 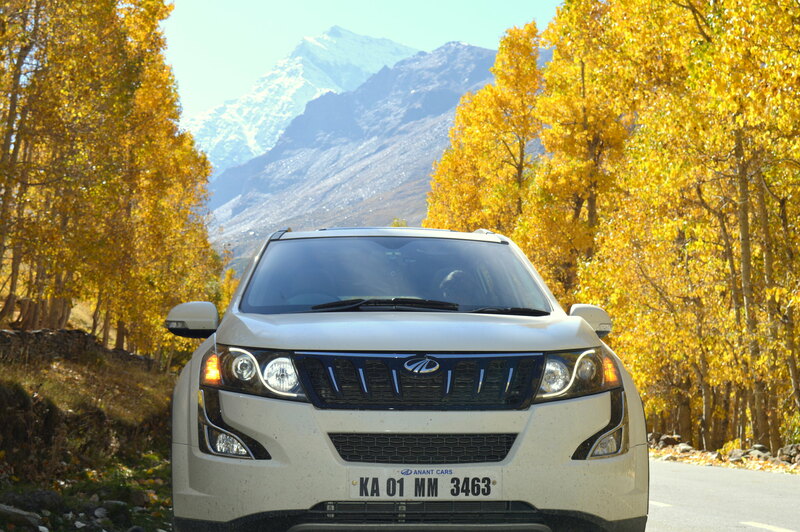 It will bring a smile on your face every time you take it to places where a FWD can only dream of. 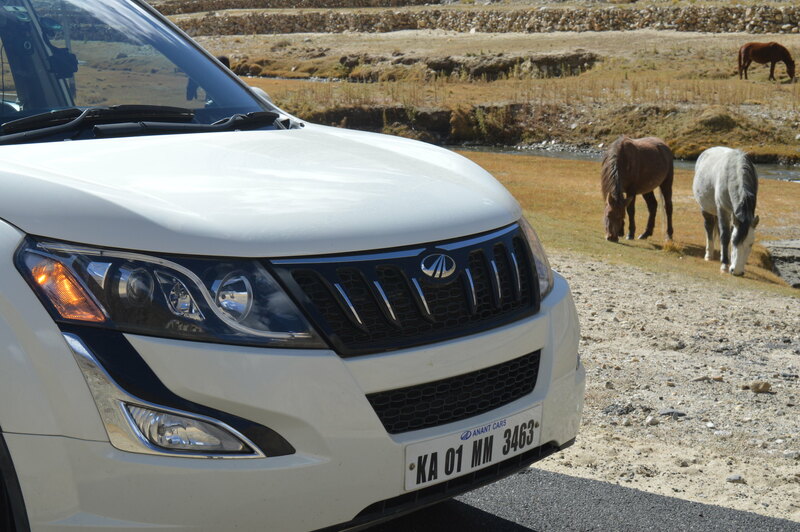 It is a brilliant VFM car and I can proudly tell this after 33,333 Kms of usage in just a year, covering beautiful landscapes from Kashmir to Kanyakumari. I had, and always will, salute the courage of our soldiers who have sacrificed their today for our tomorrow. Standing at the border, I realized firsthand, the sacrifices made by our brave soldiers who forsake the comforts of home and family life, for a life of hardship and danger, who even embrace death willingly for the sake of our country, so that we can sleep peacefully every night.